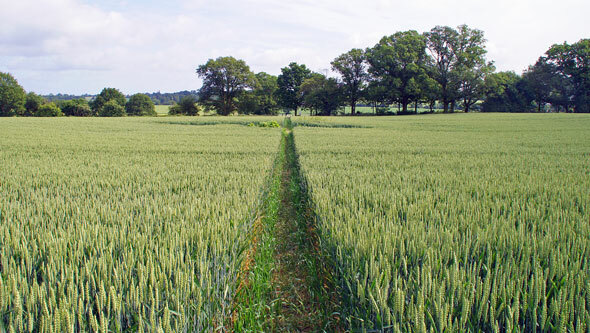 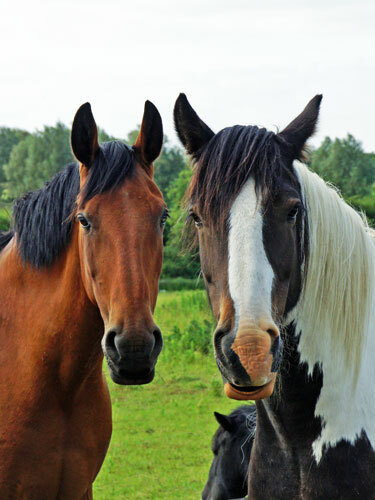 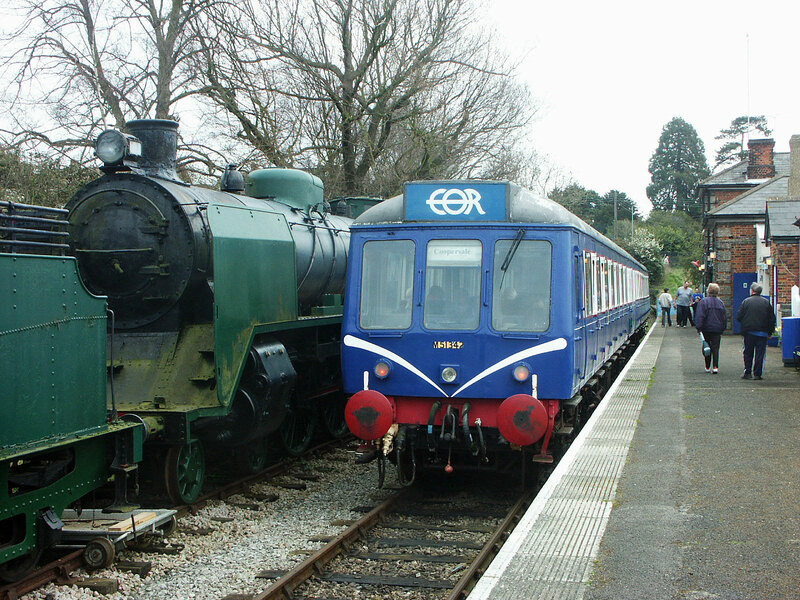 The Epping-Ongar Railway is a preserved branch line in Essex. 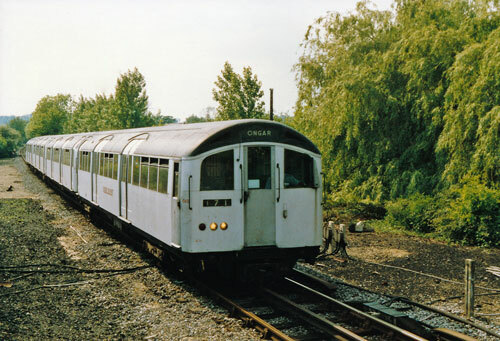 The railway was part of a 10km stretch at the end of the Great Eastern, latterly LNER and London Underground Central Line. 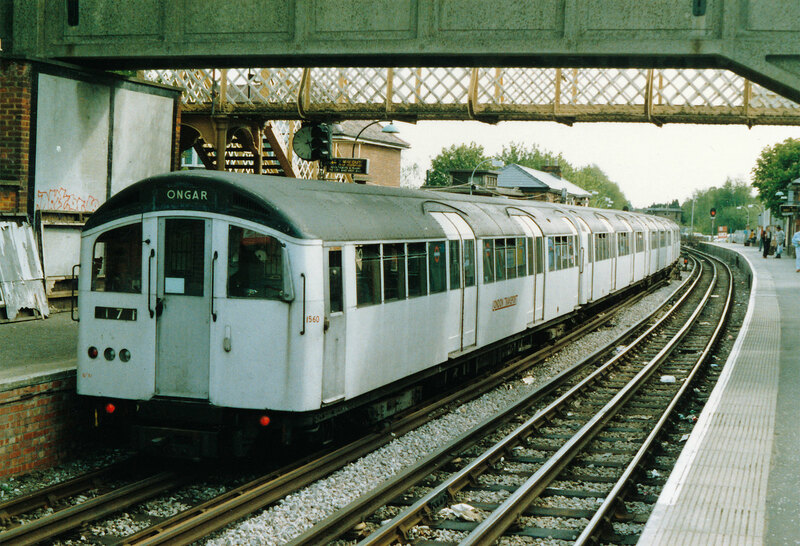 After London Underground suspended passenger services in 1994, the line was preserved as a heritage railway. 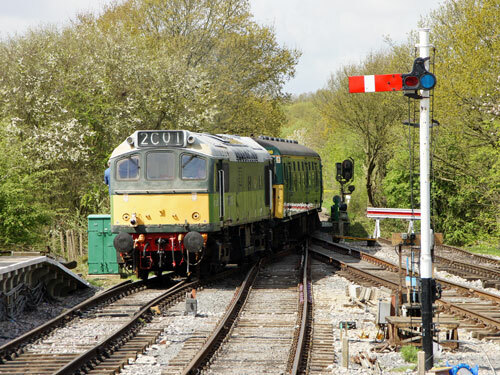 A weekend diesel shuttle service ran from 2004 till 2007, but it was then decided to improve the infrastructure of the line to increase the frequency of trains and to enable locomotives to operate, ensuring the long term future of the line, reopening on 25th May 2012. 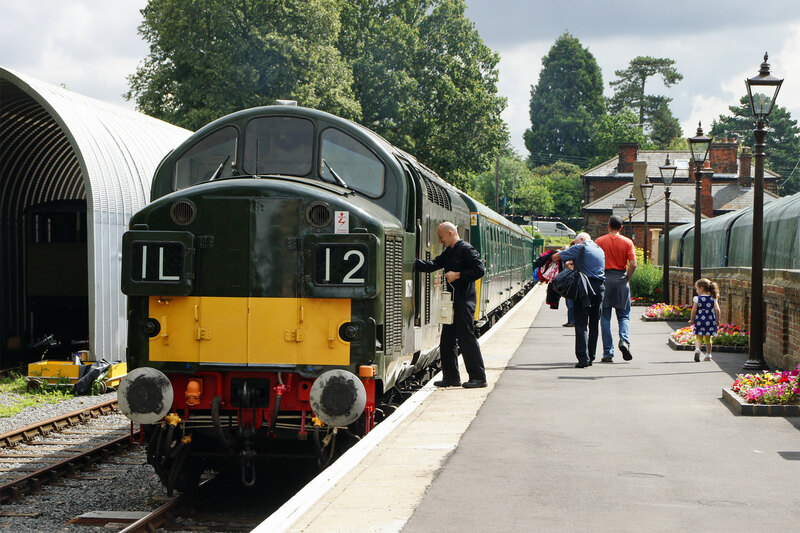 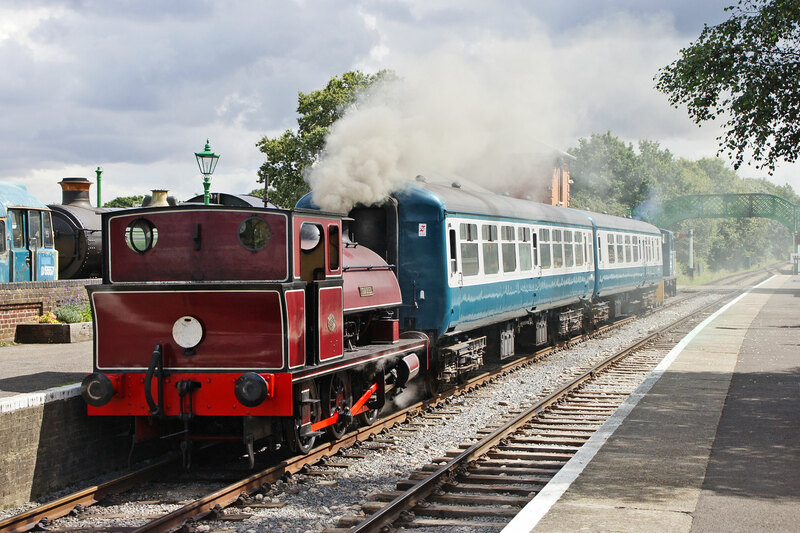 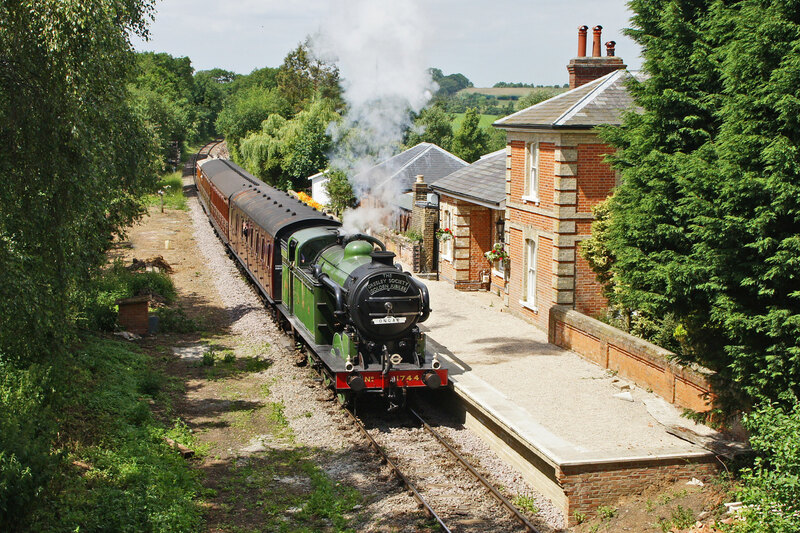 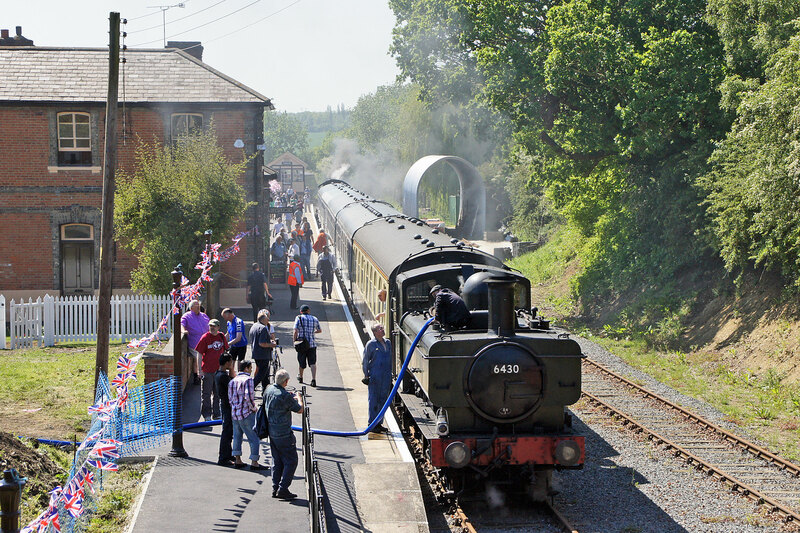 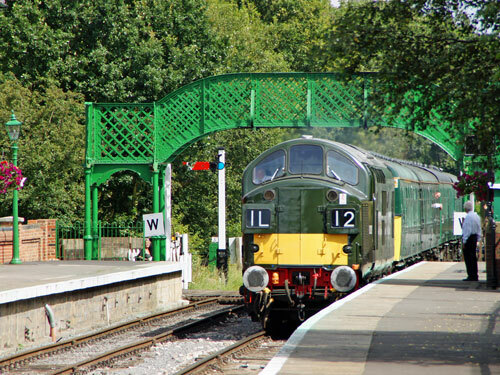 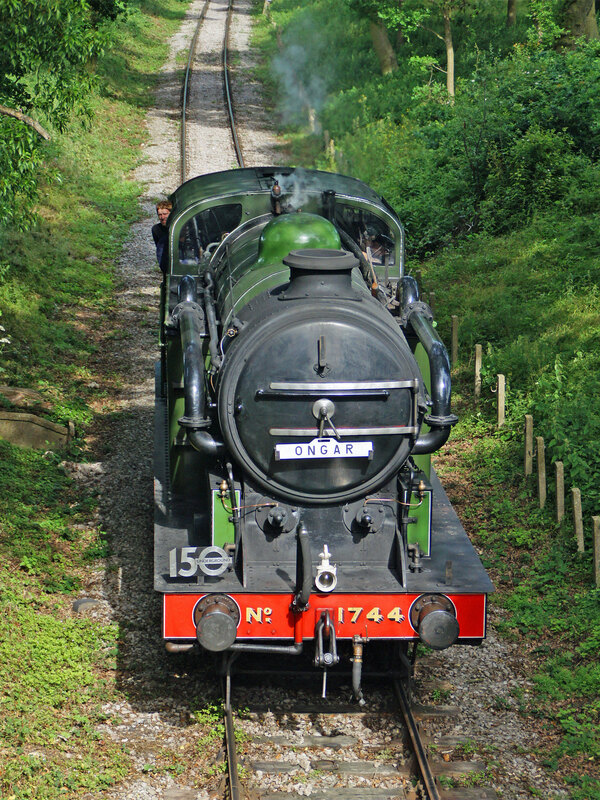 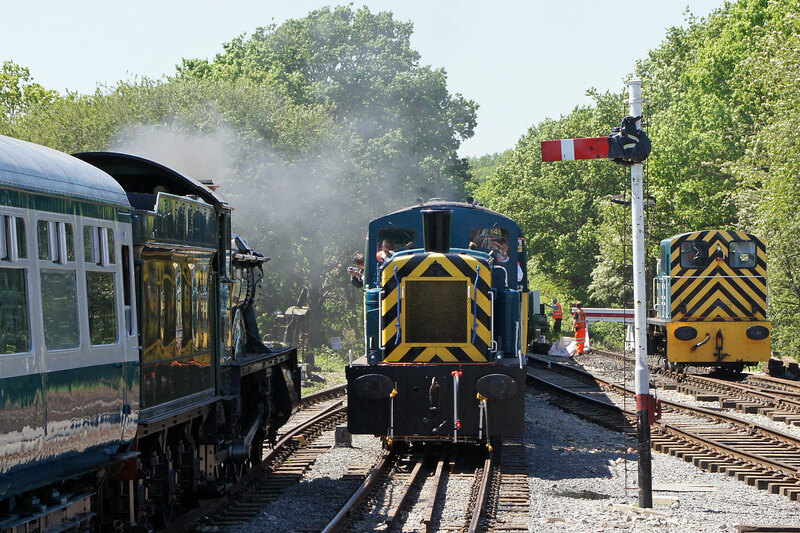 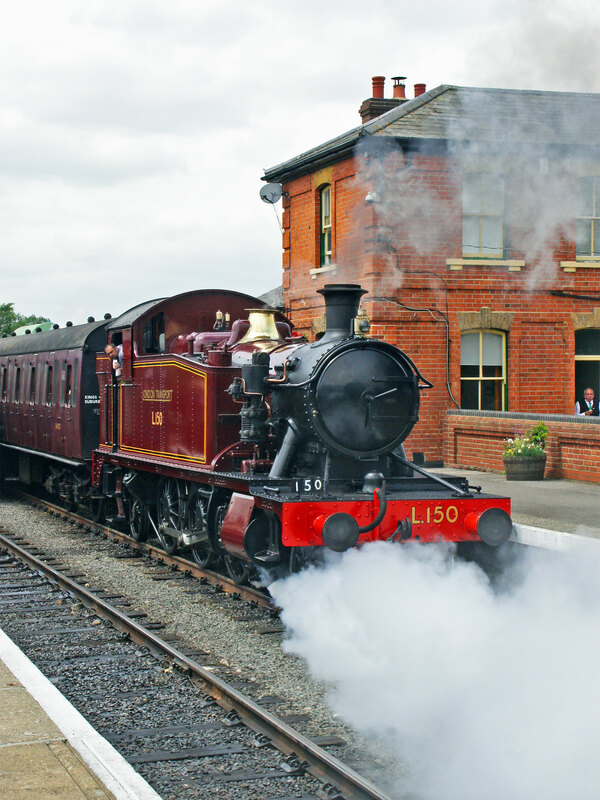 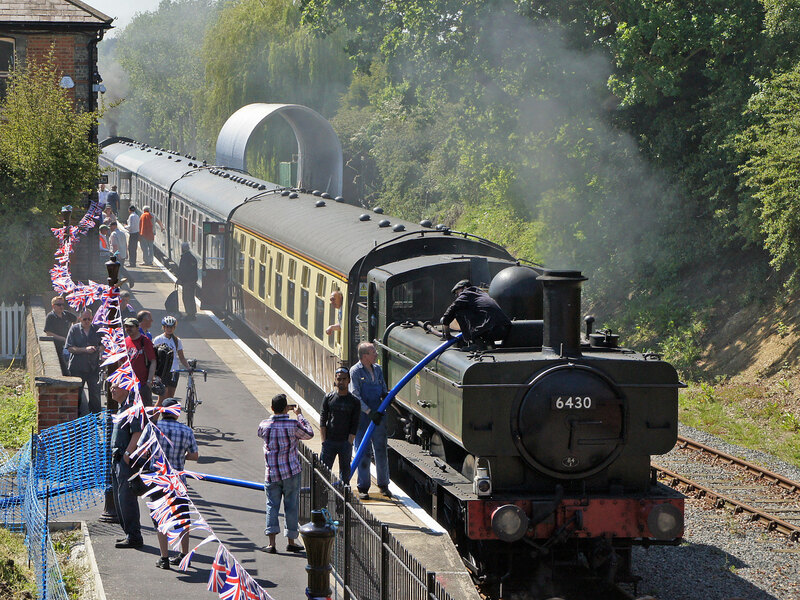 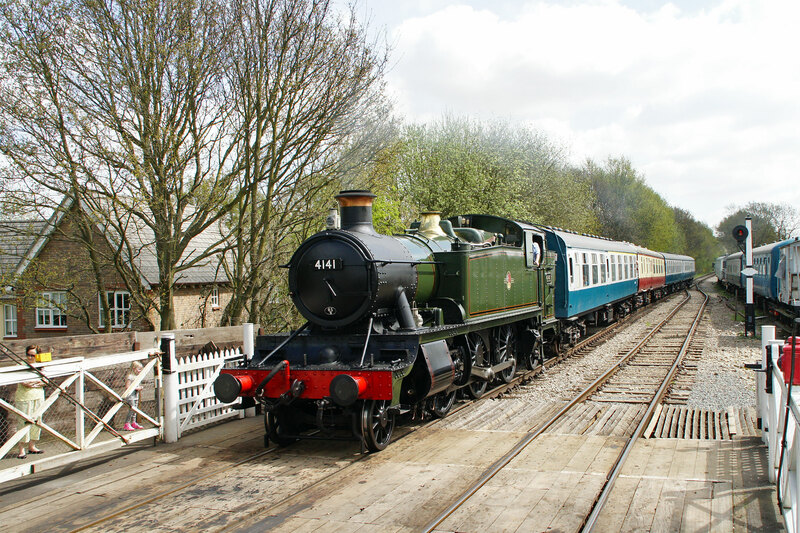 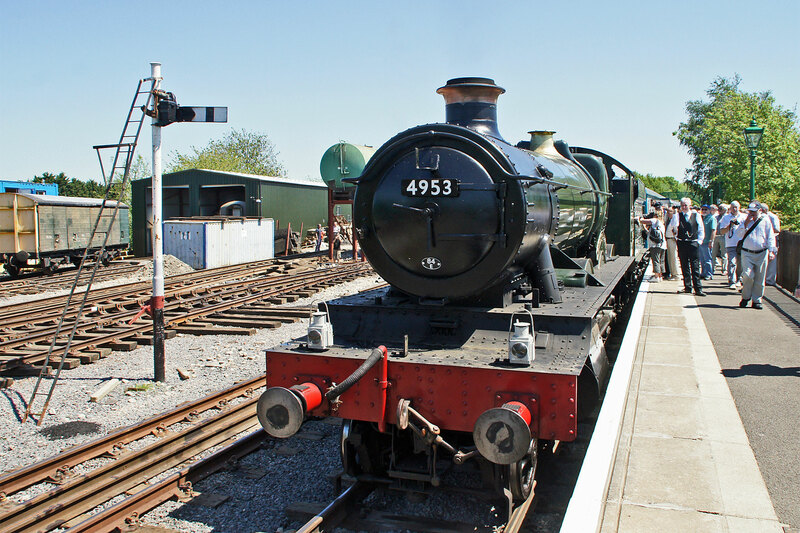 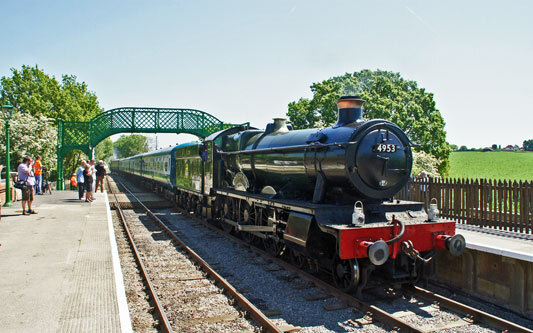 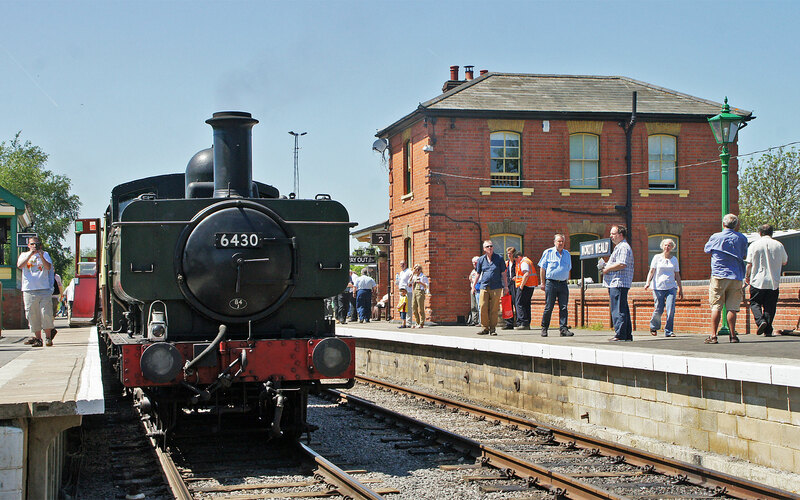 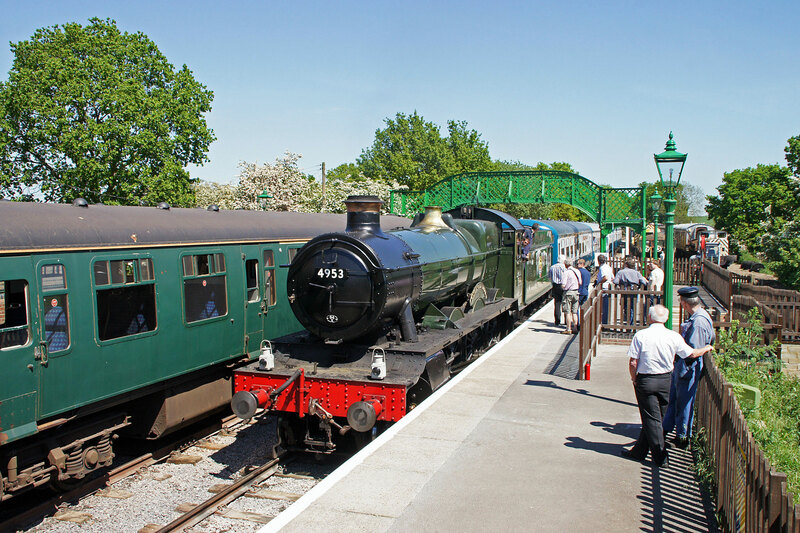 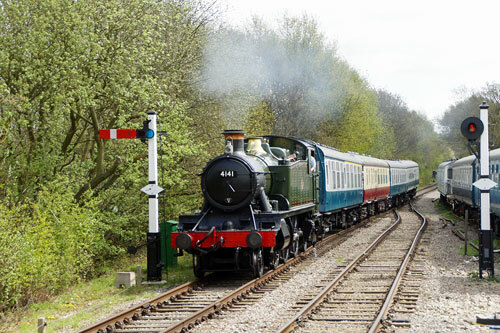 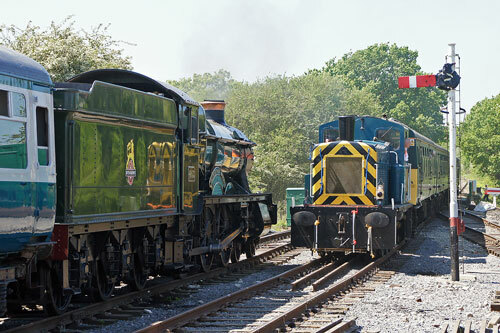 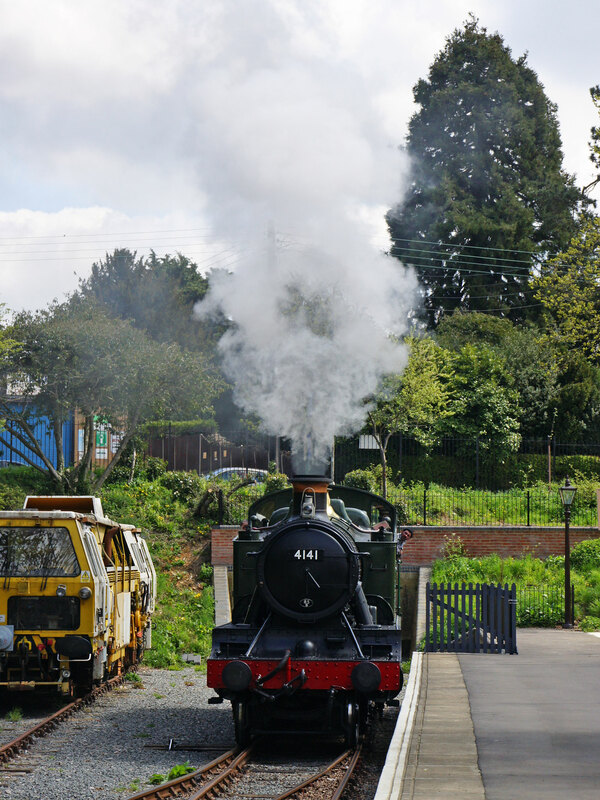 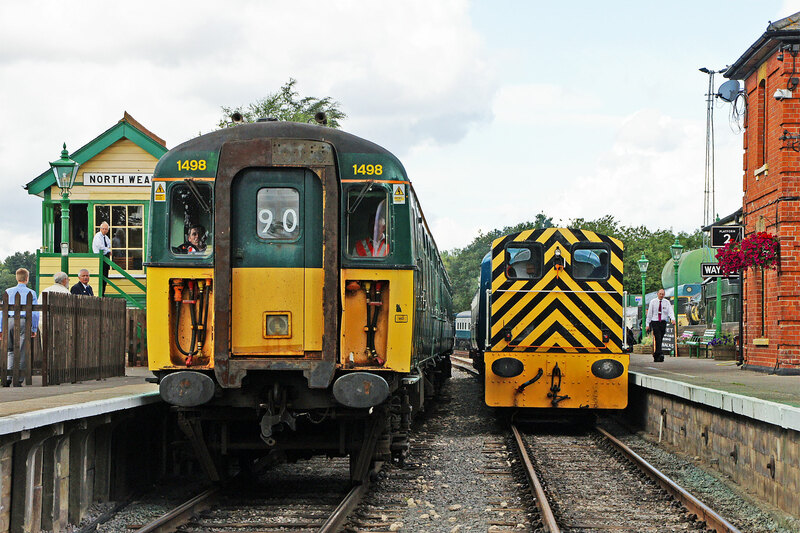 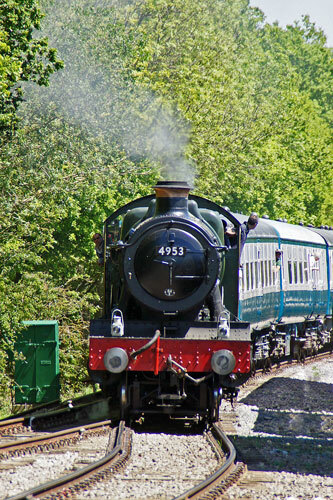 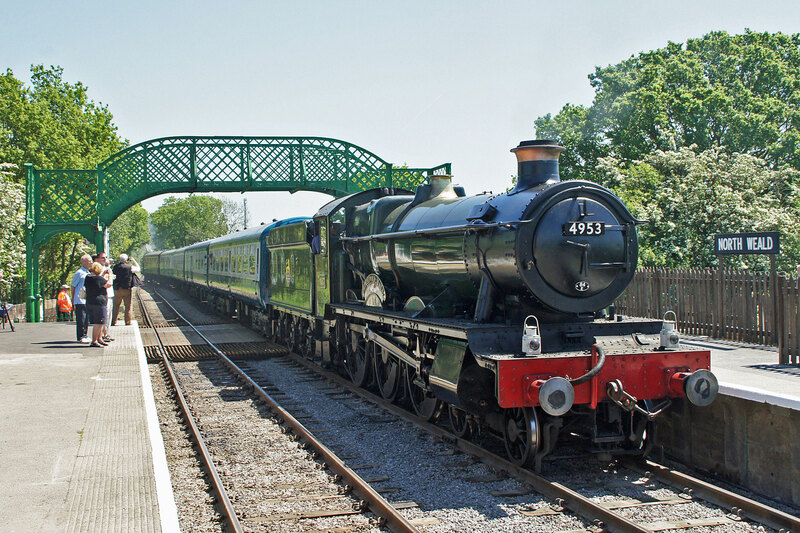 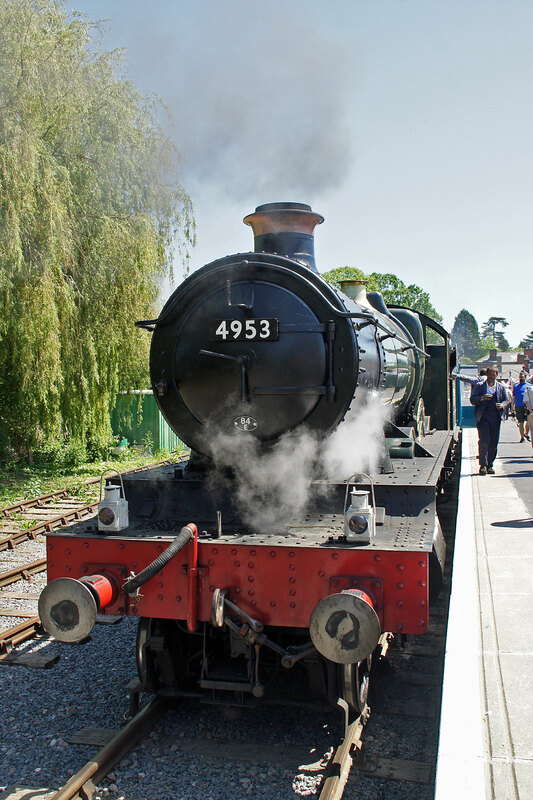 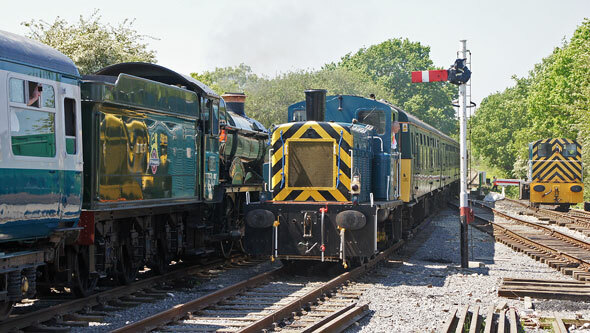 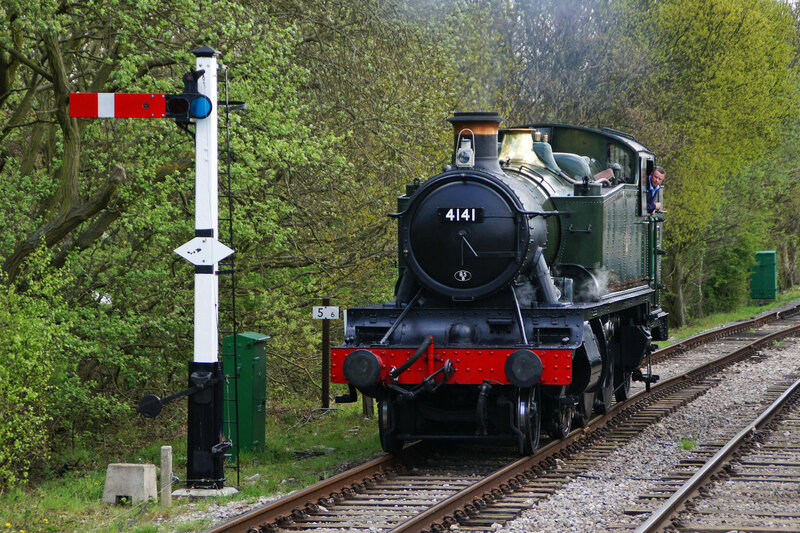 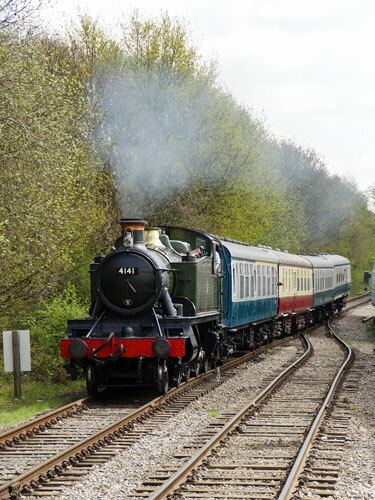 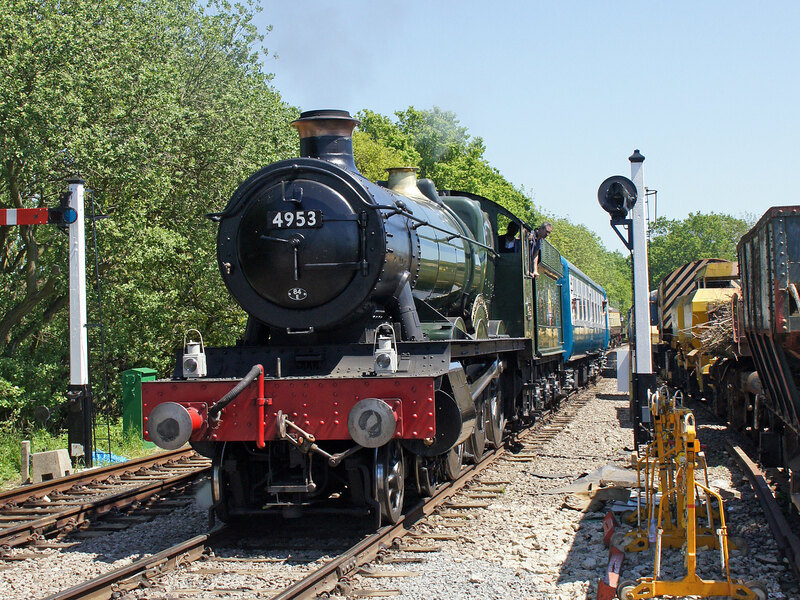 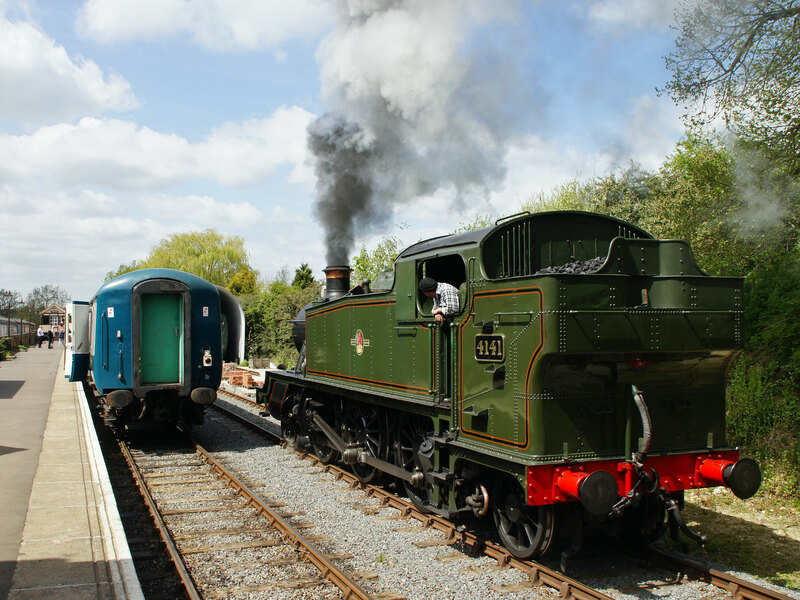 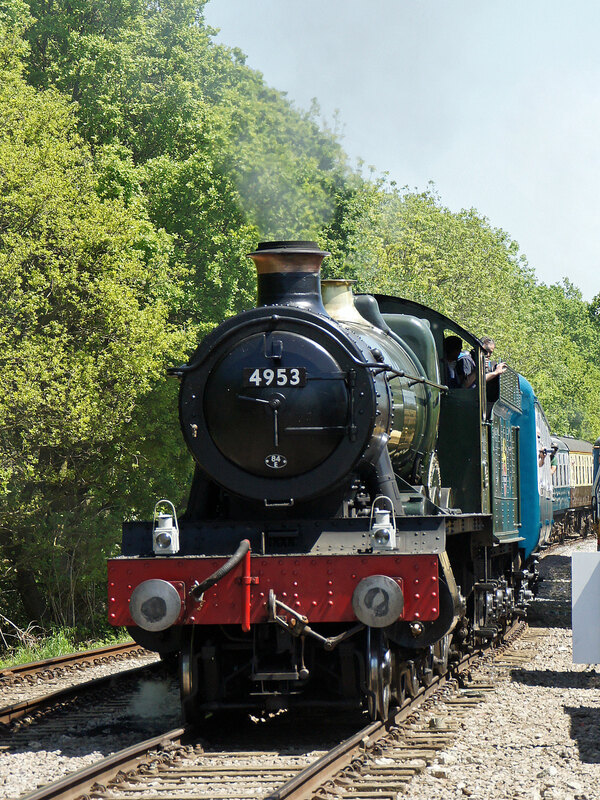 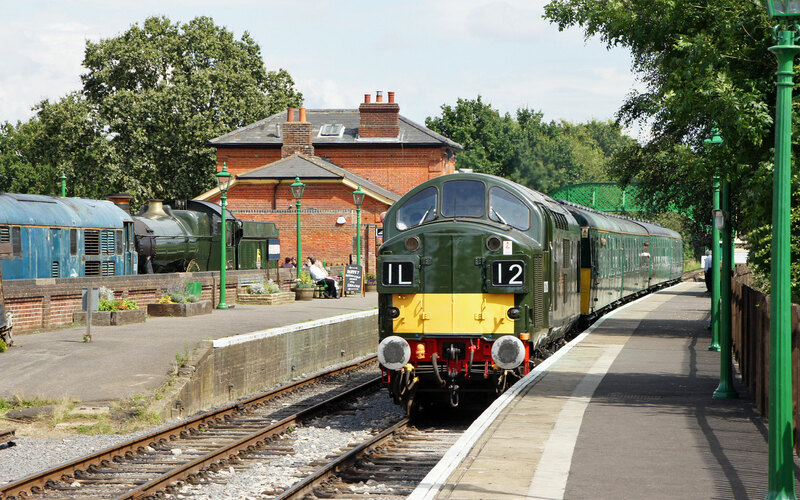 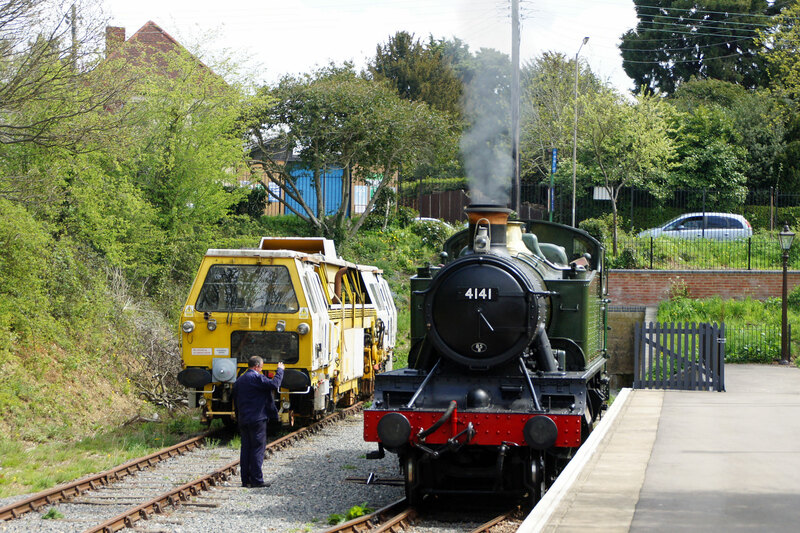 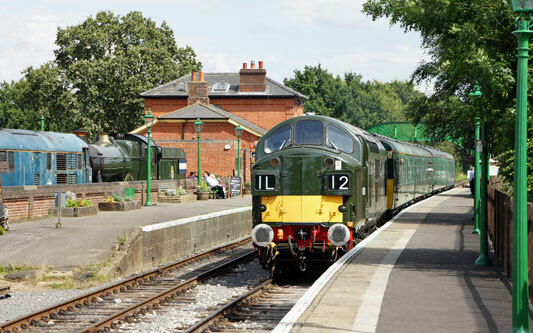 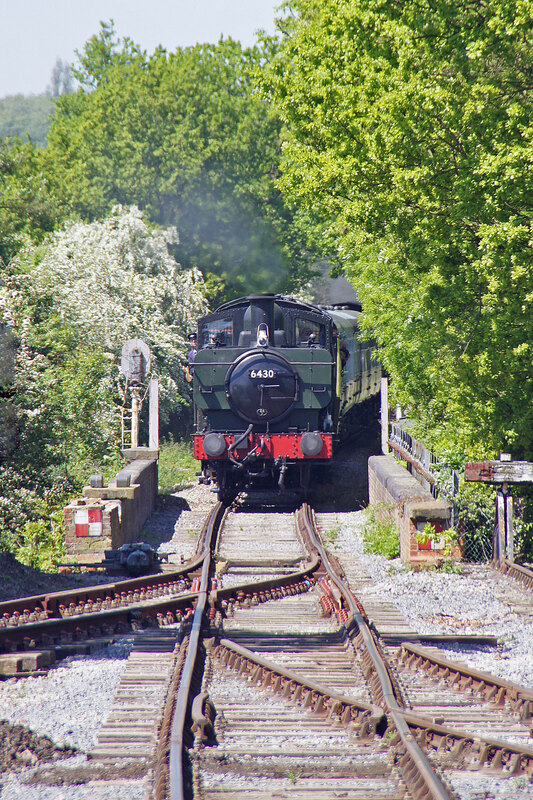 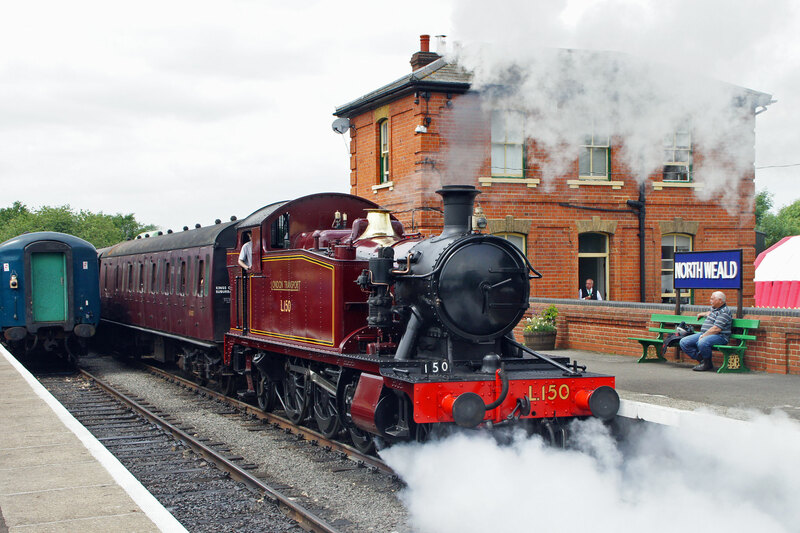 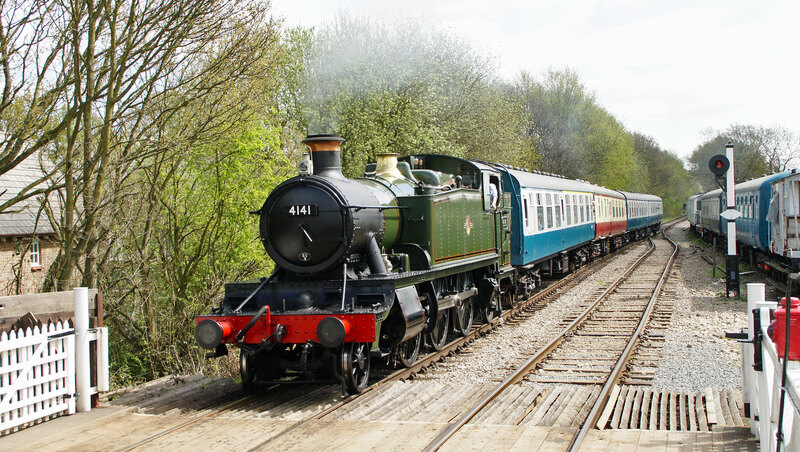 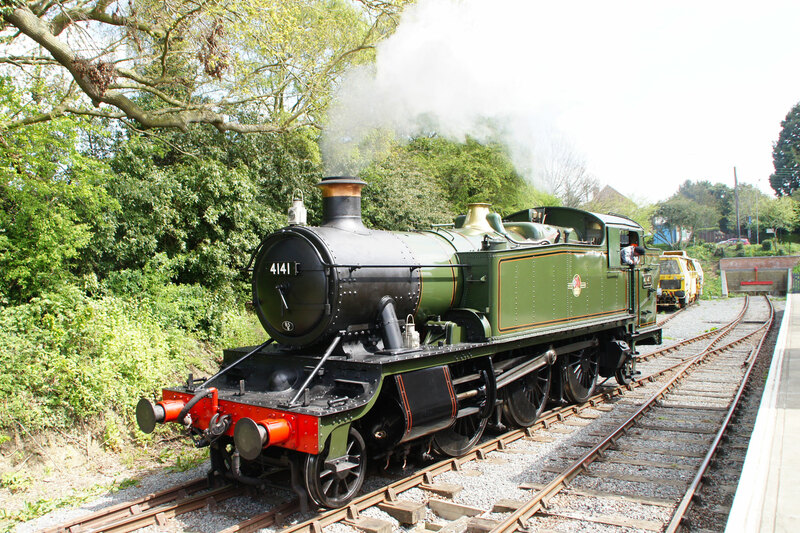 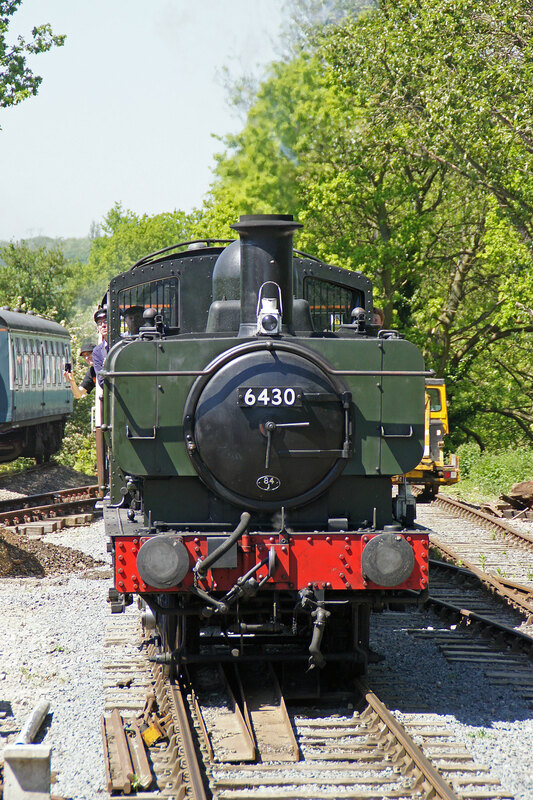 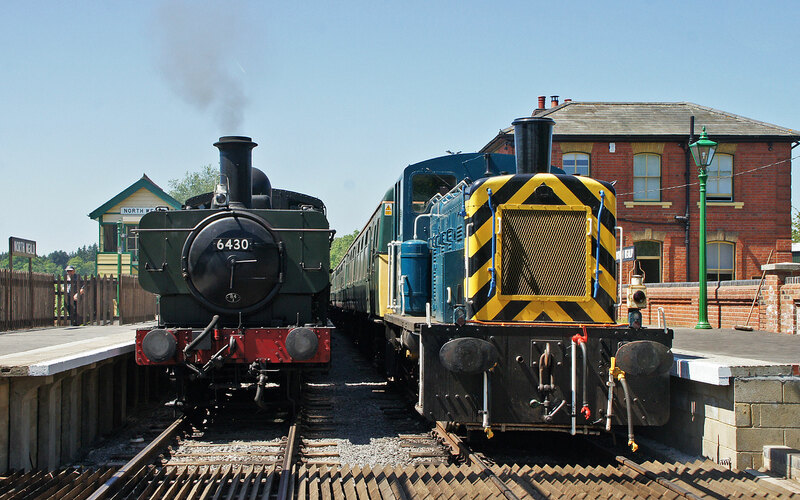 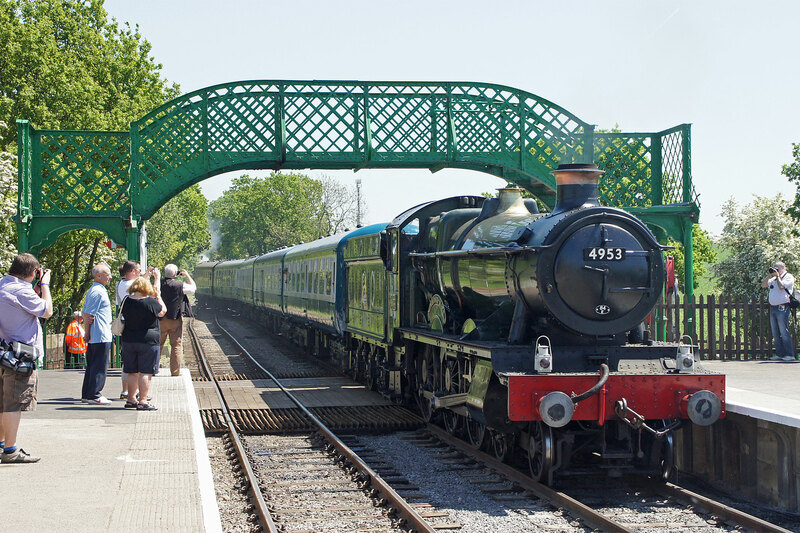 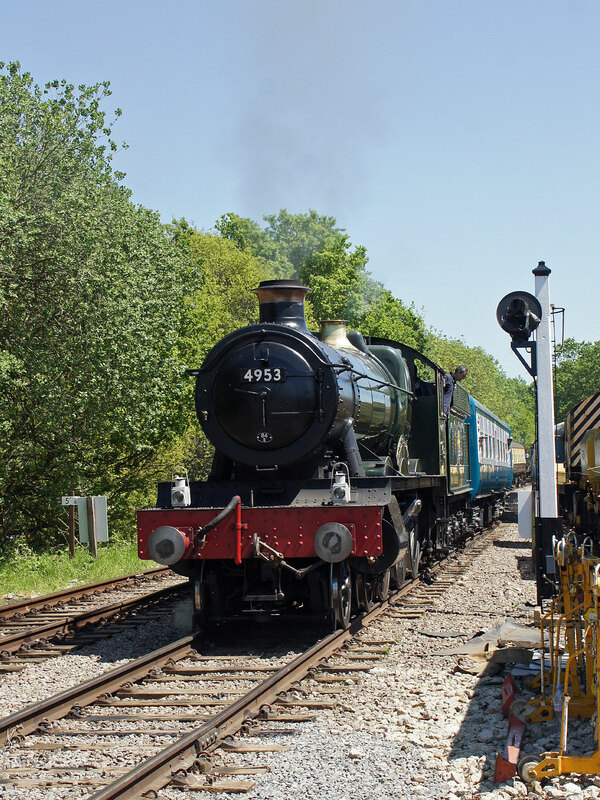 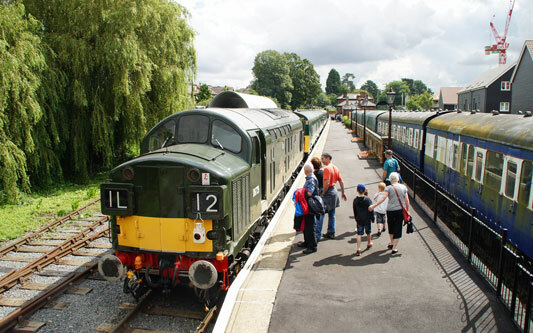 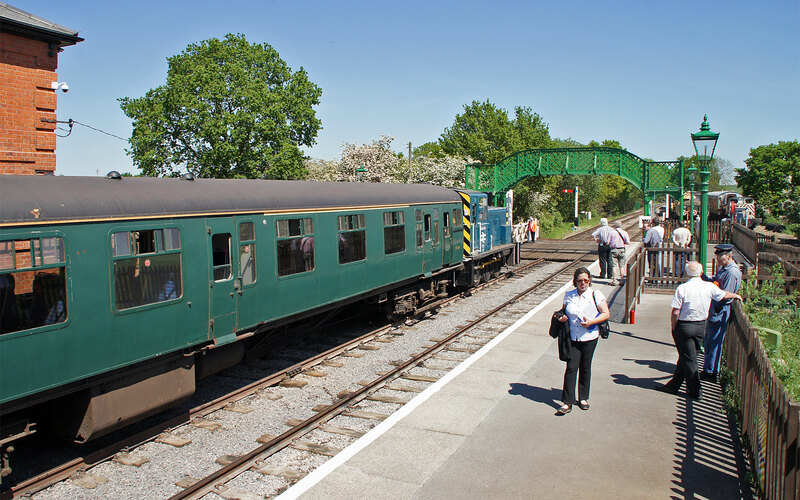 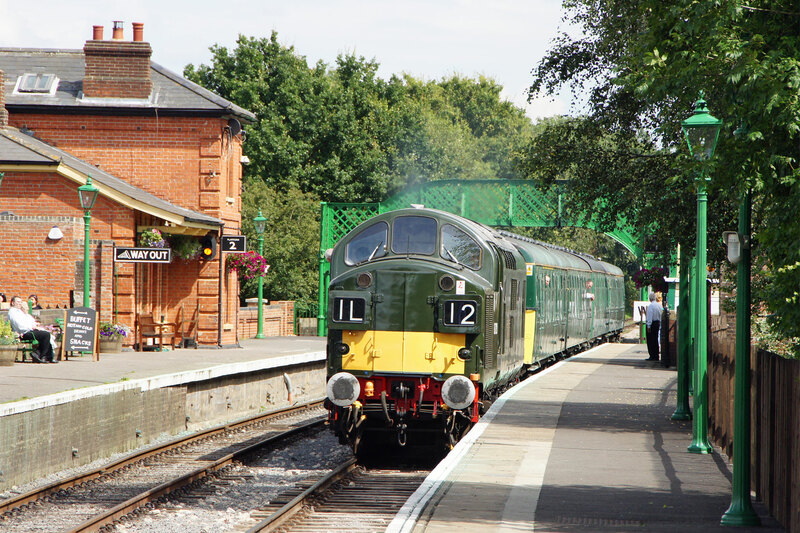 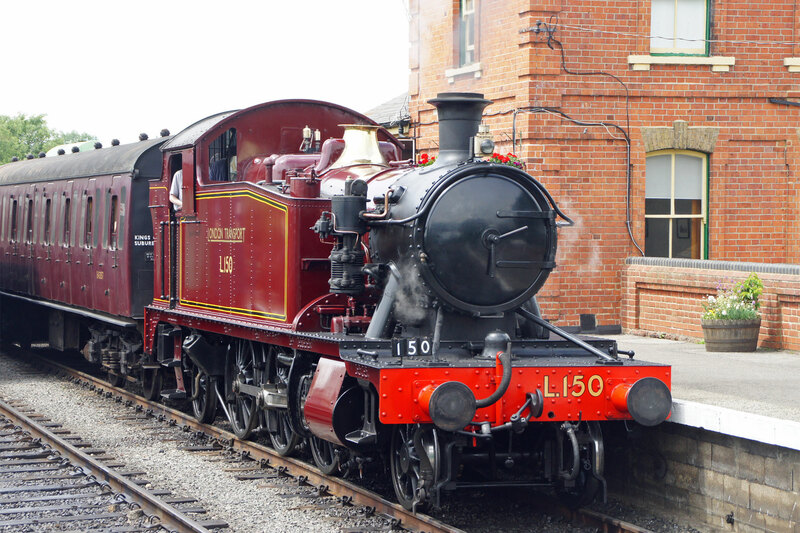 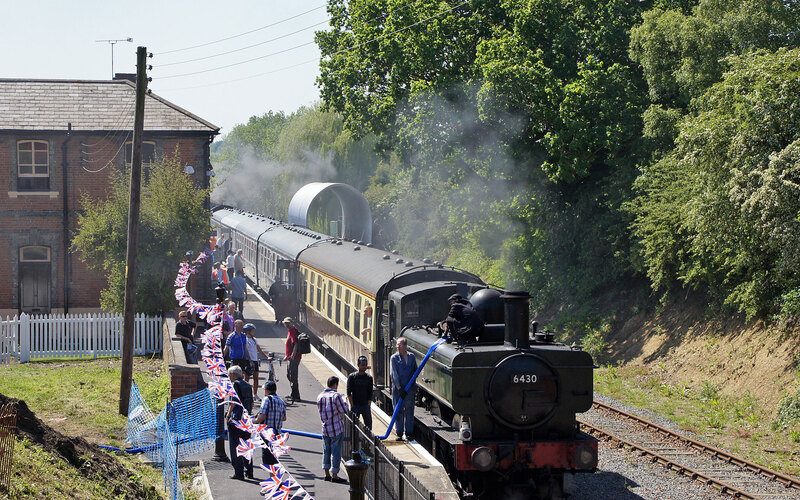 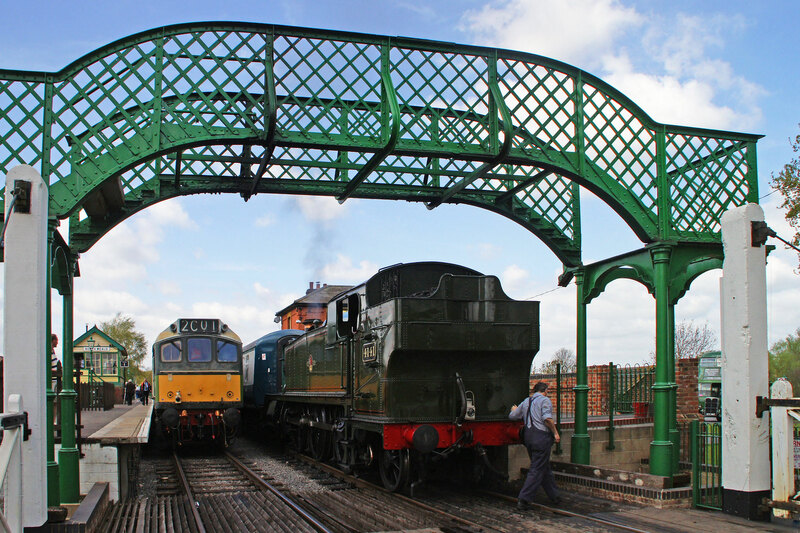 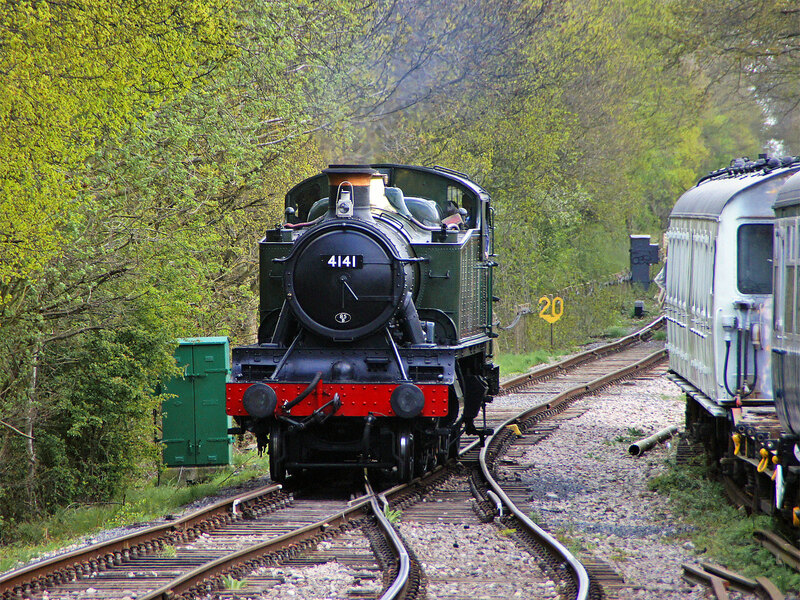 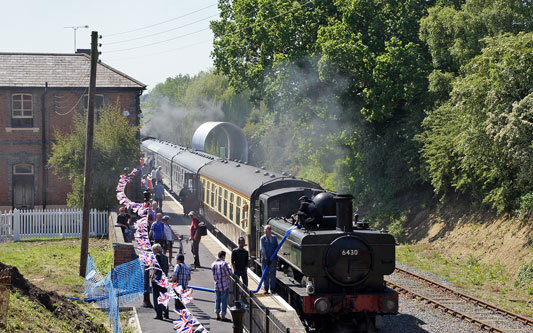 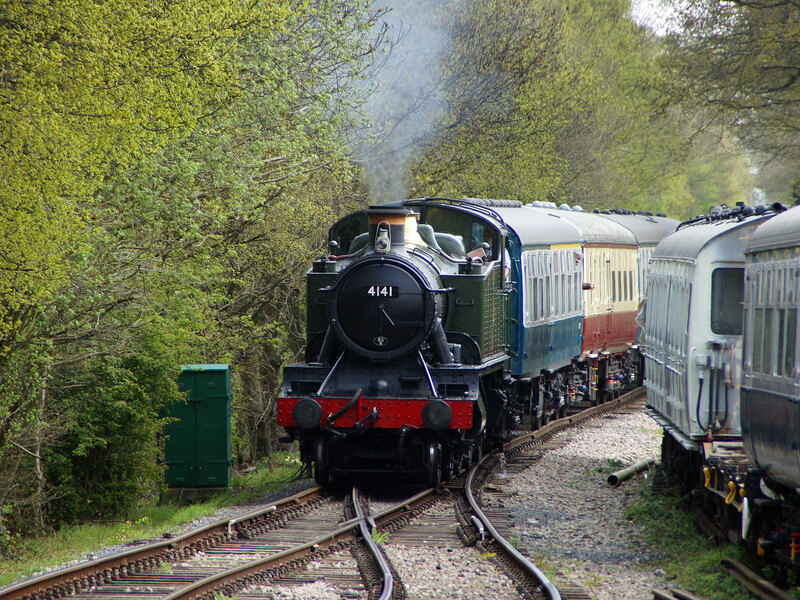 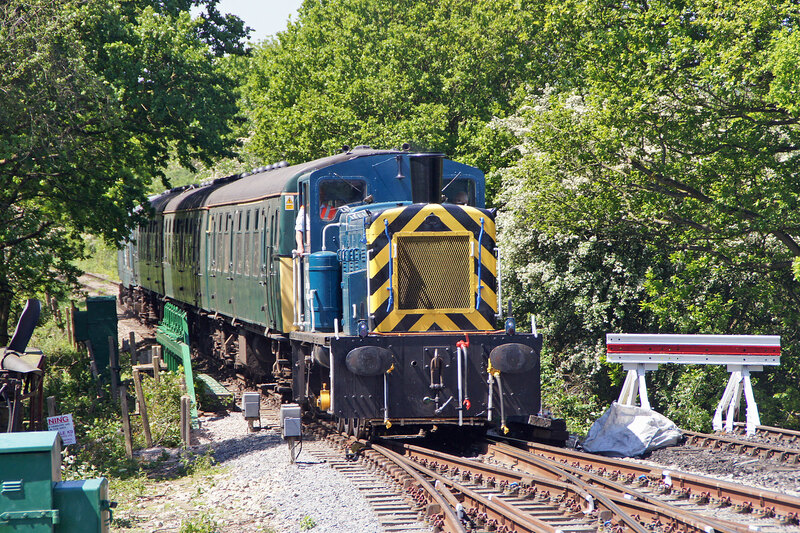 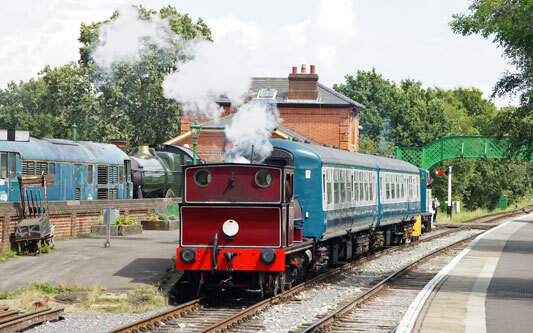 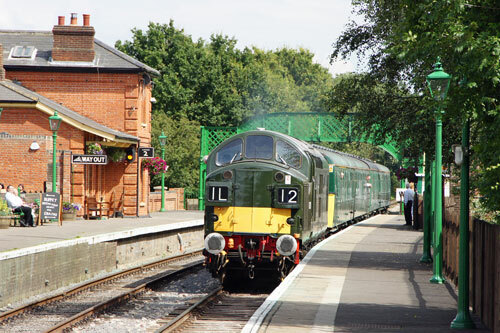 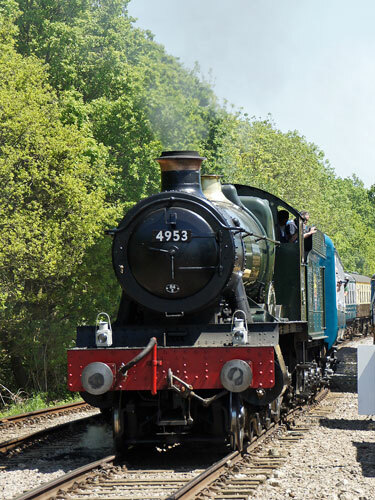 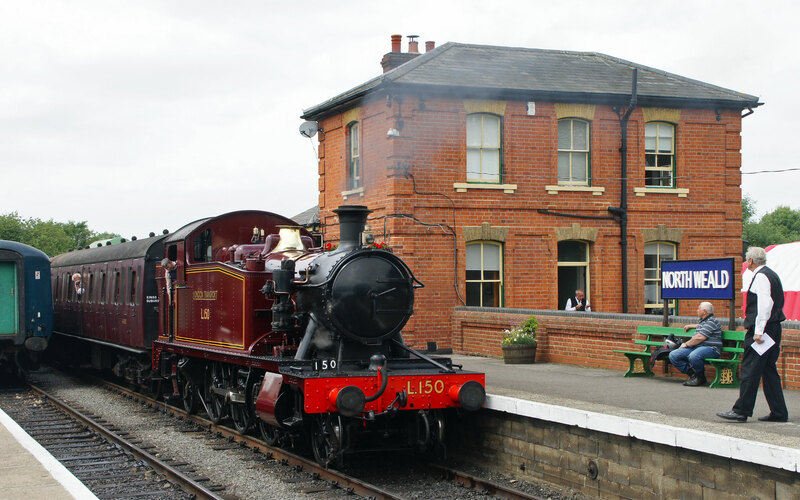 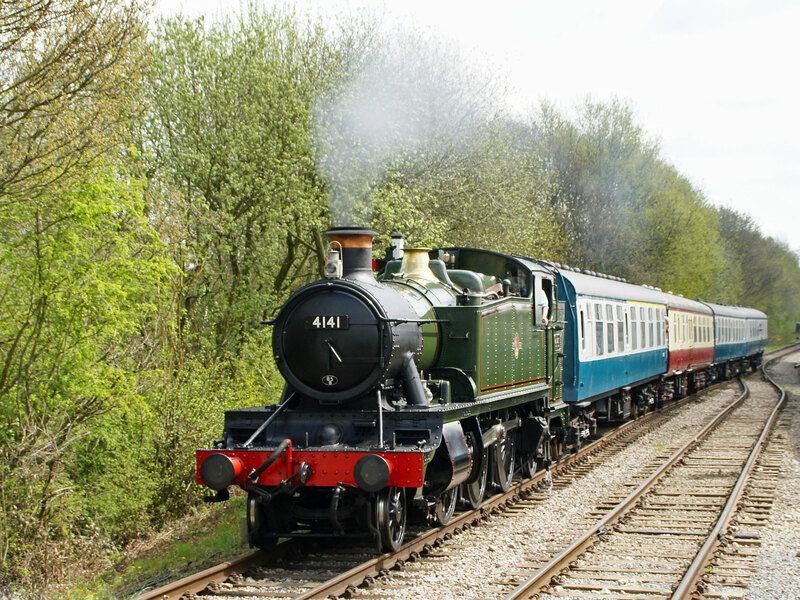 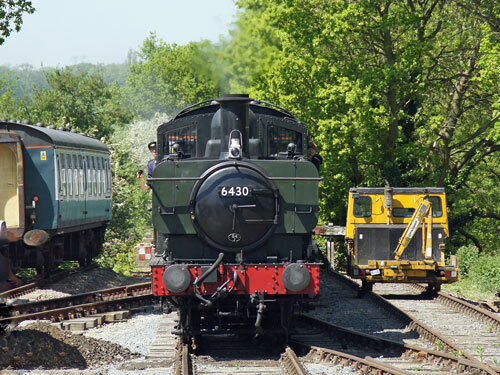 See the Official Epping Ongar Railway Website for the latest details. The connection to Ongar was made in 1865 by the Eastern Counties/Great Eastern Railway. The eastern section of the line, between Epping and Ongar, was always single track, with just one passing loop at North Weald station, and approximately 14 trains each day went as far as the rural station, with the rest terminating at Epping or Loughton. This remained the case until 1949, when the London Transport Passenger Board's New Works scheme extended the Central Line to Epping using electric trains (taking over the railway from British Rail). The Epping-Ongar branch lost its through trains to London, and a shuttle service between Epping (to connect with trains to London) and Ongar was implemented. 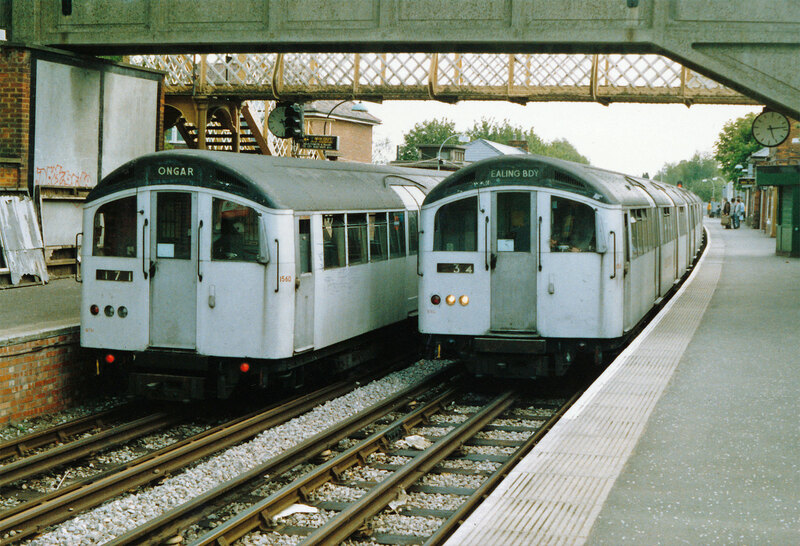 For a short time, one could see the unusual sight of steam trains and London Underground electric multiple units side-by-side at Epping. Epping Ongar Railway - this page! 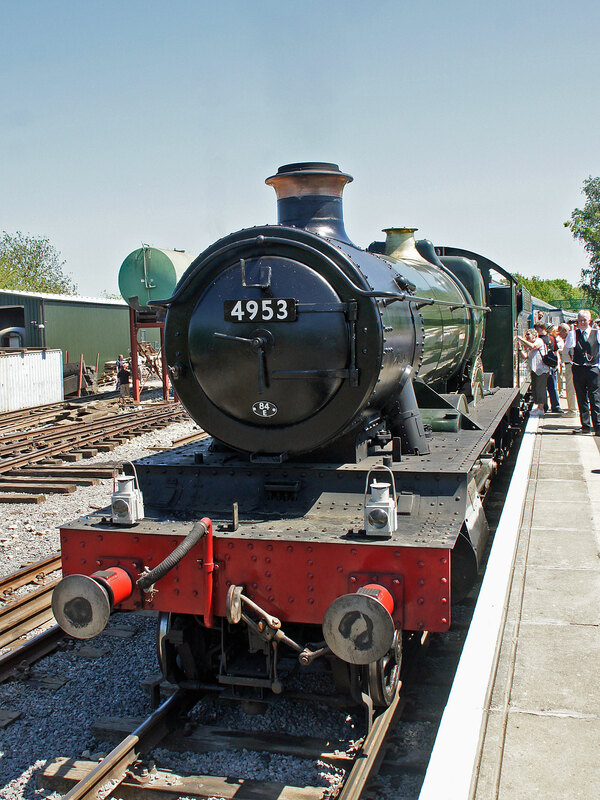 This section shows images of the railway from when it reopened on 25th May 2012, following a press day on 24th May. Operations were delayed the following day due to some staff being held up in major problems on the M25 motorway. 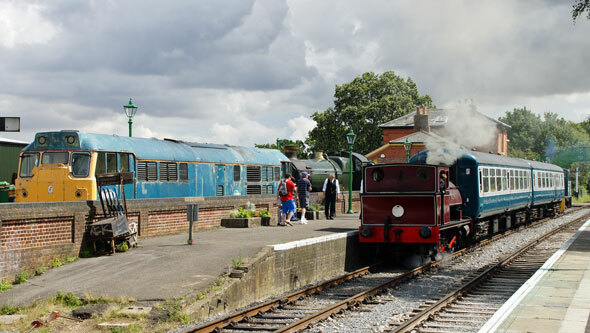 Once under way, services worked well, effectively running as two separate single lines out of the two platforms at North Weald. Steam ran between North Weald and Ongar with a loco at each end of a train of five BR Mk1 and Mk2 coaches. 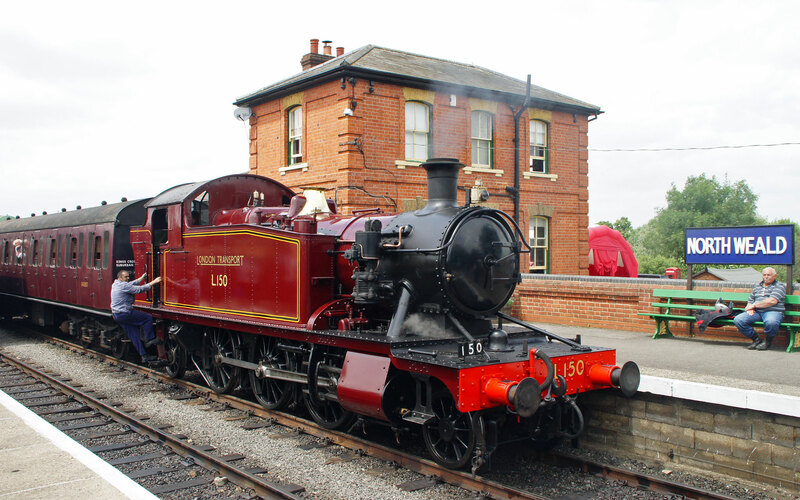 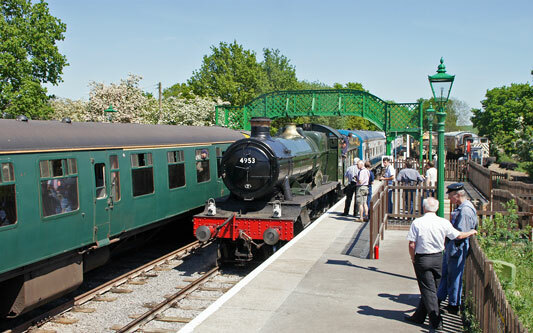 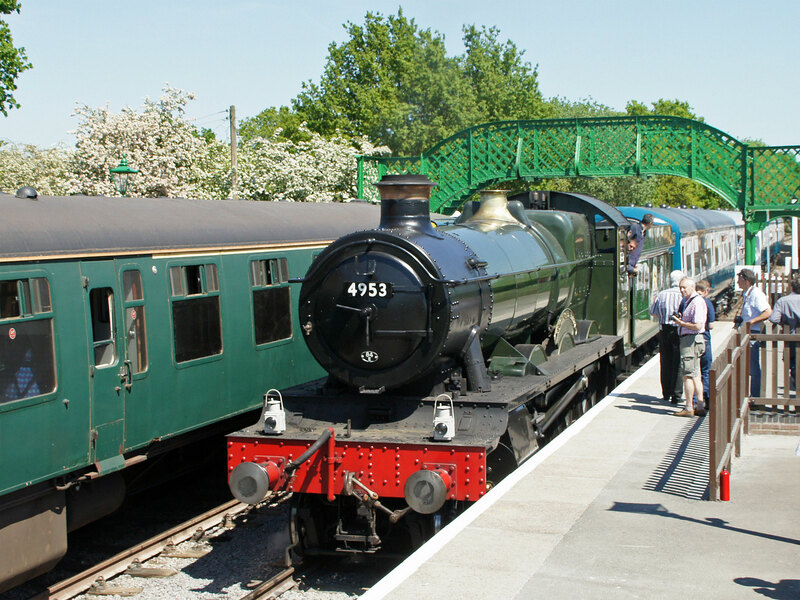 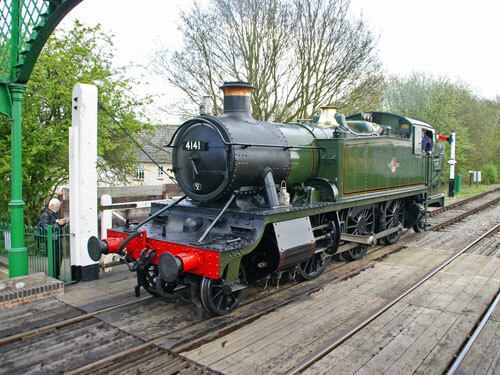 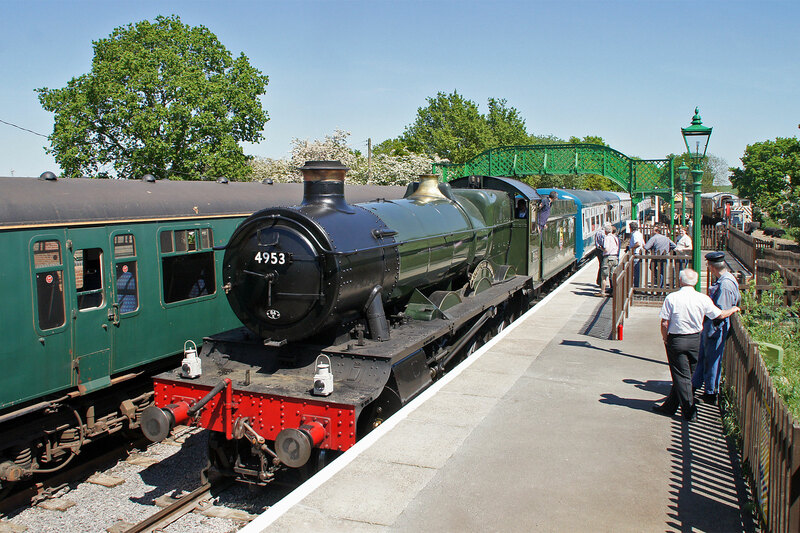 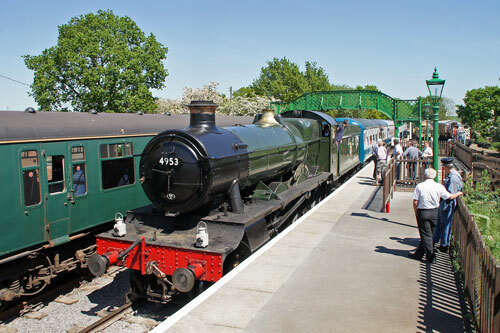 Engines used to Ongar were the railway's GWR Hall Class Pitchford Hall and loaned GWR pannier tank 6430 standing in for their GWR Prairie 4141 which was received attention to its boiler. 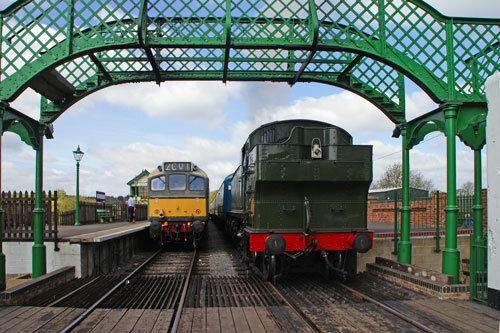 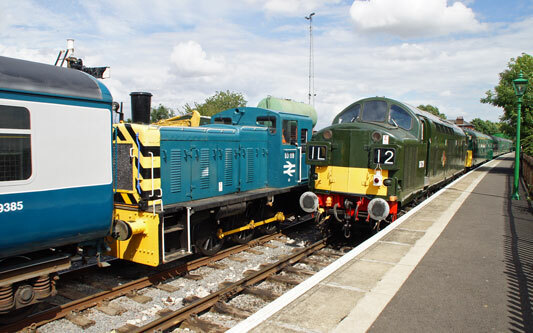 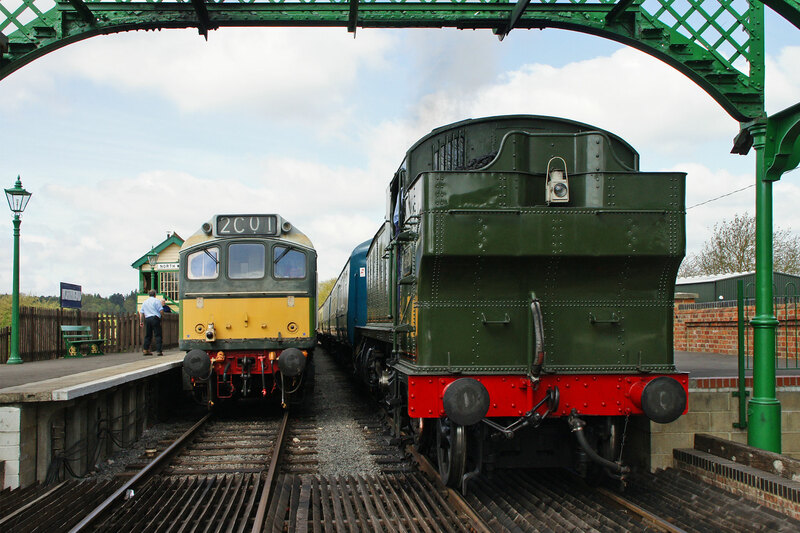 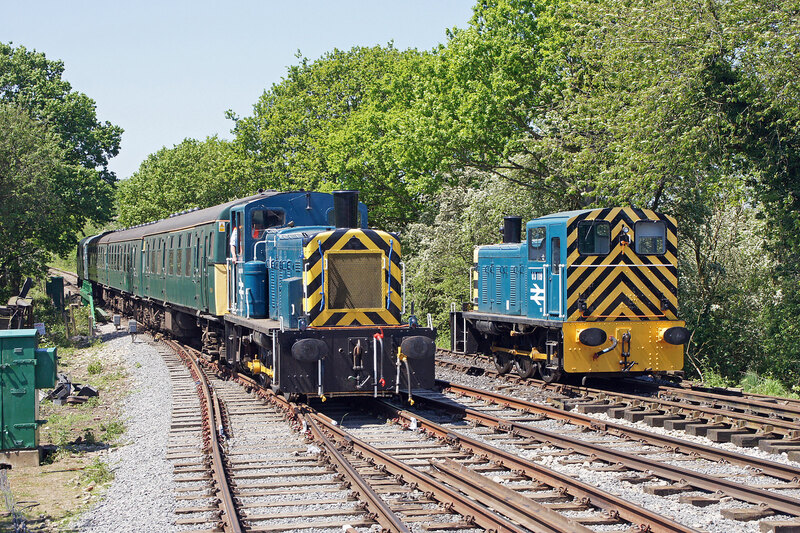 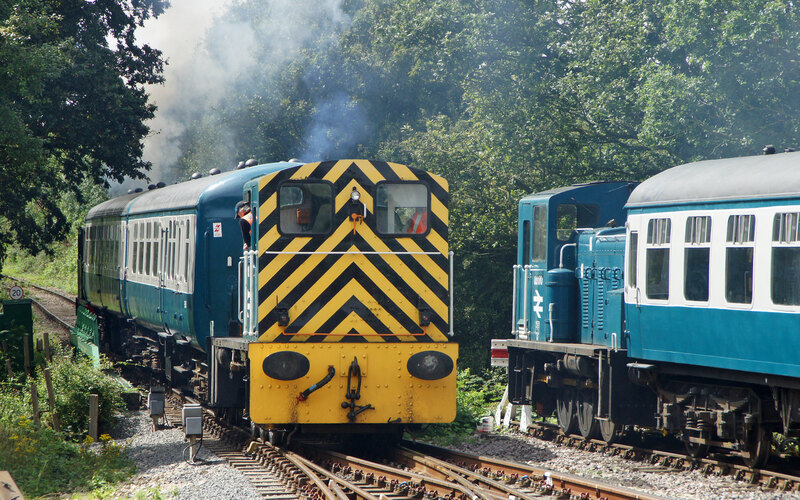 The diesel trains from North Weald under the M25 to Coopersale were top and tailed by Brush Type 2 number 31 438 and shunter 03 170. 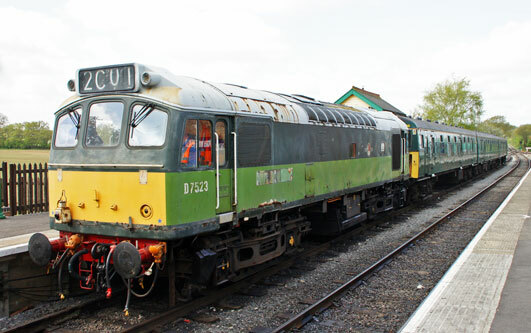 The Class 31 is being prepared for repainting. 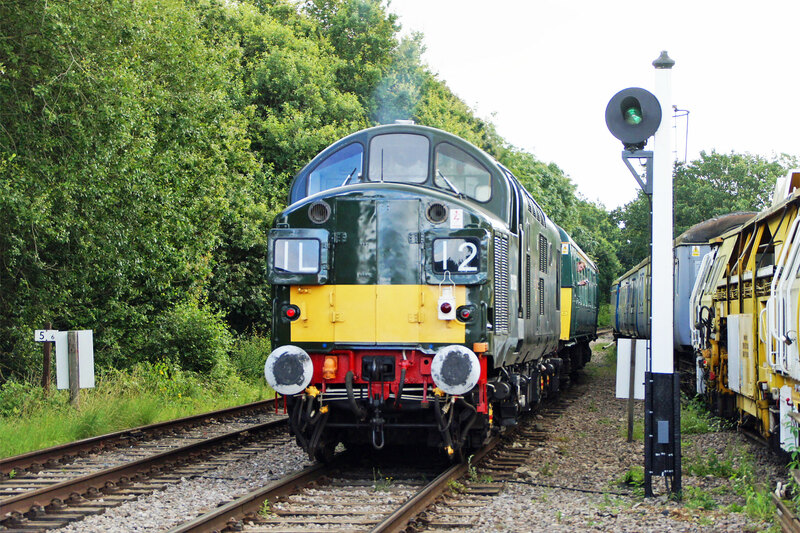 Fully restored Class 37 D6739 was used later in the first weekend. 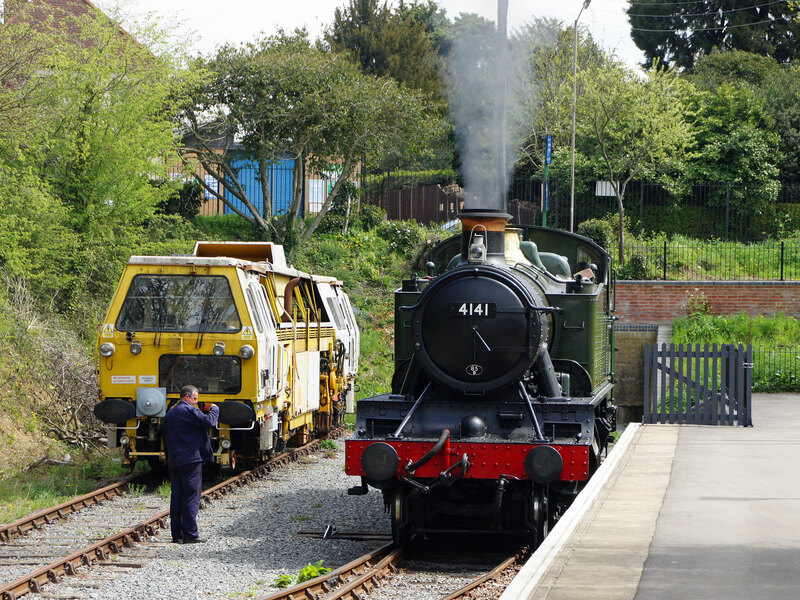 Whilst much work needs to completed, the restoration of platforms, station buildings and signal boxes is of very high quality. Excellent replica gas lamps are being installed at both stations and even road to North Weald. 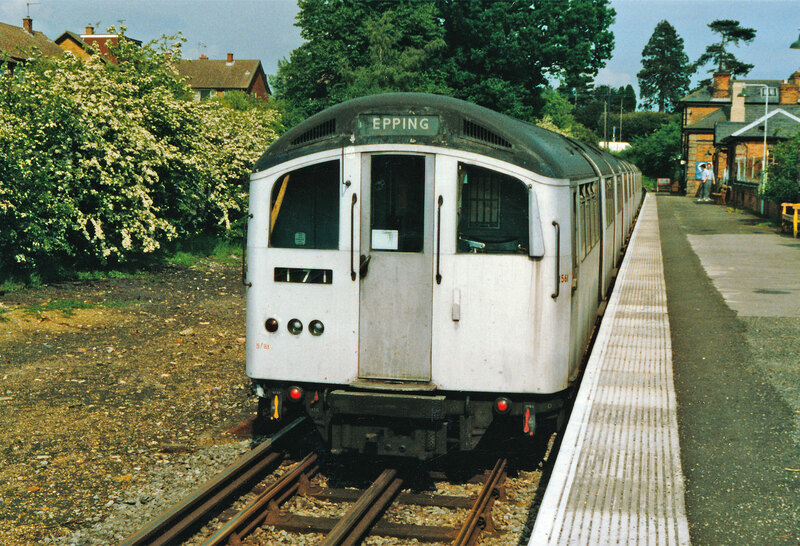 Long term plans include a new station at Epping, linked by footpath to the Underground station. Everything suggests this will become a very important preserved line in an area where the nearest similar line is some distance away (excluding steam centres and very short lines) and it is also the closest to London. Pitchford Hall is a member of the GWR 4900 Hall Class of locomotives, designed by Charles Collett. 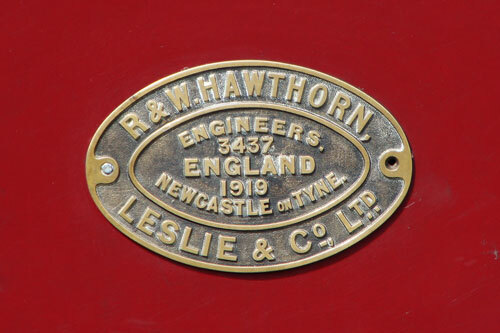 259 locomotives of this class were built, and the design is said to have heavily contributed to LMS Standard 5 and LNER Thompson B1 classes. 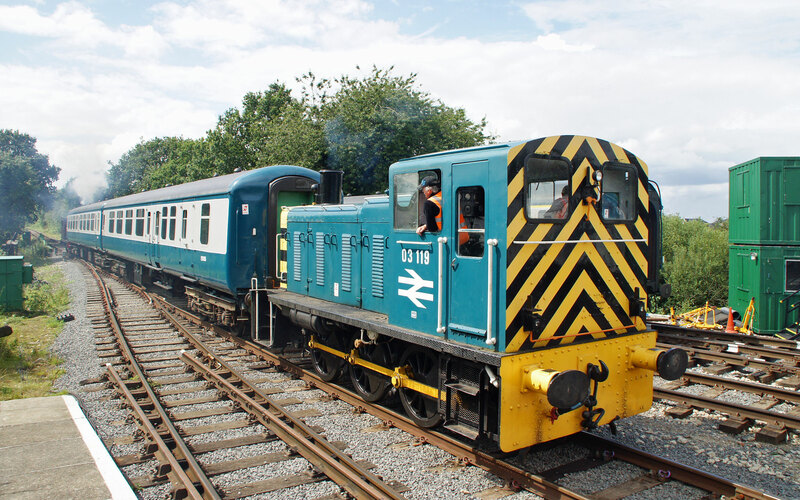 The class latterly received a 5MT power classification under BR. 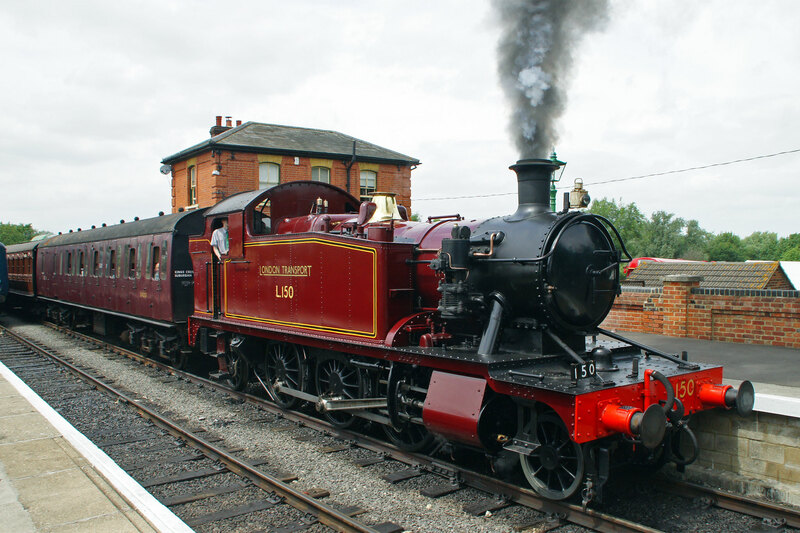 11 examples have been saved for preservation, several have made it back onto the mainline, including Pitchford Hall and one of which, Olton Hall, has gained international fame through becoming the 'Hogwarts Express' locomotive. 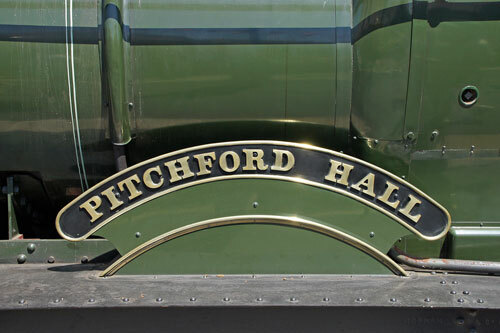 Pitchford Hall was built at Swindon in August 1929 at a cost of £4,375, and was first allocated to Bristol, Bath Road shed. 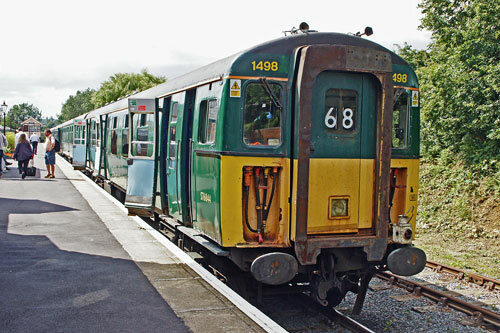 Latterly in August 1950 it was transferred to Cardiff Canton and fitted with BR type piston valves and liners February 1956 but reverted back to WR standard within two years. In March 1959 she was allocated to Swindon and then transferred from Cardiff Canton to Cardiff East Dock shed in September 1962. 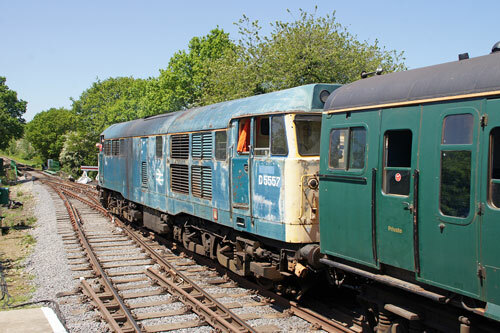 Her last years were spent at Cardiff East Dock before being withdrawn in May 1963 having covered 1,344,464 miles, and was sent to Woodham's Brothers Scrapyard in Barry in November 1963. 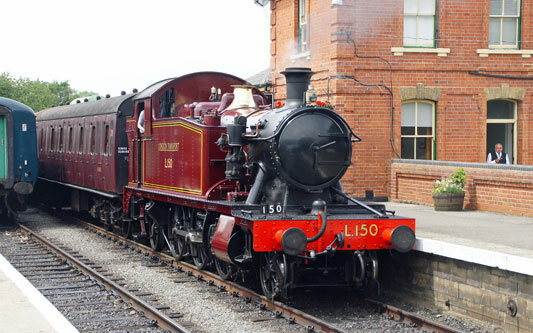 Pitchford Hall was the 150th departure from Barry in February 1984, when it was taken to Tyseley Locomotive Works where a comprehensive overhaul was undertaken for a reportedly seven figure sum. 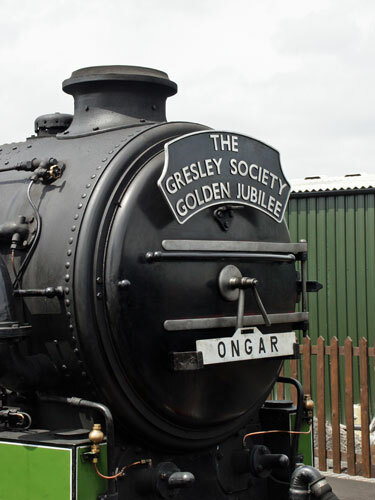 She moved again under her own power in February 2004, making her first public appearance in 42 years at Crewe in September 2005, being seen by over 40,000 people. Hall class locomotives were used all over the Great Western and Western Region. 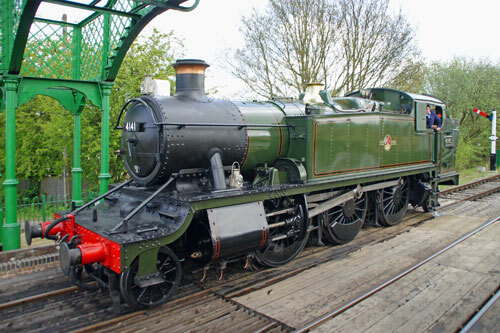 Their duties were diverse from standing in for failed 'Castles' on expresses (and keeping to tight schedules) to heavy freight work and secondary passenger services. The impressive acceleration of these engines made them particularly suited to the duties that required frequent stops, where the smaller wheels gave greater adhesion and therefore reduced slipping when starting from standstill. 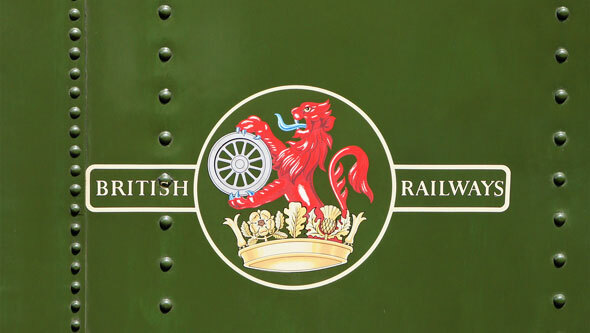 The Hall class and other GWR 2-cylinder engines all have a distinctive 'bark' to their exhaust notes, which is one thing that helps to maintain enthusiasm throughout the generations. 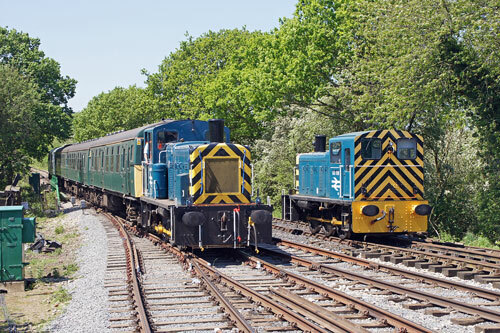 Their long service also ensured they wore a number of liveries. 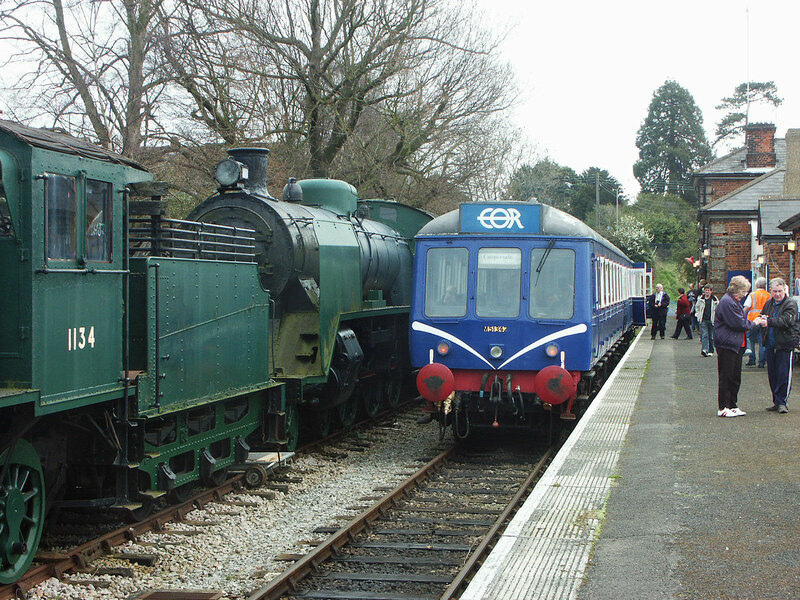 This included the passenger class fully lined GWR green until 1948 and nationalisation, then during the early BR years all mixed traffic classes on all regions carried the lined black livery. In 1956 some discretion was allowed by BR, and the Western Region was allowed to paint mixed traffic engines in fully lined Brunswick green. 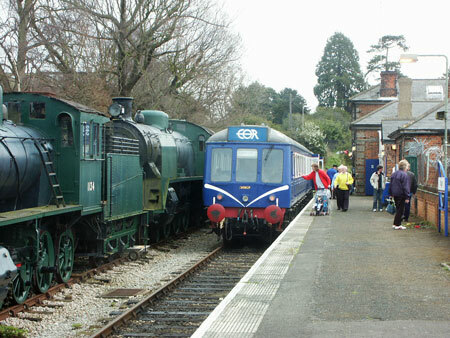 Pitchford Hall returned to the mainline in December 2005, and operated a number of special mainline charter trains during 2007 and 2009, but has also visited a number of heritage railways, including West Somerset Railway, Llangollen (where it double-headed with City of Truro), Mid Hants Railway (standing in for King Edward II) and Great Central Railway, where it has hauled passenger as well as charter freight and even demonstration Travelling Post Office trains to the delight of visitors. 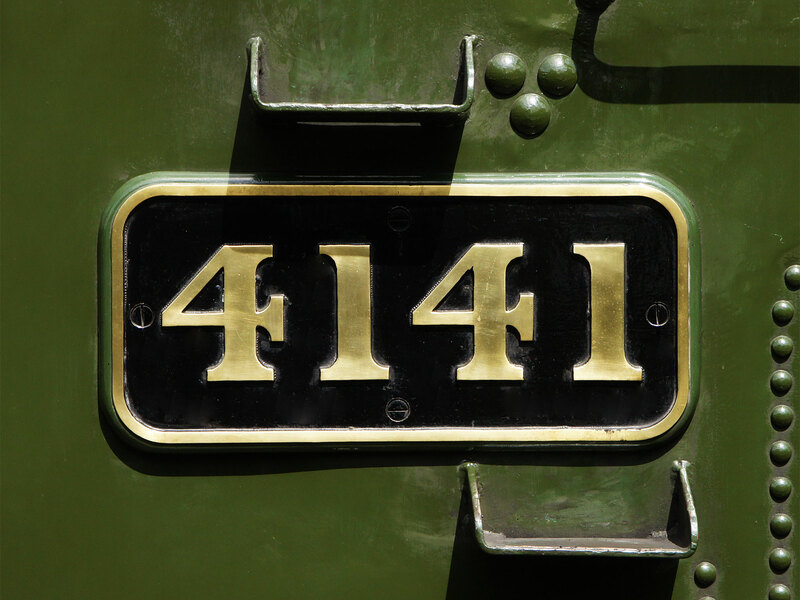 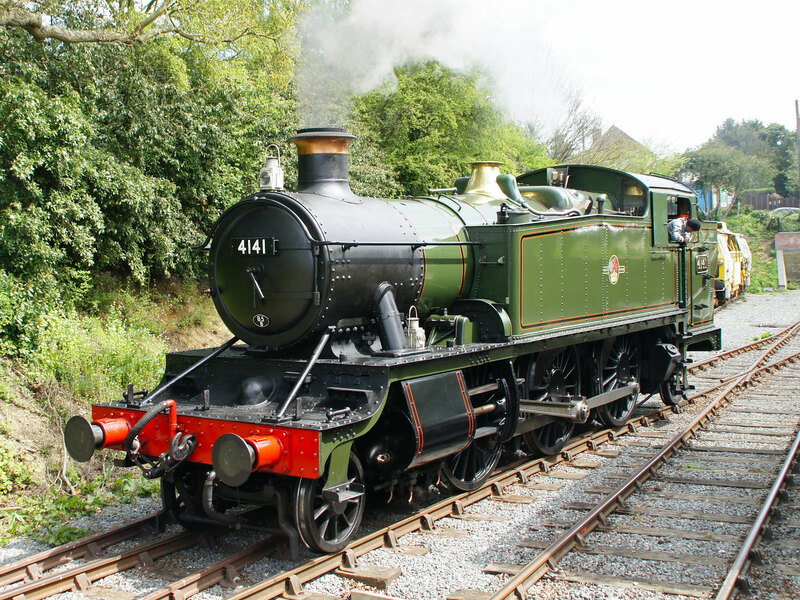 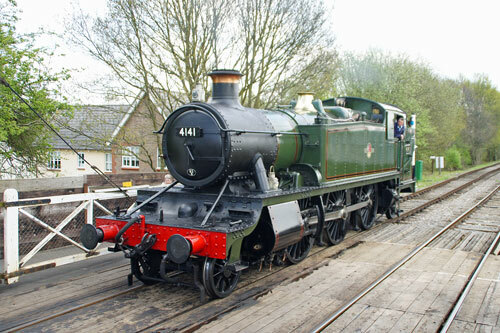 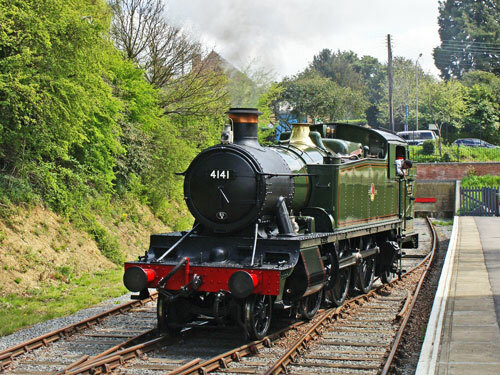 4141 is a member of the GWR 5101 class, commonly known as a Large Prairie, being 41ft (12.5m) in length and 79.71 tonnes. 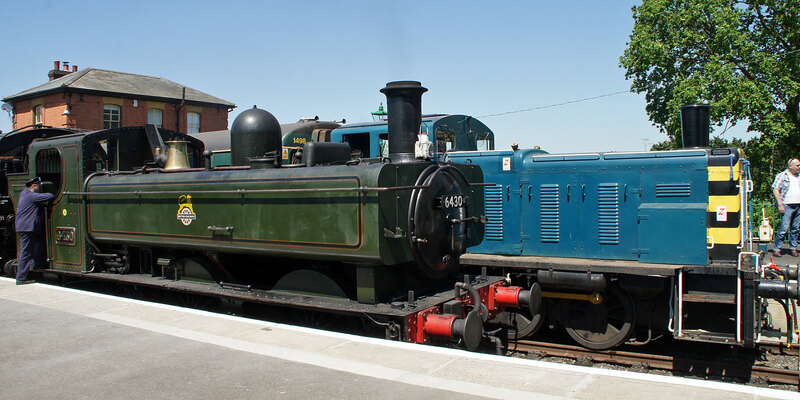 It is a medium sized tank engine with a 2-6-2T wheel arrangement and was designed for suburban and local passenger services, often seen with GWR and BR suburban coaches, such as those under restoration at EOR. 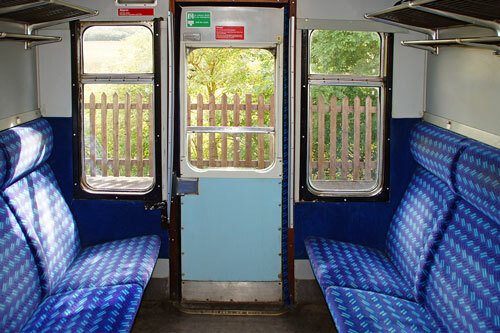 The class was built between 1903 and 1949, and totalled 209 examples. 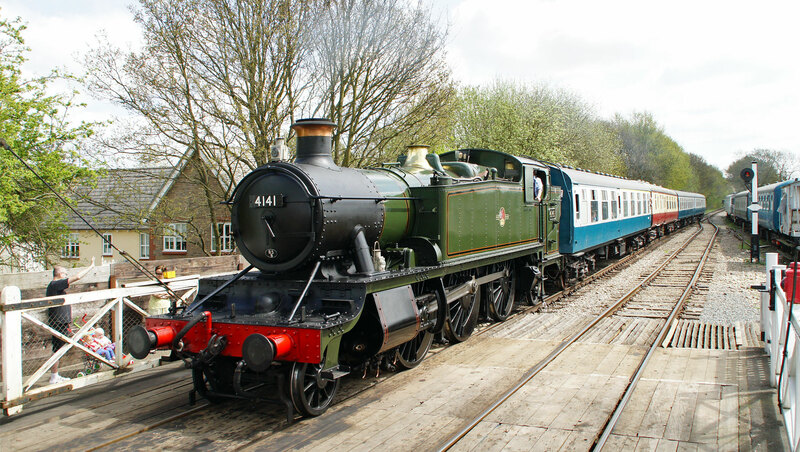 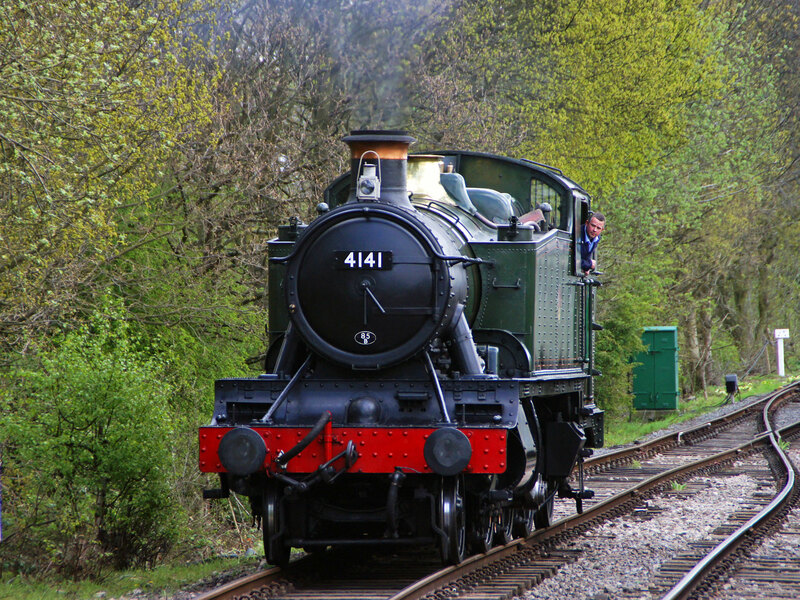 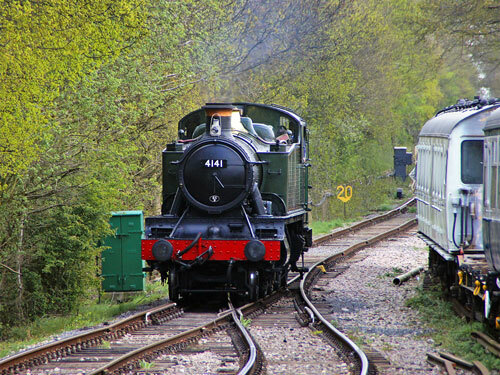 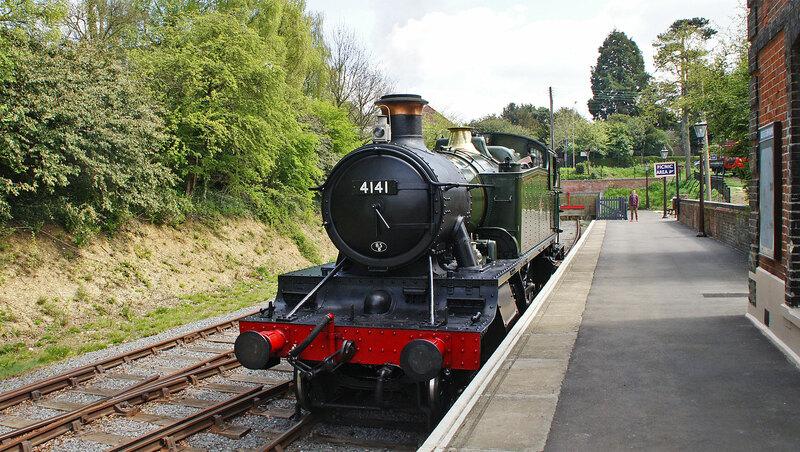 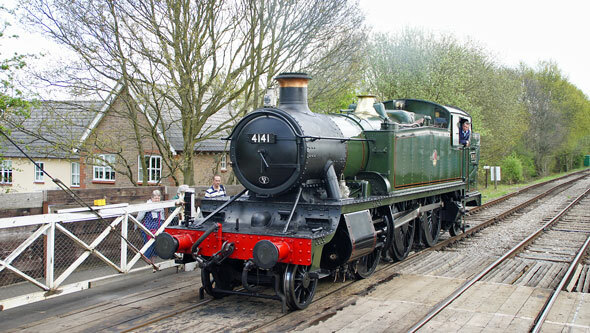 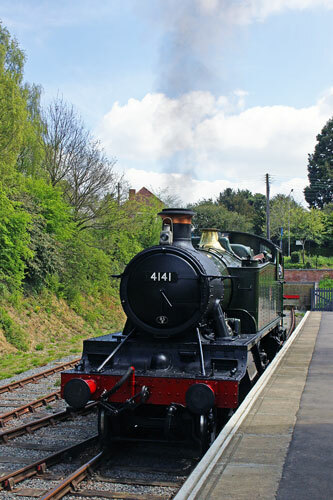 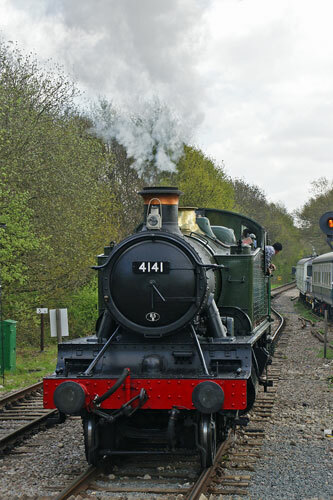 4141 was built in Swindon in 1946, and was allocated to Gloucester (Horton Rd) for all of its working life, working on banking duties before latterly working expresses to London. Thanks to the proximity of Barry scrap yard to the former GWR system, 10 examples were saved for preservation. 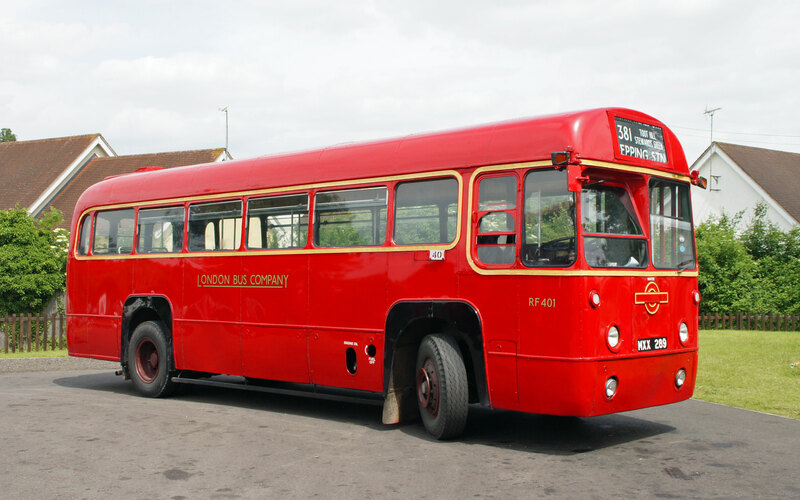 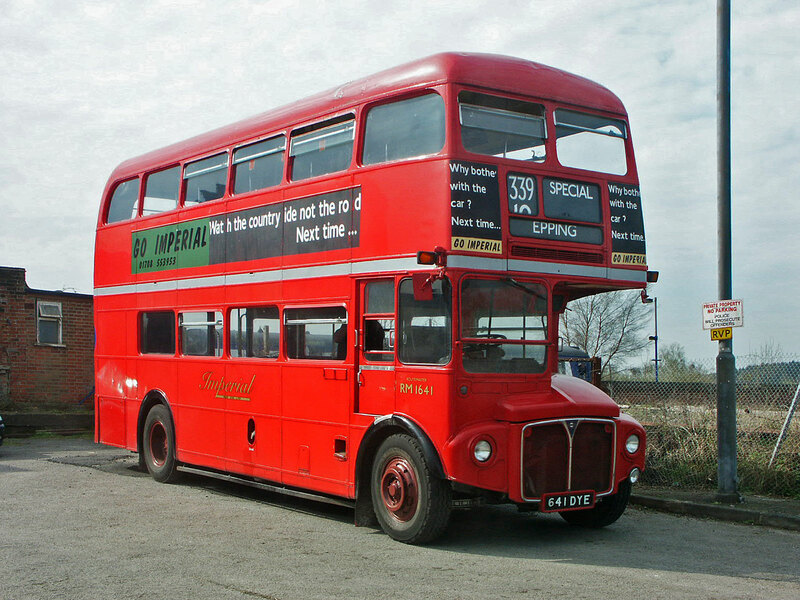 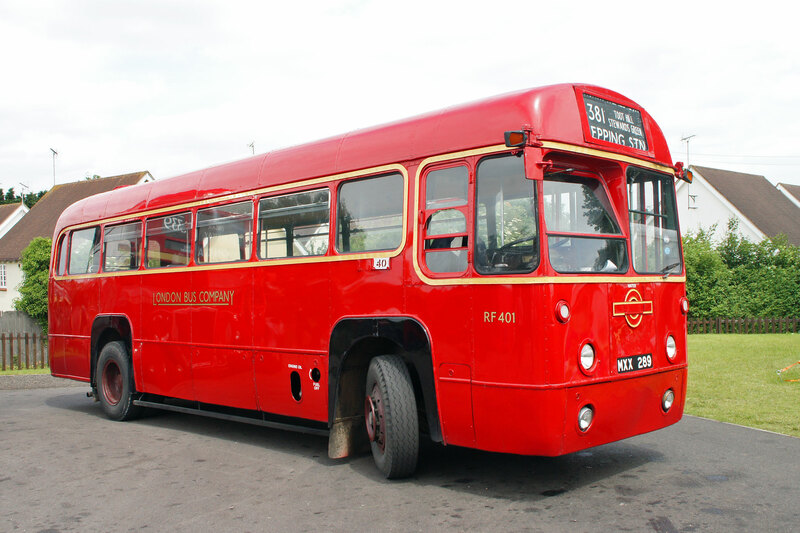 4141 was withdrawn in February 1963 and reached Barry in November 1964, being saved for preservation in early 1973. 4141 and its classmates have proved to be ideally sized for use on heritage railways, handling the shorter journey times and typical loads, being economic and reliable performers.03119 is a unique engine as it was one of the specially modified Class 03 shunters which was modified to have a "cut down", reduced height cab to enable it to work the Burry Port & Gwendraeth Valley branch which had lower bridges, and fitted with air operated controls so they could be worked in pairs to cope with the heavy loads. Built at BR Swindon Works and introduced in September 1959 as D2119, it was allocated initially to Danygraig depot. 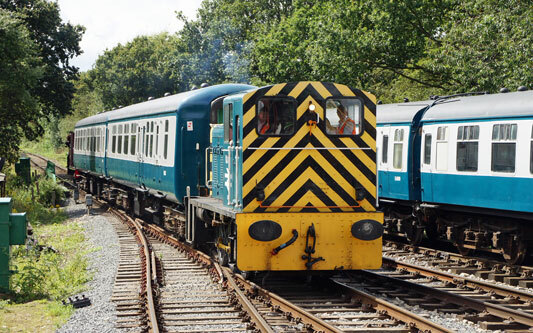 Renumbered to 03119 in March 1974, it was withdrawn from traffic while allocated to Landore Depot in February 1986. 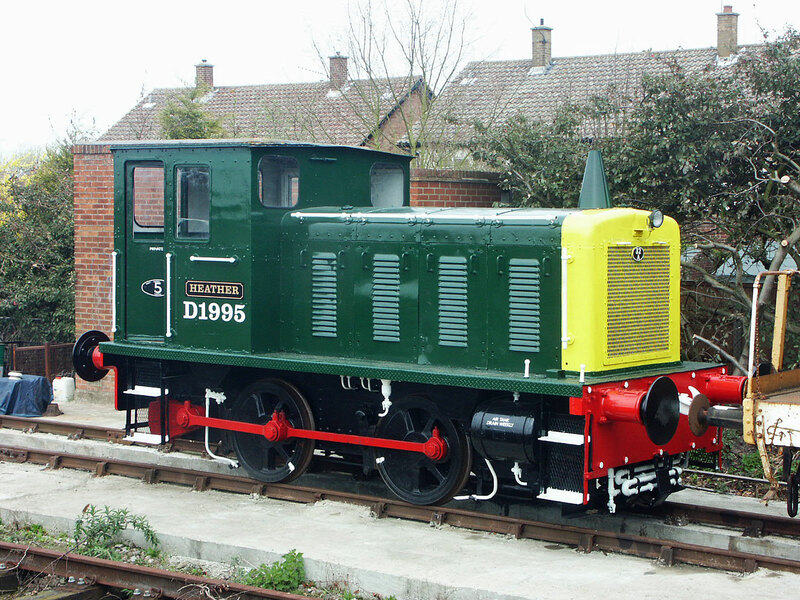 After arriving at Knills scrap yard, Barry, in November 1986, 03119 was quickly saved and moved to the Dean Forest Railway by December 1986 to enter railway preservation. 03119 made the move to the West Somerset Railway in March 1996, where it has been kept in good working order by the Diesel and Electric Preservation Group at Williton before coming to EOR in Dec 2011. The locomotive carries the BR livery, and 03 shunters were once a common sight all over the country, including at many East Anglian stations on shunting duties. 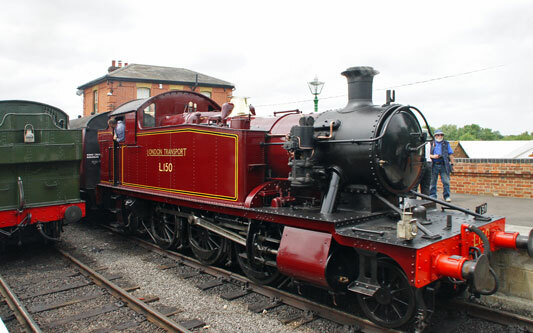 Hawthorne Leslie built saddle tank 0-6-0 locomotive Isabel was the new Epping-Ongar owner's first steam locomotive purchase. 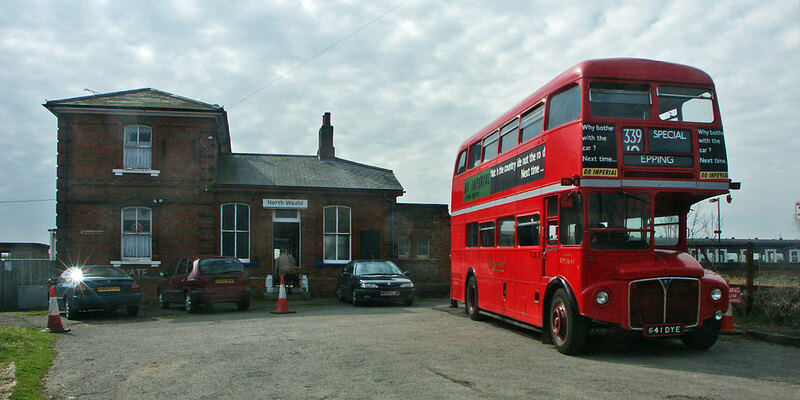 Built in 1919 to an order (number 3437) from ICI foodstuffs she was delivered new to their Blackley (Manchester) dye plant that year. 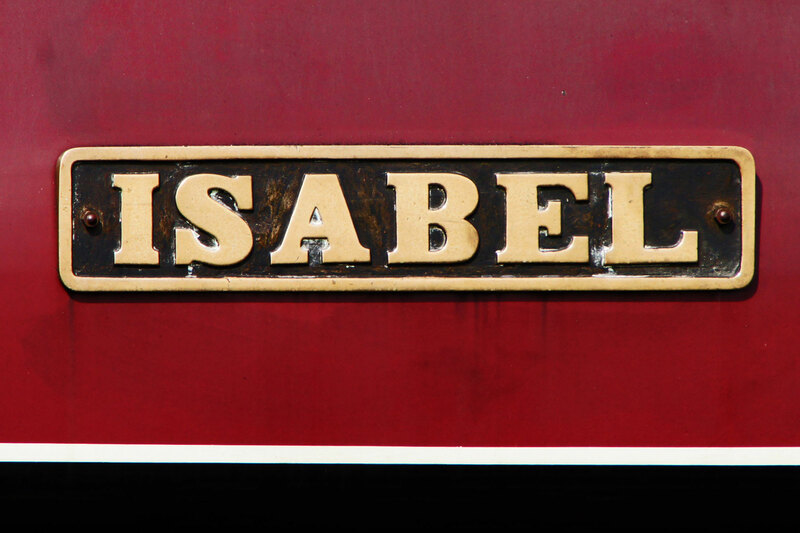 Isabel was to spend the whole of her working life at the plant and withdrawal from service finally came in 1969. 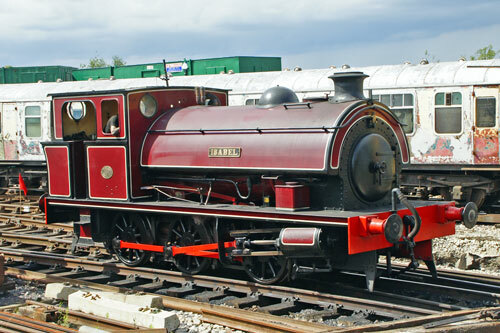 During her time with ICI she had a fairly uneventful career, the only known incident occurred during the General Strike of 1926. 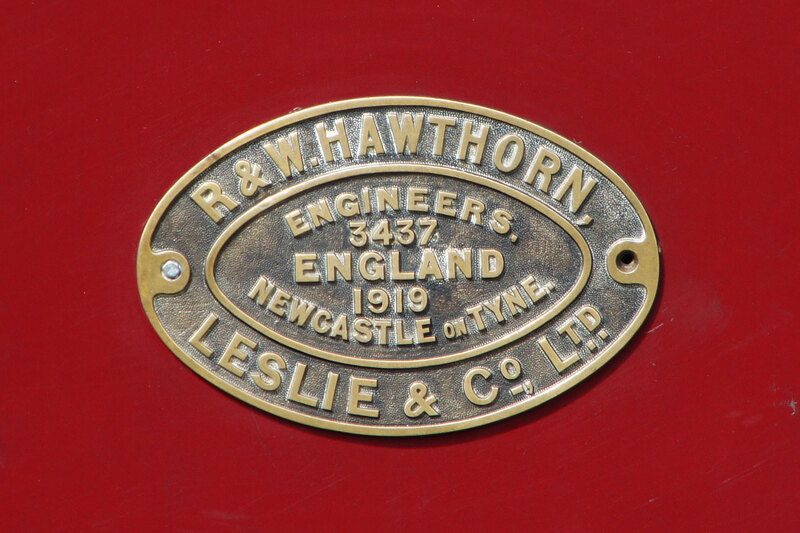 Whilst being driven by a team of enthusiastic amateurs she ran away, demolished the locomotive shed doors and wrote off her sister engine which was standing in the shed. 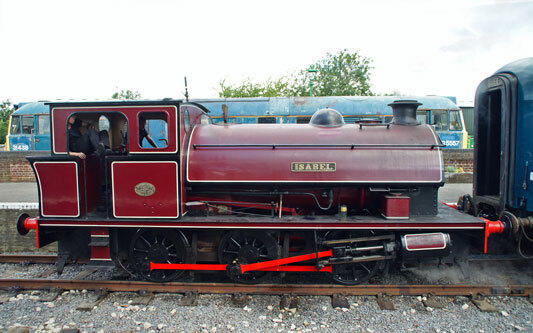 It is rumoured that this is where she gained the flat spot on her wheels which she still carries. After withdrawal Isabel went straight in to preservation at the fledgling Somerset and Dorset Trust Site at the former Radstock Station site. However restoration to working order was to wait a few more years. 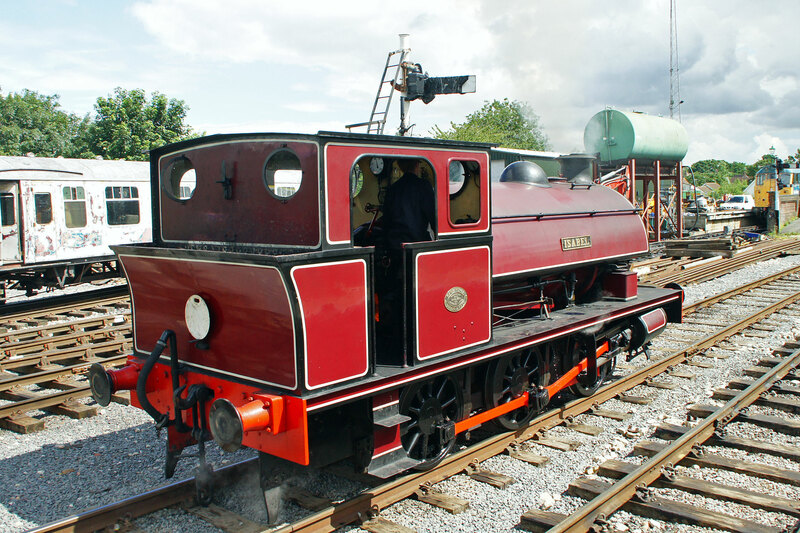 When the Radstock site closed and the Trust relocated to Washford on the West Somerset Railway in 1975, Isabel followed and she was to wait until 1998 for restoration to working order to be commenced. 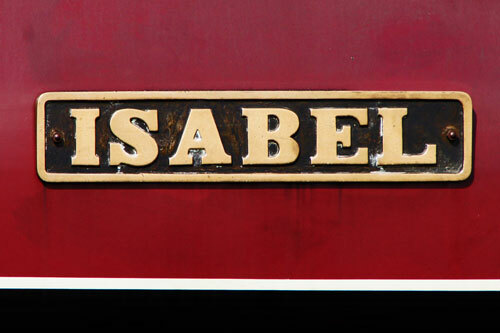 Not wanting to rush the process it wasn't until October 2005 for Isabel to be revealed to the world in all her restored glory. 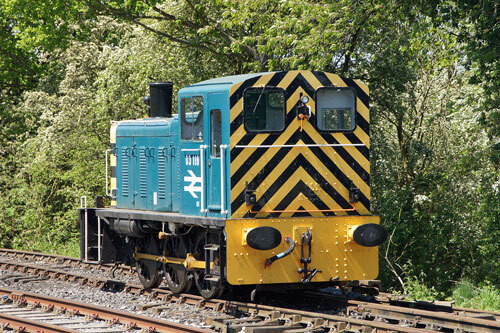 Used for shunting the S&D Trust yard she certainly turned a few heads. Shortly after this in 2007 the locomotive changed hands and travelled north to the Cambrian Railways site at Llynncs Junction. Little used she was soon made available for sale again and in early 2010 Isabel became the new Epping-Ongar owner's first steam locomotive. 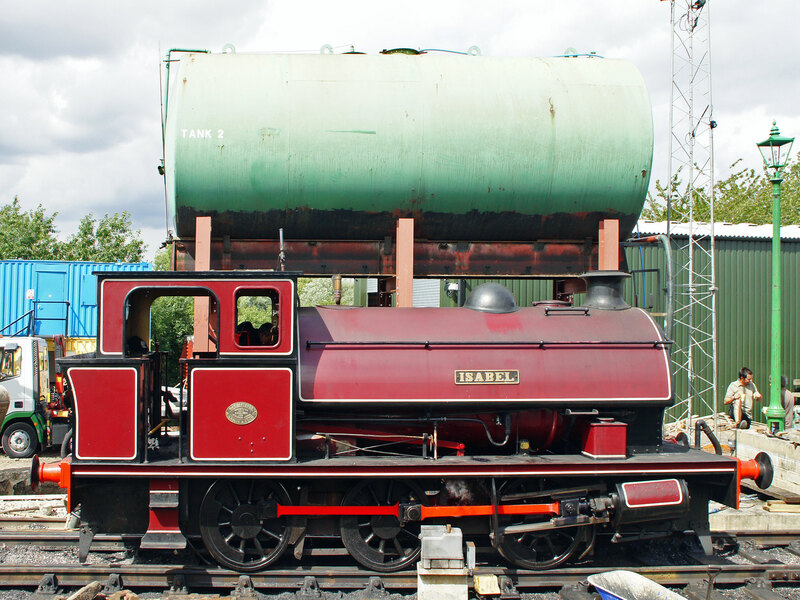 Isabel has now reached the end of her 10-year boiler ticket, and will be given an overhaul prior to returning into traffic. 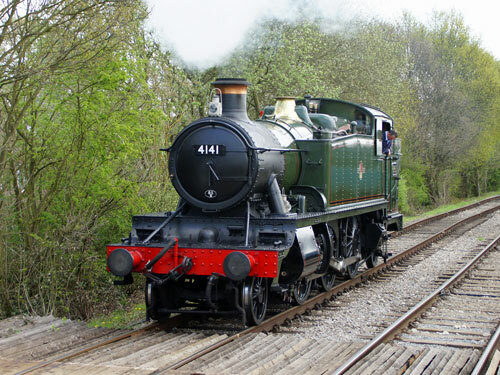 The services of visiting loco 6430 were secured because 4141 was unavailable for the opening weekend. 6430 is a push-pull fitted 0-6-0 pannier tank of GWR origin, built at Swindon in 1937 as part of lot no.305. 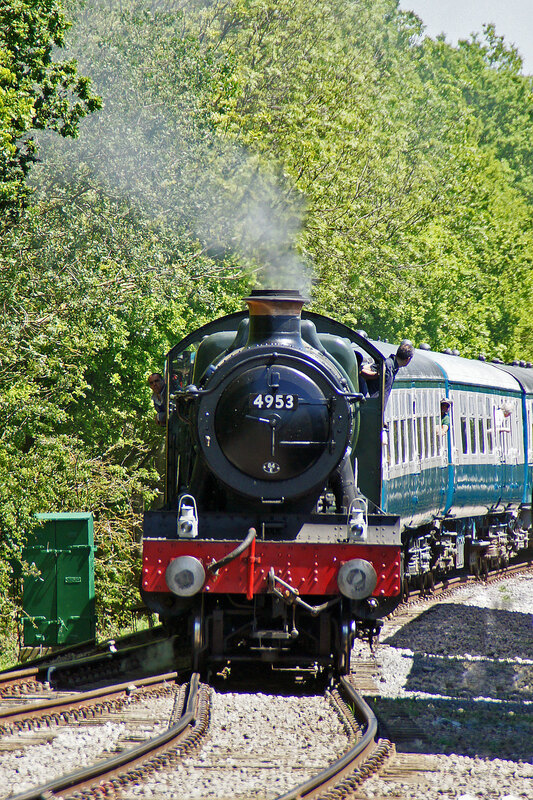 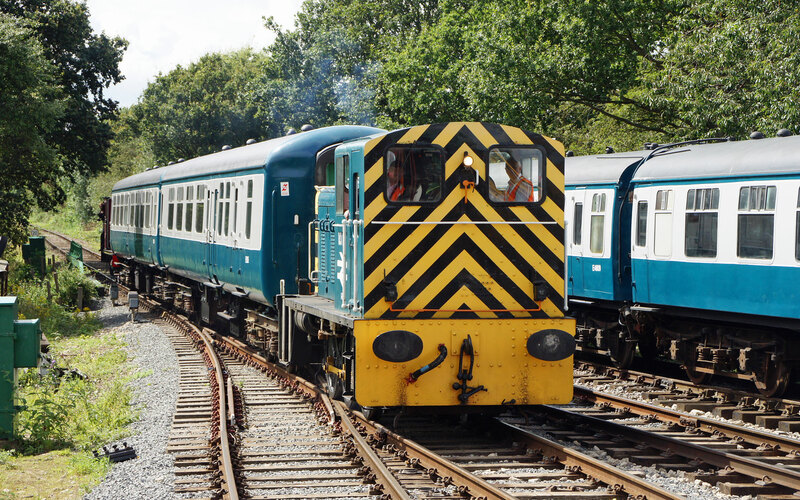 The class spent their lives working many of the minor branch lines on the former GWR system, particularly the South Wales valleys, and were fitted for auto train working. 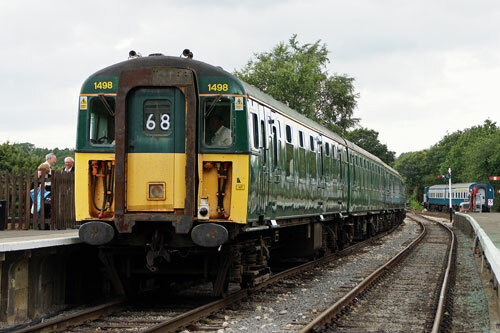 Withdrawal in 1964 was followed by sale to John Cashmore Ltd as scrap, but immediately 6430 was re-sold to the Dart Valley Railway as a source of spares. It was towed to there by 6412 in 1966. 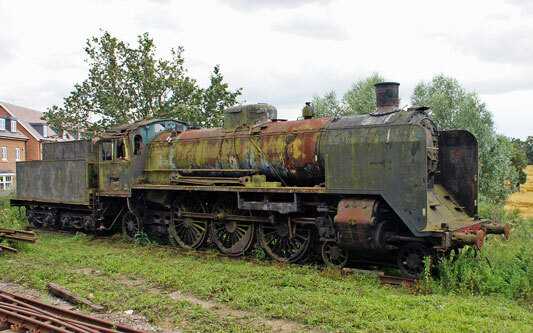 When the remains of the engine were purchased by its current owner in 1990, it represented an incomplete kit of parts. It spent some time undergoing restoration at Long Marston MOD depot, along with 5199, before moving on to the Llangollen Railway in 1996. Having lost many parts to other engines, restoration work was slow. Repairs to its cracked cylinder block were tackled by the Severn Valley Railway during 1996, and new pannier tanks were fabricated and fitted at Llangollen. 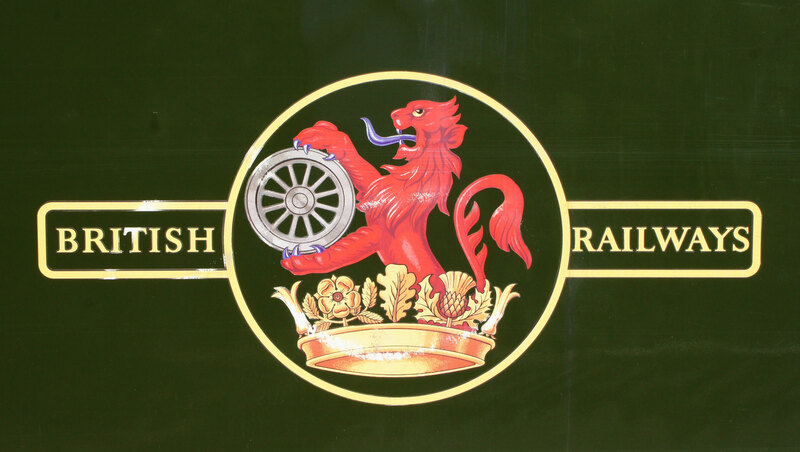 After manufacture of new axleboxes, re-wheeling took place on 24th April 1998, and work progressed slowly towards its return to steam. New motion parts, coupling and connecting rods were cast and machined to size, whilst other parts were found elsewhere and purchased. A major problem was the badly corroded state of the boiler. 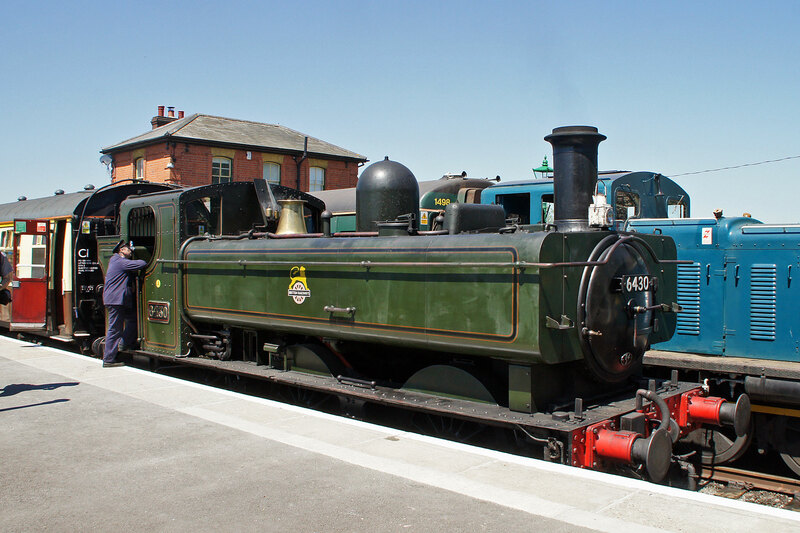 This necessitated a completely new boiler barrel being made and fitted to the existing smokebox and firebox. Its first move under its own steam came on 20th December 2003. Work to finish off the locomotive continued, and it undertook a successful trial run along the full length of the Railway on 23rd February 2004. 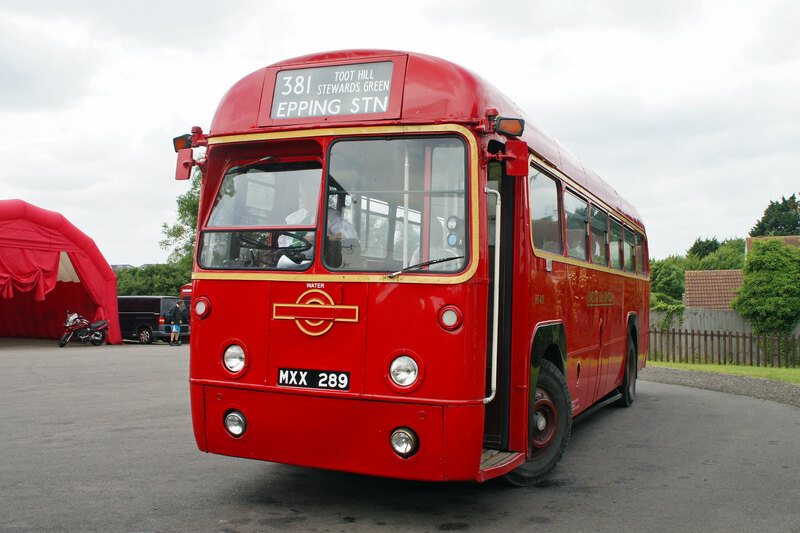 It was brought by road to the Epping Ongar Railway in the week prior to opening. 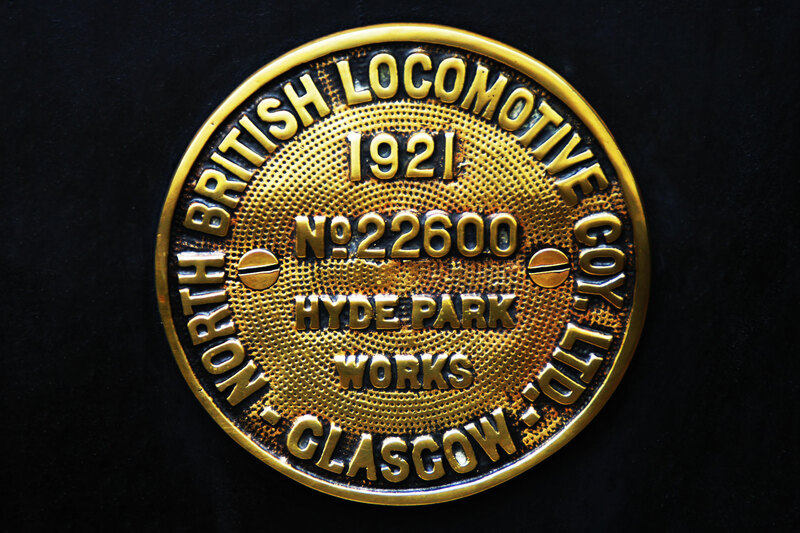 Great Northern Railway N2 Class 0-6-2T No.1744 was built at the North British Locomotive Works, Glasgow in 1920. Withdrawn 1962. Arrived at the Great Central Railway in 1975. 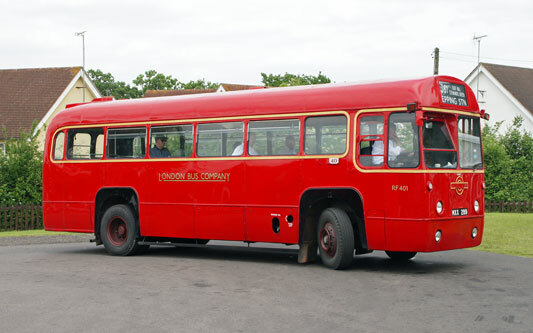 First returned to traffic in 1978. Withdrawn in 1994. 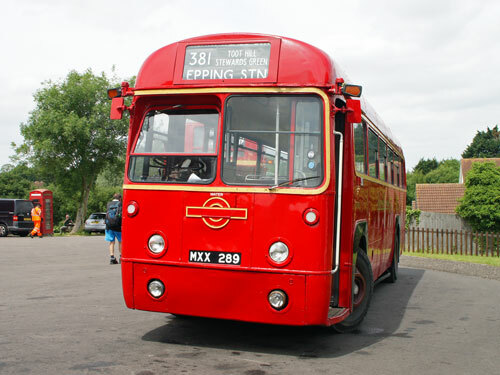 Returned to traffic for second time in 2009. 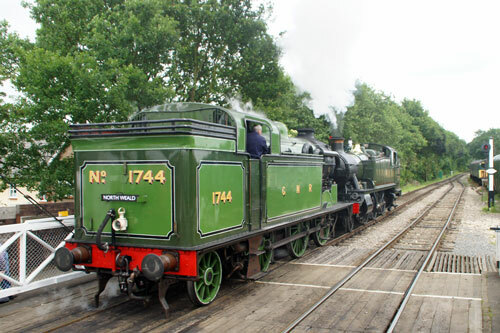 GNR 1744 visited the Epping-Ongar Railway for their London Underground 150 Gala 28th June-1st July 2013. 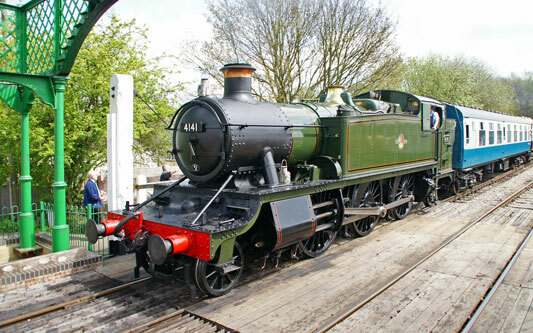 Number 5521 was built at Swindon in 1927 and spent most of its working life on branch lines in the West Country. After withdrawal, having run just over a million miles, it spent time at Barry and Bishops Lydeard before Richard and William Parker bought it in 1980. 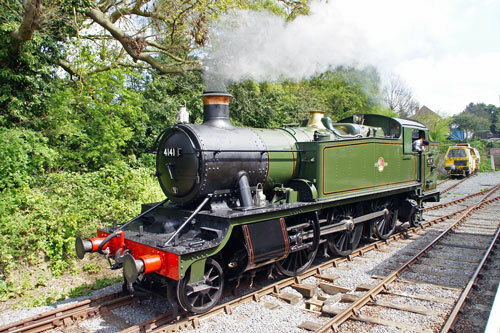 It moved first to the Dean Forest Railway, then to the industrial estate in Lydney, then to Swindon Works, then to the Swindon & Cricklade Railway and back again to the DFR before it was finally restored at The Flour Mill in the Forest of Dean from 2004 to 2007. 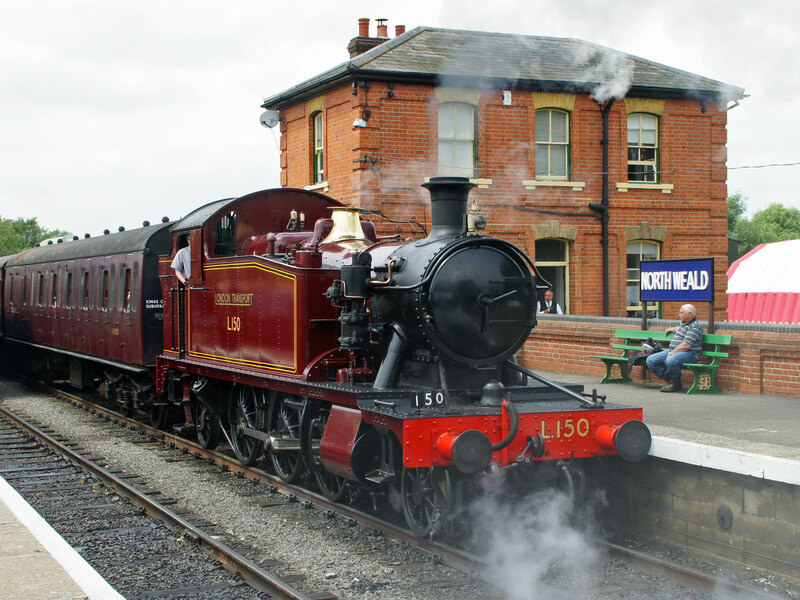 The locomotive is generally as built, with the addition of a Westinghouse air pump on the driver's side, so that it has, along with the loco hand and steam brakes, the ability to brake trains fitted with either vacuum or air brake systems. 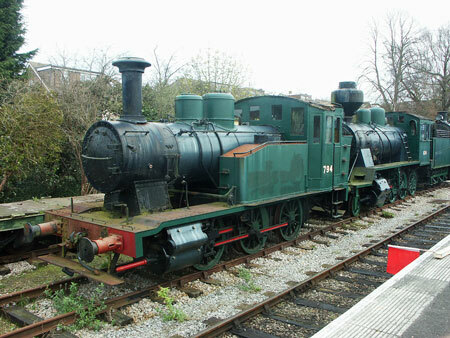 In April 2007 5521 went by sea from Hull to Gdynia in Poland via Helsinki and featured in the Wolsztyn Parade. 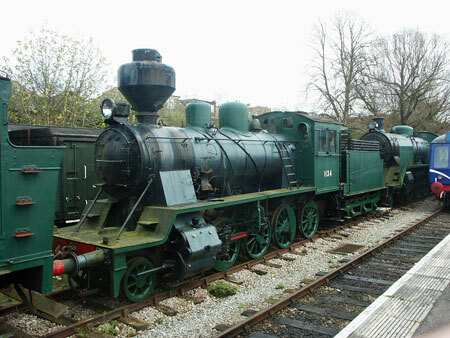 It then travelled with Hungarian (ex Sudbahn) 4-6-0 109.109 to Budapest, Hungary where it worked intermittently with MAV Nosztalgia, the heritage rail operator. In September 2007 it piloted the Venice Simplon-Orient-Express from Budapest Keleti to Kelenfold stations on its return from Istanbul to Venice before competing in the Zvolen Grand Prix in Slovakia and the Central European Steam Locomotive Grand Prix at the Railway Heritage Park in Budapest. It returned to Poland and in May 2008 again appeared in the Wolsztyn Parade before operating suburban services from Wroclaw to Jelcz Laskowice, to the timings of the electric multiple units it was replacing, for several periods of up to nine days at a time, each with 36 scheduled stops and starts. 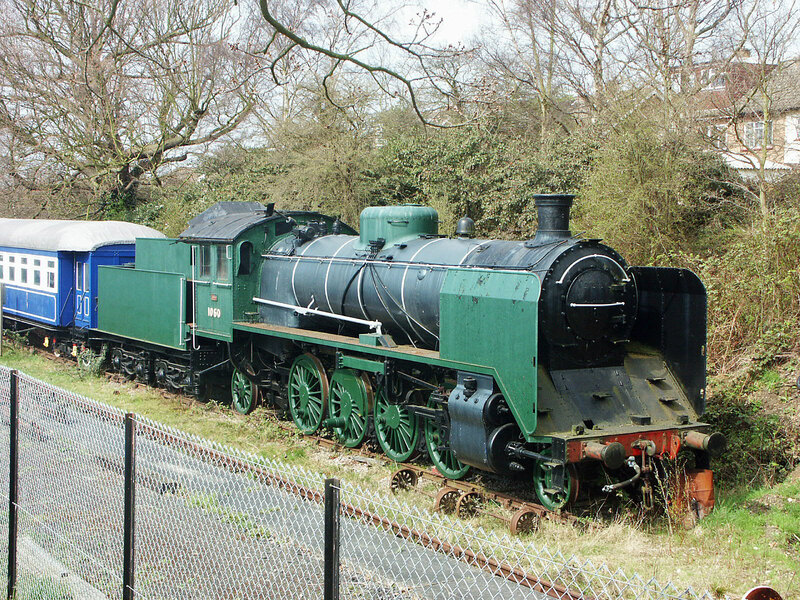 In 2009 5521 returned to England the way it had come, after appearing at the Wolsztyn Parade for the third time. 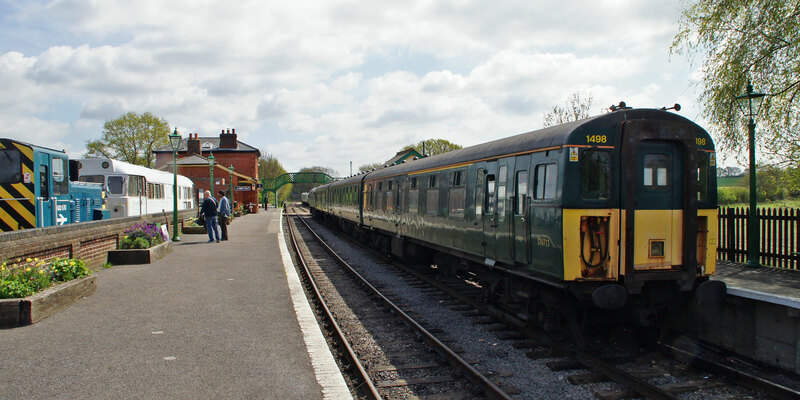 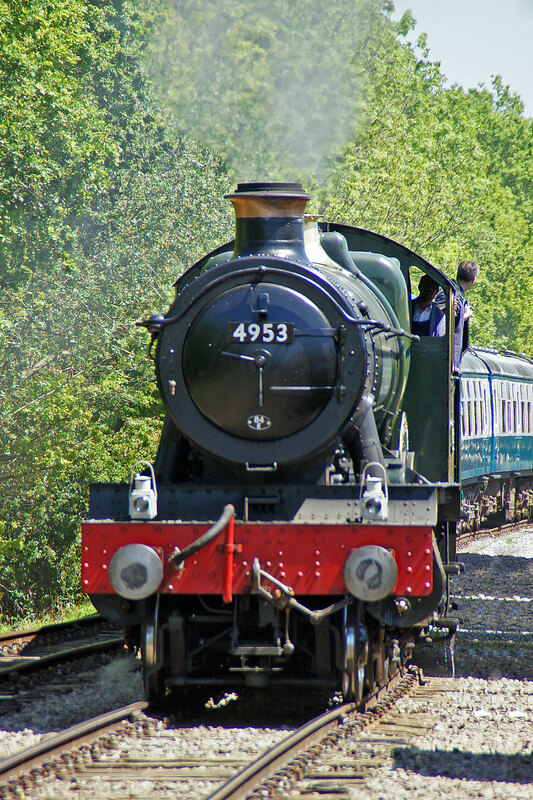 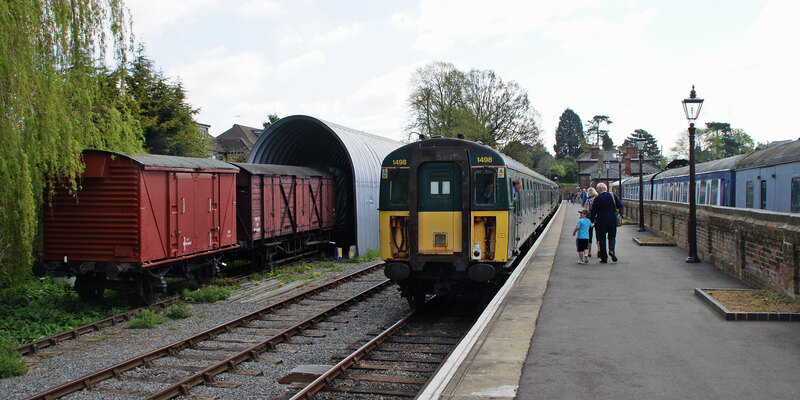 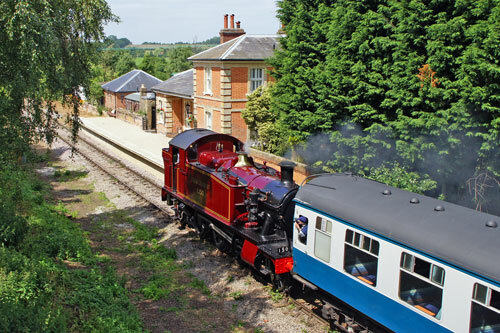 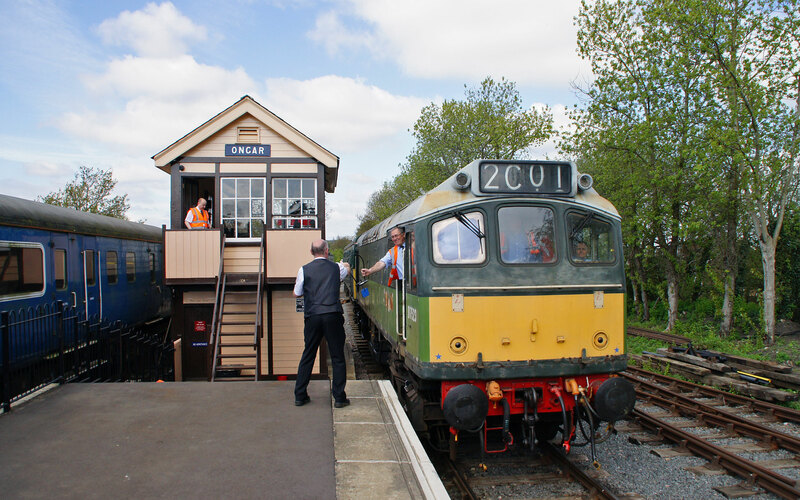 Since then it has visited the National Railway Museum, the North Norfolk Railway, the Dean Forest Railway, the Spa Valley Railway and the Bodmin and Wenford Railway. 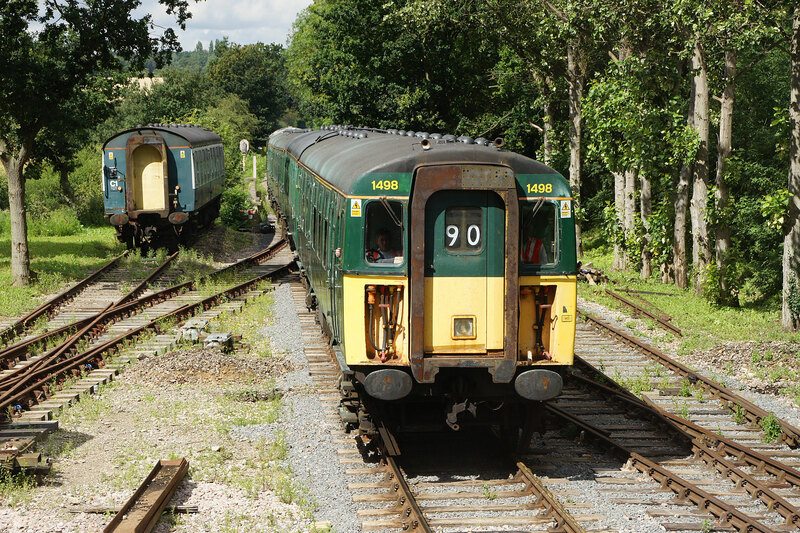 After Railfest 2012 it returned briefly to the Dean Forest Railway for a gala at the end of June 2012, before spending August 2012 at the Swindon & Cricklade Railway, with brief spells on the Avon Valley Railway and the Battlefield line. In May 2013 at the request of London Underground the locomotive was painted in red London Transport livery and numbered L.150, to commemorate the 150th anniversary of the Metropolitan line, and on 25-27 May it operated special trains between Harrow-on-the-Hill and Amersham, along with Met 1, 9466 and Sarah Siddons, and it is planned to operate a similar service in early September. 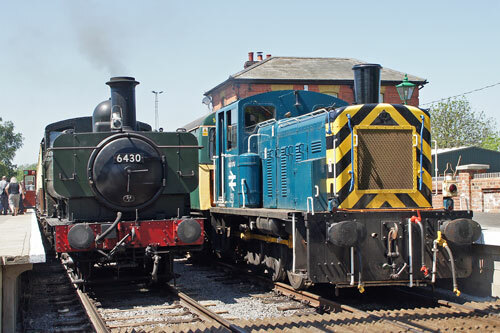 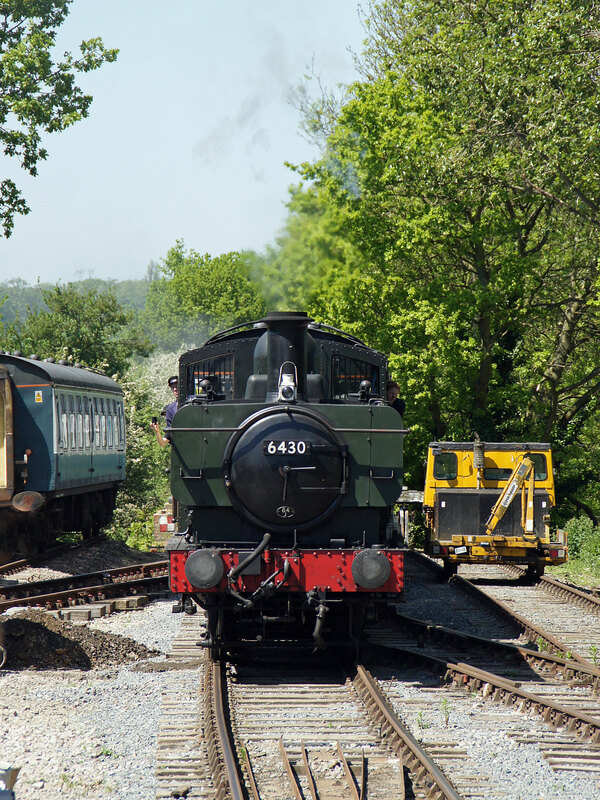 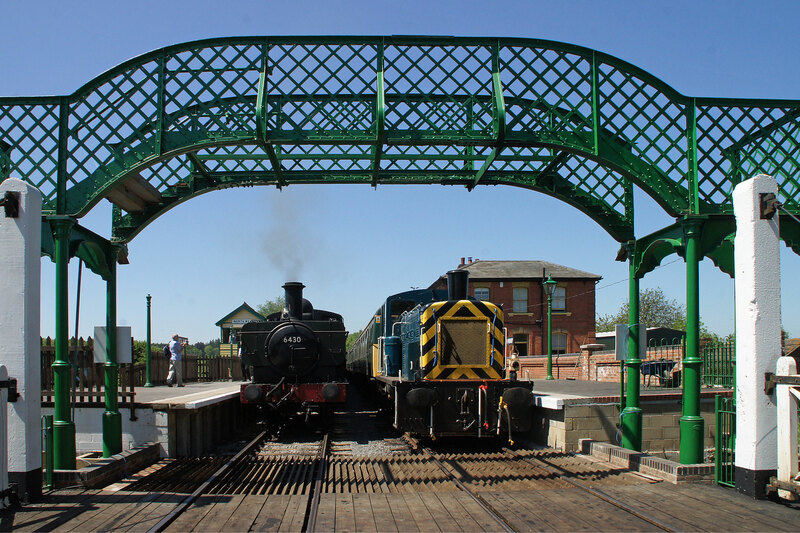 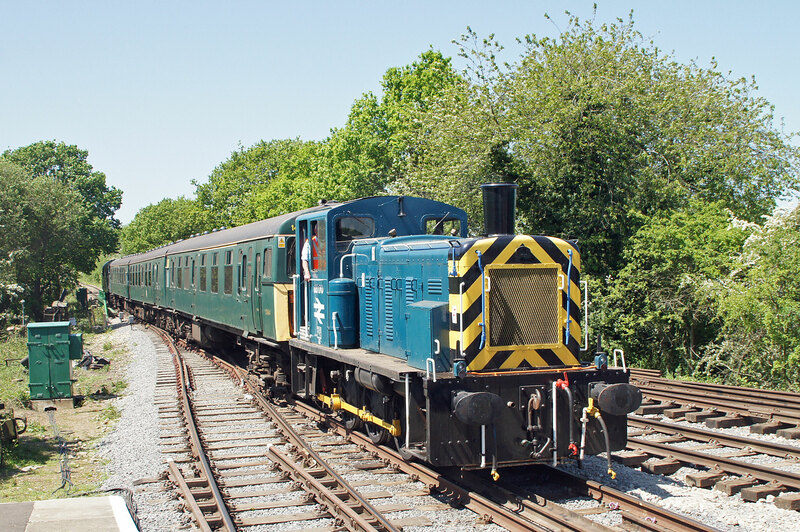 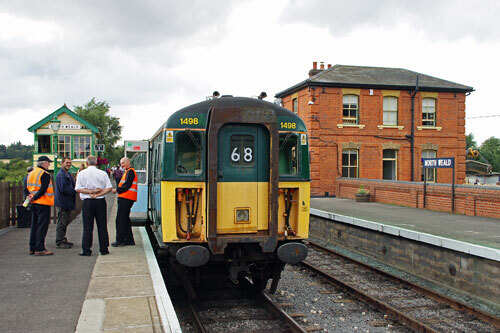 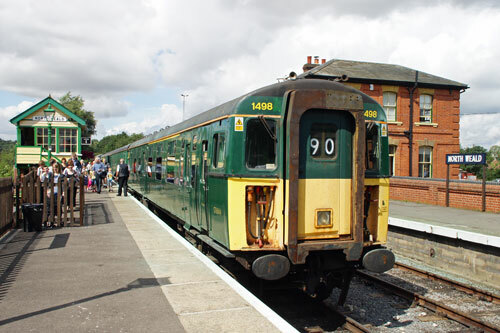 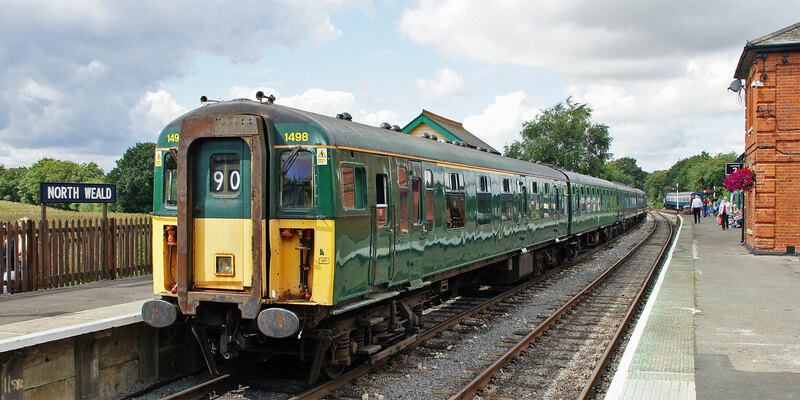 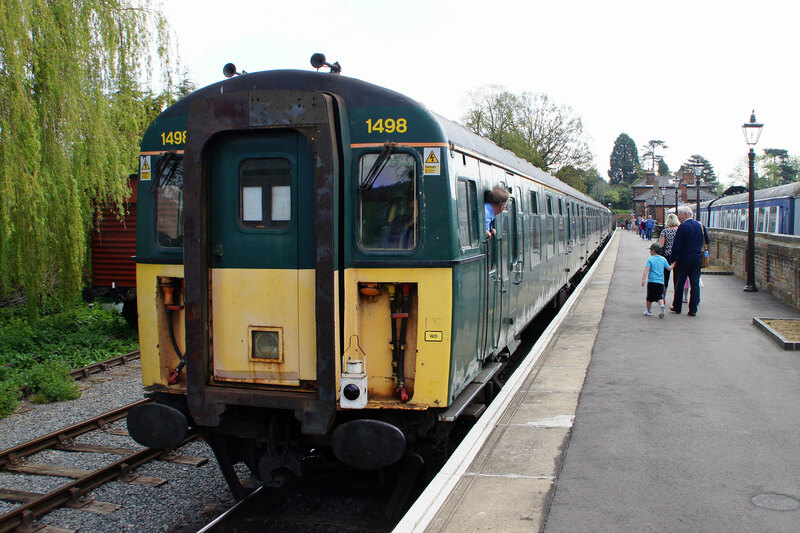 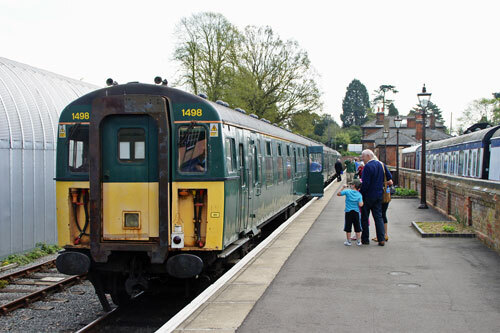 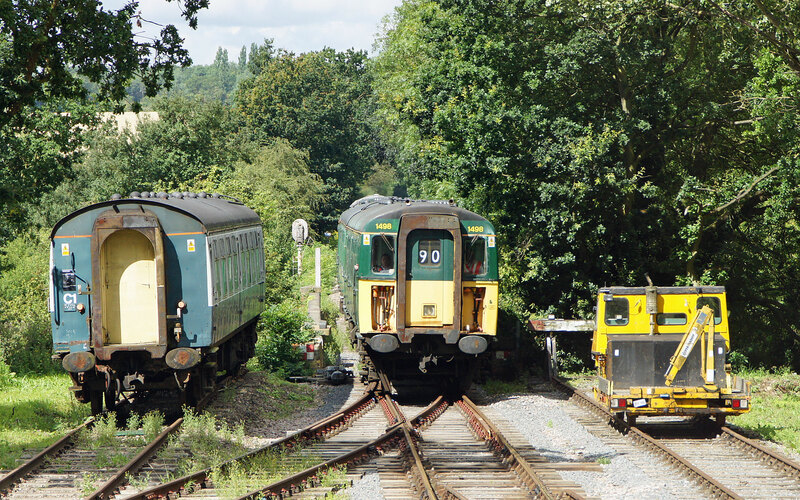 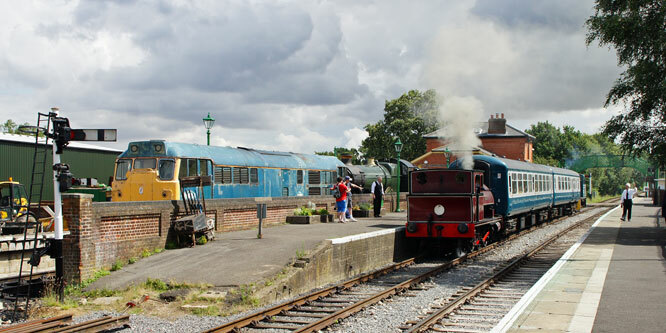 After a short visit to Felixstowe Dock L.150 moved to the Epping Ongar Railway for two weekends in June and July commemorating the Metropolitan Railway's anniversary. 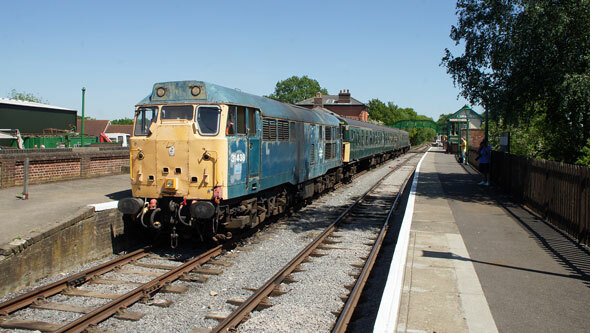 Class 37 number D6729/37 029 is resident on Epping Ongar. 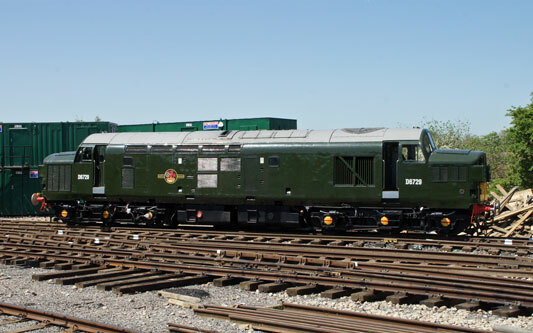 Following its recent withdrawal from mainline freight workings, it has been restored and repainted into the original 1950-1960s livery it carried when it was based at nearby Stratford shed (30A). 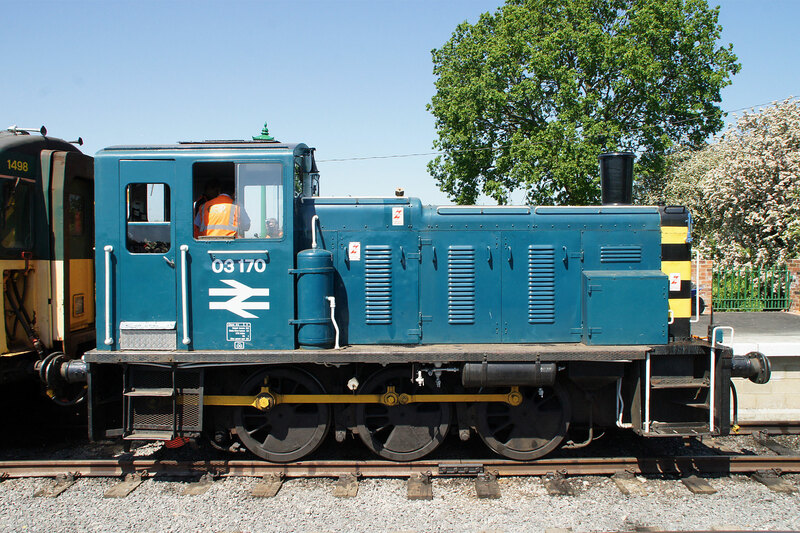 The locomotive is popular with many as it has its original bodywork, complete with split headcode nose, and is one of only a few in the whole country. 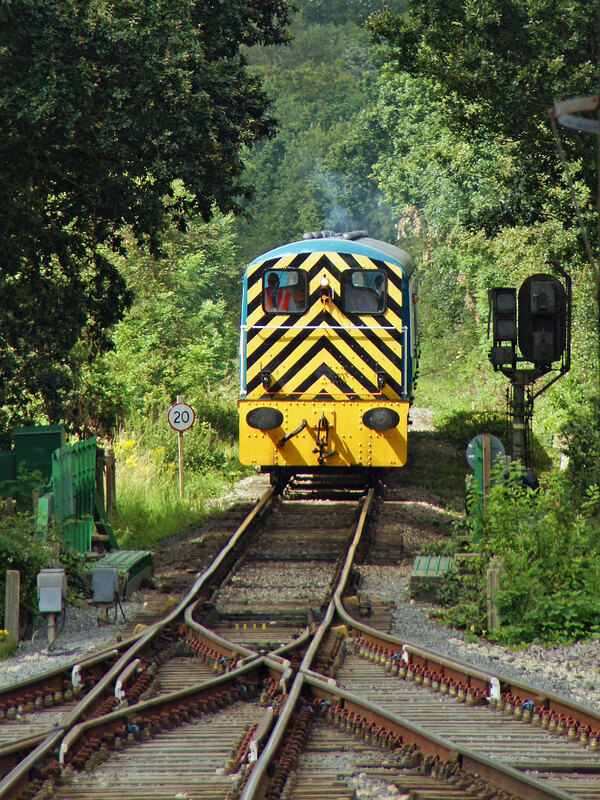 Class 31 number 31438 arrived on the Mid-Norfolk Railway on 24 November 2001, being delivered by road from Carlisle. The locomotive is one of a number of engines fitted with Electric Train Heating. 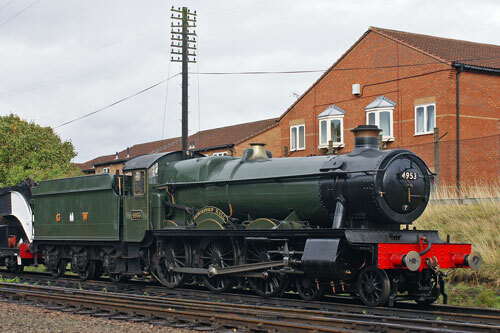 It was delivered new to Ipswich shed as D5557, being transferred to Norwich between 1961 and 1965. 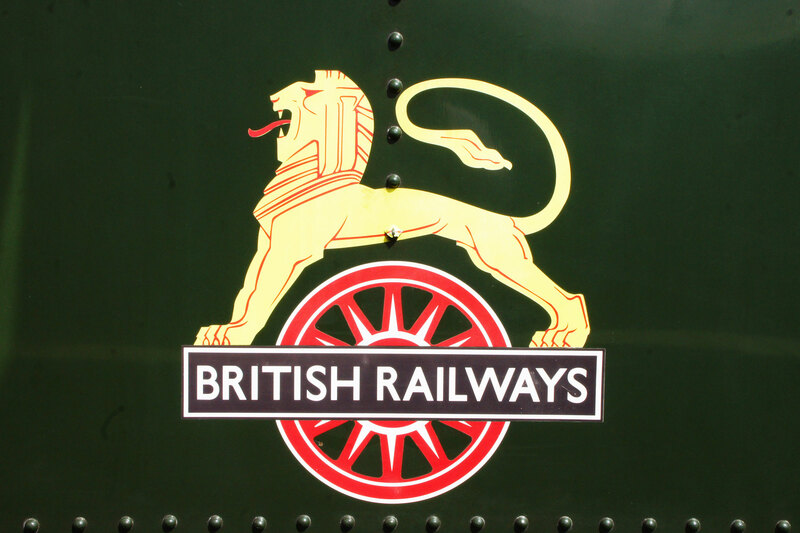 The locomotive previously carried a unique livery of Brunswick Green with BR arrow symbols on all four cabsides and the numbers behind the doors. 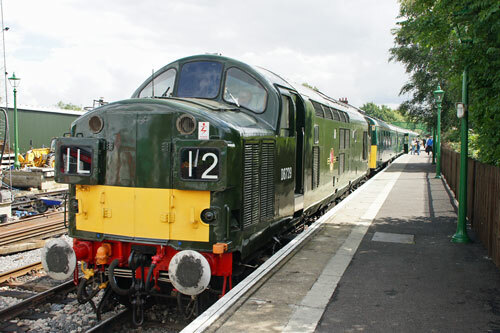 D5557 was listed as being for sale in late August 2011, and sold to the Epping Ongar Railway by September, leaving the MNR after their Autumn Gala. 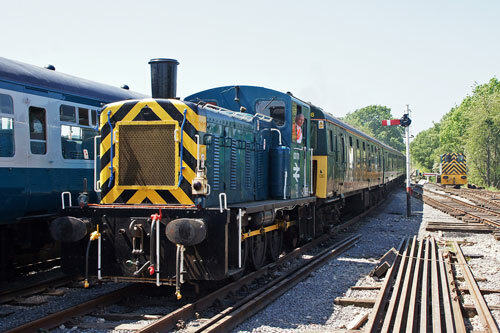 Class 25 1,250 hp Sulzer 6-cylindered engine D7523 is resident on Epping Ongar. 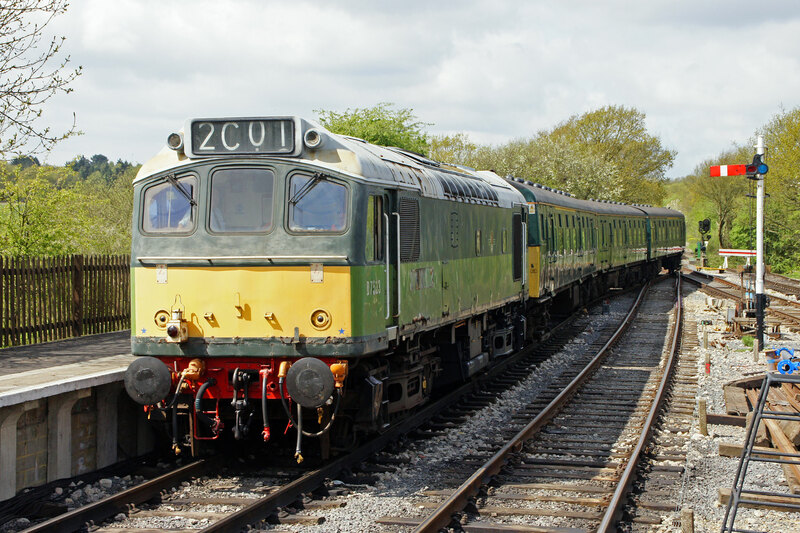 The BR Class 25 originally numbered 327 examples built, of which 20 examples were saved and about 11 are in operation on heritage lines around the country. Our engine is a 25/2, which featured restyled bodywork (without the earlier gangway doors in the front) and slightly different air intakes from the first batch built. 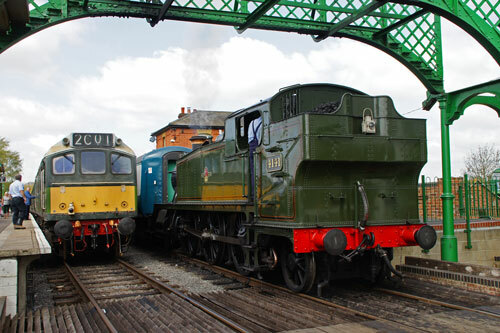 While the Southern and Eastern Regions of BR were never allocated this class, they were often seen in East Anglia on inter-region passenger and freight workings and excursion work. The construction of D7523 started with the main support frames being laid during early 1964, delivery to the Nottingham area occurring in January 1965. 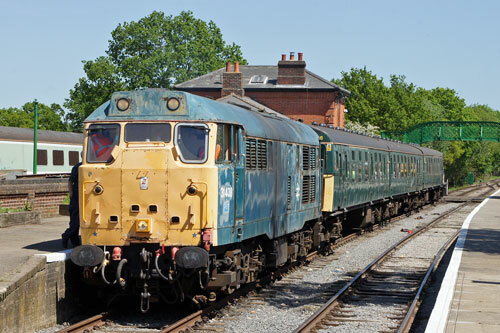 The locomotive remained a Midland Region based machine throughout its career which ended with withdrawal on 19 March 1987, being one of the last locomotives of the class in service. The engine was fitted with air brakes (making it dual braked) during a routine overhaul in 1978. 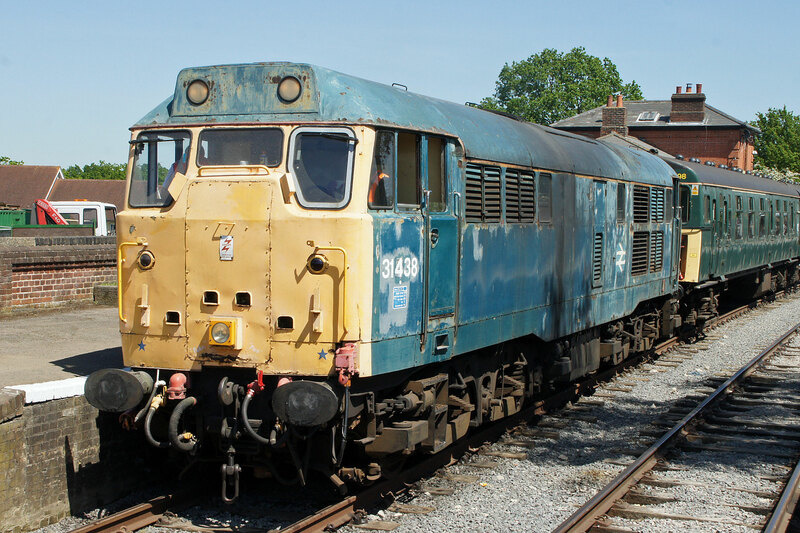 D7523 was officially withdrawn at midday on 19/03/1987 at Crewe, on 23/03/87 it was sent along with several other locomotives to Vic Berry's scrap yard in Leicester. 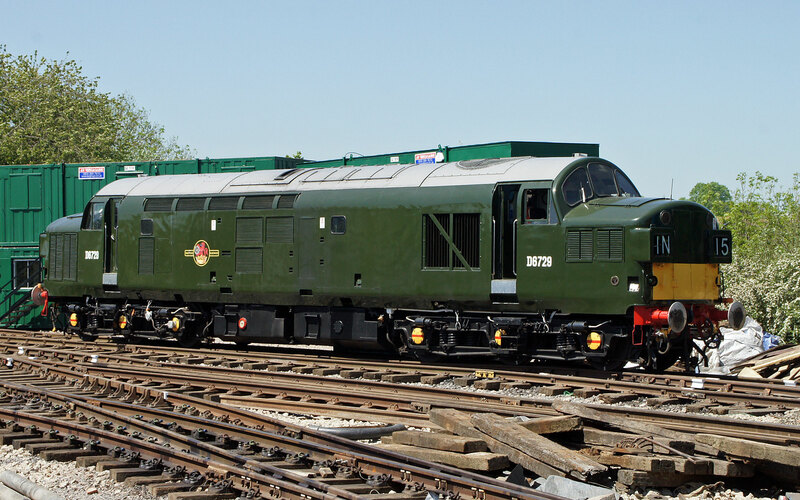 Normally the processing of scrap loco's and dumping them on the 'pile' only took a few days but for some reason D7523 (or 25173 as she was) lingered and on 13/09/87 left the yard again and returned to Crewe works for repairs. This was unexpected as all of the class had been officially withdrawn in March 1987. Over the following two years the loco alternated between Crewe works and Berry's yard, each time it visited Crewe it received further repairs. 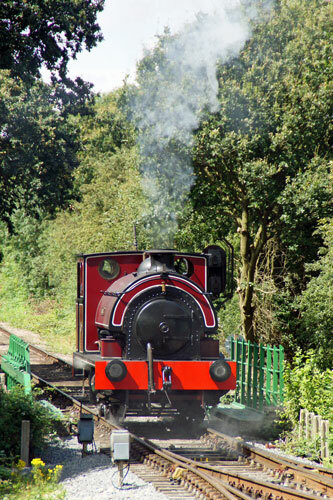 Finally on 01/06/1989 the locomotive that refused to be scrapped left Crewe and headed for the Dean Forest Railway and into preservation. D7523 spent 15 years in service at the West Somerset Railway, proving to be a useful engine for both light passenger and engineering trains, being maintained to a very high standard by the Diesel Electric Preservation Group at Wiliton, before coming to Epping Ongar Railway in September 2011. 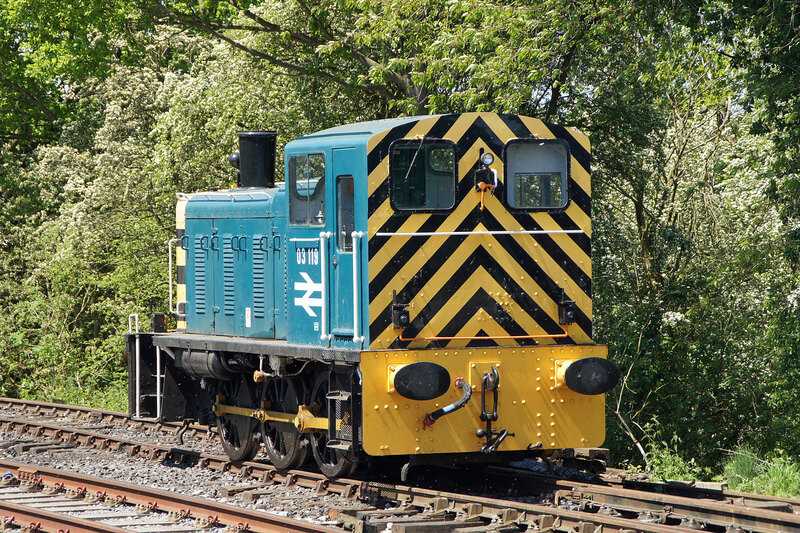 03119 is a unique engine as it was one of the specially modified Class 03 shunters which was modified to have a "cut down", reduced height cab to enable it to work the Burry Port & Gwendraeth Valley branch which had lower bridges, and fitted with air operated controls so they could be worked in pairs to cope with the heavy loads. 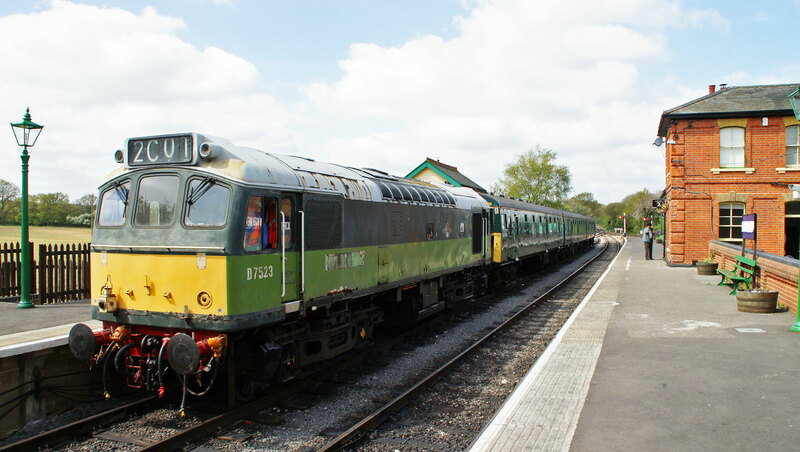 Built at BR Swindon Works and introduced in September 1959 as D2119, it was allocated initially to Danygraig depot. 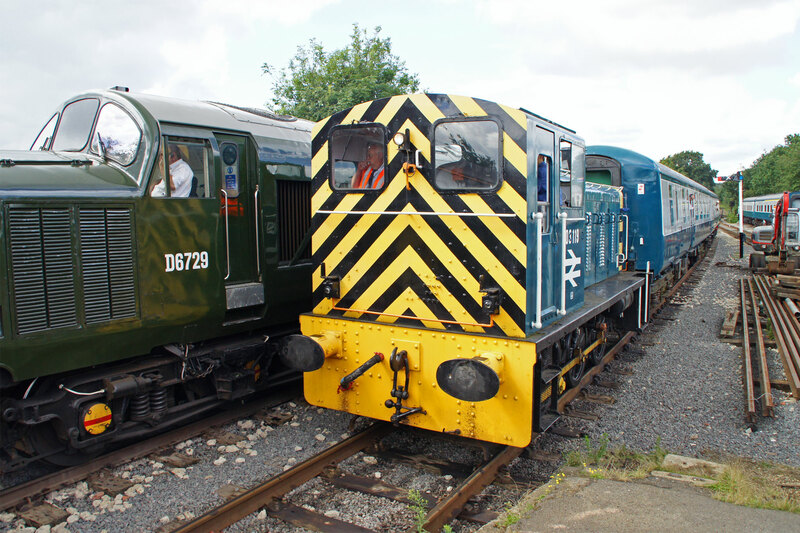 Class 03 shunter; 204 BHP Drewery diesel mechanical shunter. 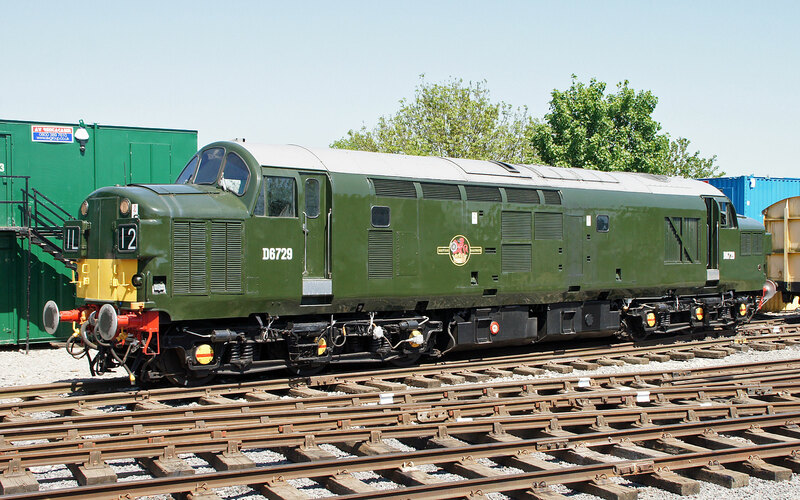 Delivered new to British Railways as D2170 in late 1960, it was withdrawn in 1989. This is a class of locomotive that has a long history of working in East Anglia, members of the class being allocated to Stratford, Colchester, Ipswich and Norwich Depots up until the late 1980s. This locomotive has dual (air and vacuum) braking systems. 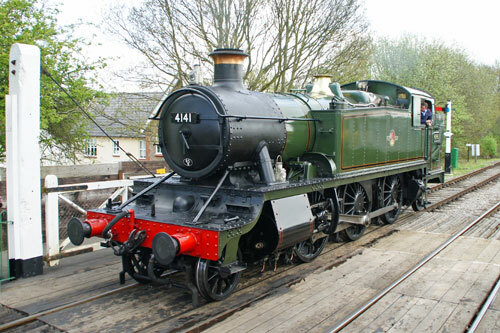 Its claim to fame is that it was the last 03 converted and overhauled at Swindon works before they closed. 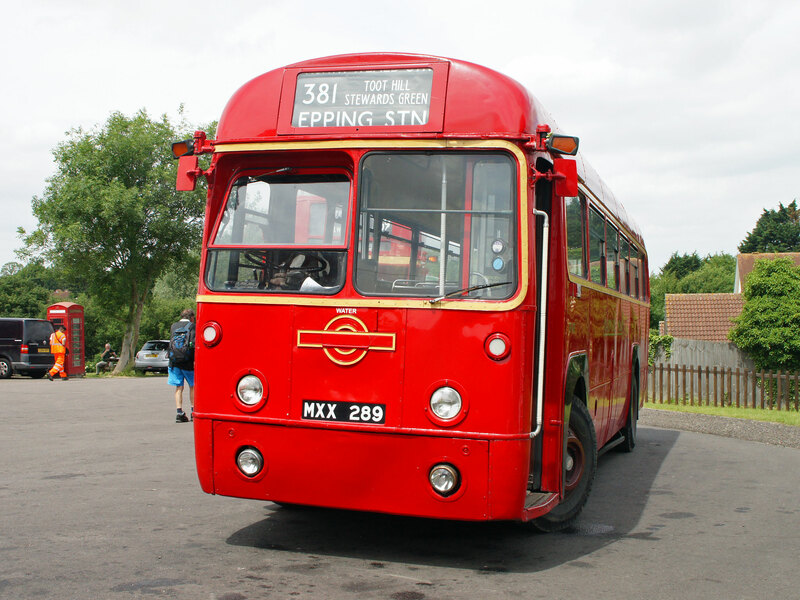 The Epping-Ongar 3CIG is one of the Phase 2 units, which entered service in 1960s. 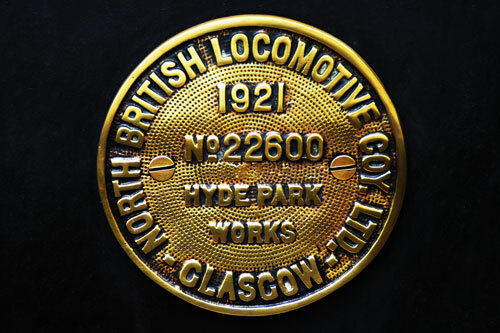 It was previously numbered 1888, 1223, then 7423. 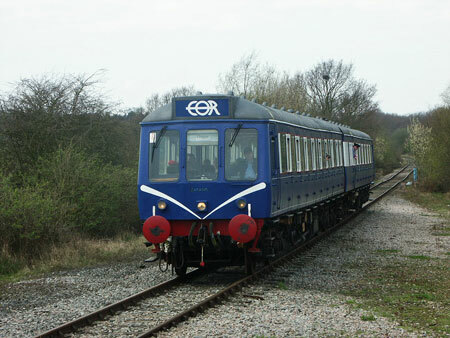 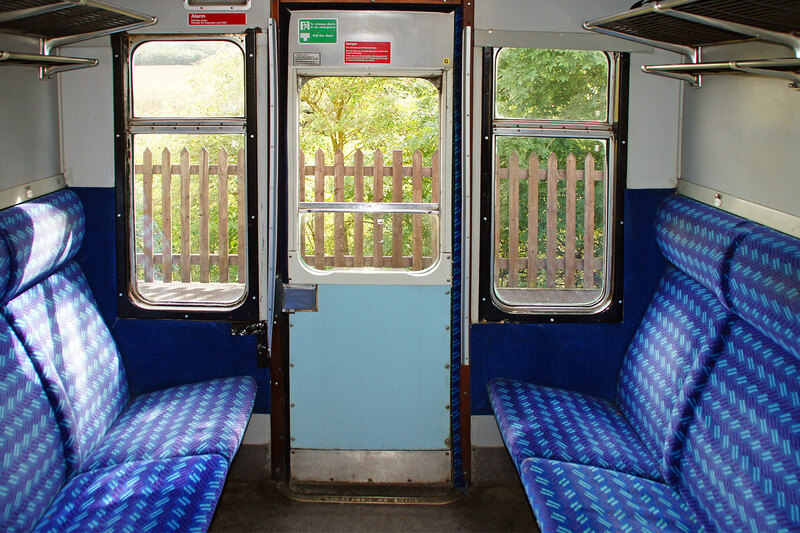 The unit was originally a 4 coach electric unit, and entered BR service in the corporate blue & grey livery. 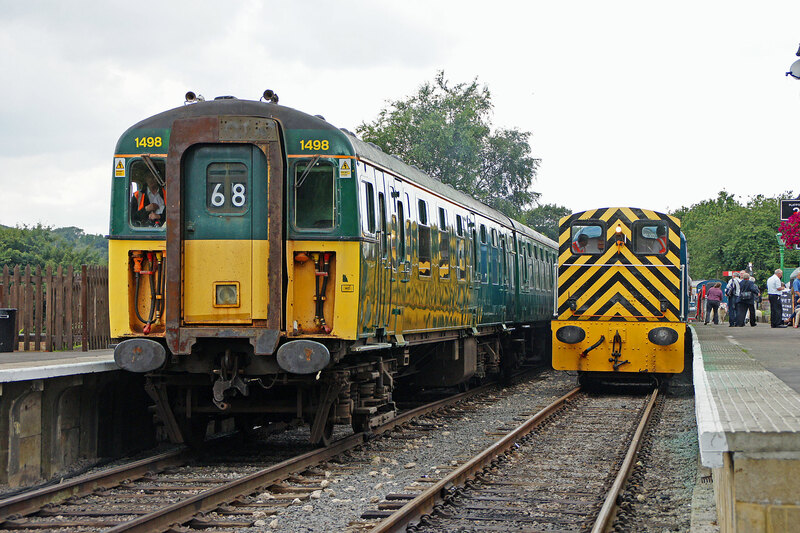 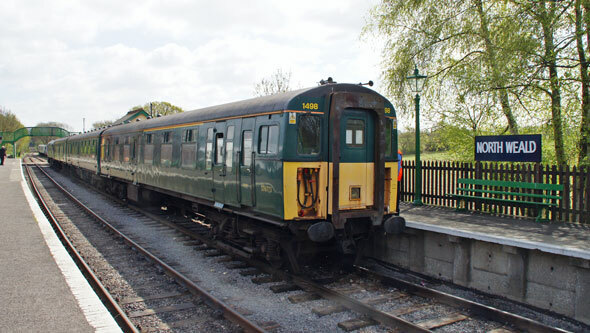 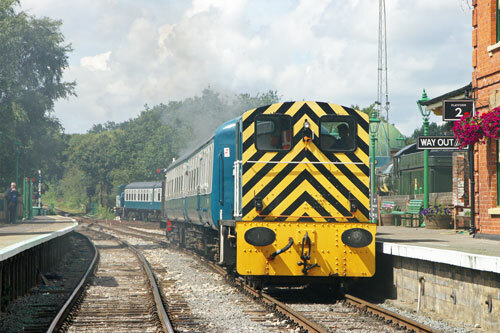 The unit became famous as one of the last "slam door" EMUs in mainline service, seeing out its final days on the Lymington Branch, gaining the nick-name of Lymmy Slammer. 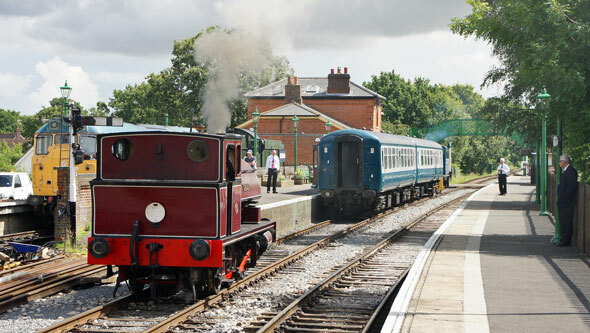 South West Trains considered that due to the self contained nature of the Lymington branch it would be more cost effective to continue Mk 1 operation. On this basis SWT bought and refurbished two British Rail 4CIGs / Class 421 units to exclusively operate services on the line. 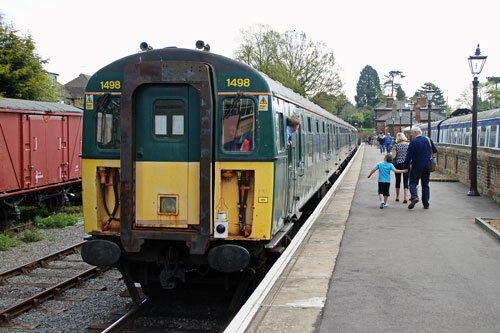 Work carried out on the units included the fitting of central door locking and other safety features to allow them to remain in service beyond the November 2005 deadline for the withdrawal of slam-door stock and the reduction of the original 4 carriage units to 3 carriages (3CIG) to address the extreme height difference between the train and the platform at Lymington Town. The 3CIG carries the BR green livery with the painting diagram devised by WS Atkins. The unit was numbered 1498 and officially named Farringford at a ceremony at Brockenhurst railway station on May 12, 2005. The heritage service commenced on 12 May 2005 and an exemption was obtained to enable the use of the 3CIG units until 2013, at which point they were estimated to be life expired. 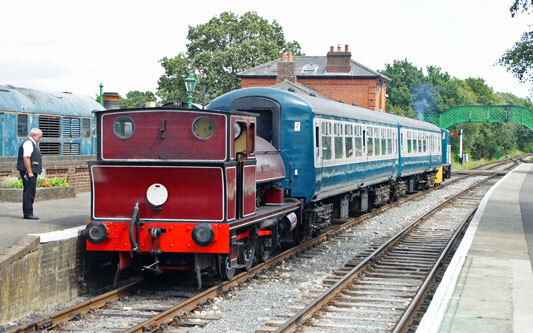 However, in Summer 2009 South West Trains announced plans to replace the heritage EMUs with more modern units. This change took place on the 23 May 2010, with the final 3CIG service departing from Lymington Pier on the 22 May 2010 at 22:14 and arriving at Brockenhurst at 22:24. 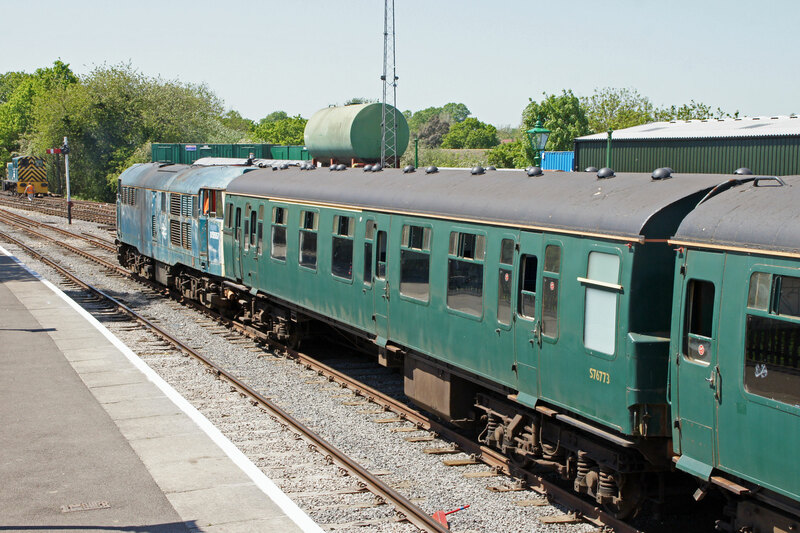 Epping Ongar Railway was delighted to have the opportunity to preserve this unit, and will use this on the branch with a diesel locomotive. 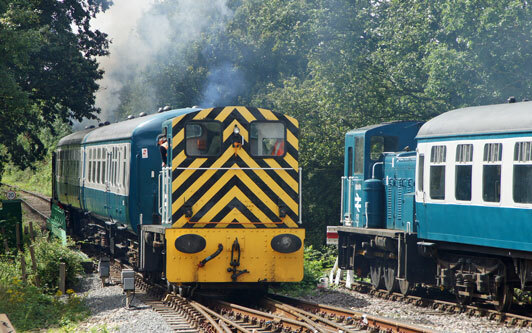 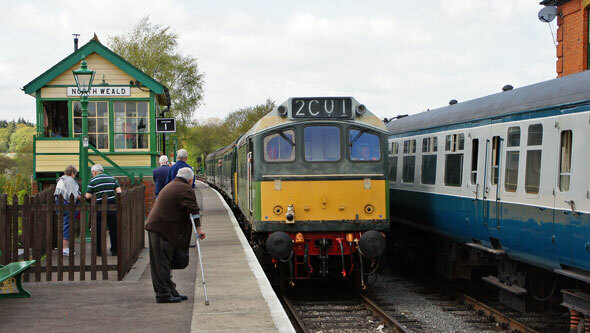 The railway is working closely with EMU societies, both to help with its preservation, and perhaps one day to once again see the unit push-pull with an appropriate diesel locomotive under control from the 3CIG. It has also run as a 4-car set with the addition of a standard green Mk1 coach. This section shows images from the period of the 2004-2007 DMU operation, all being taken in 2005. 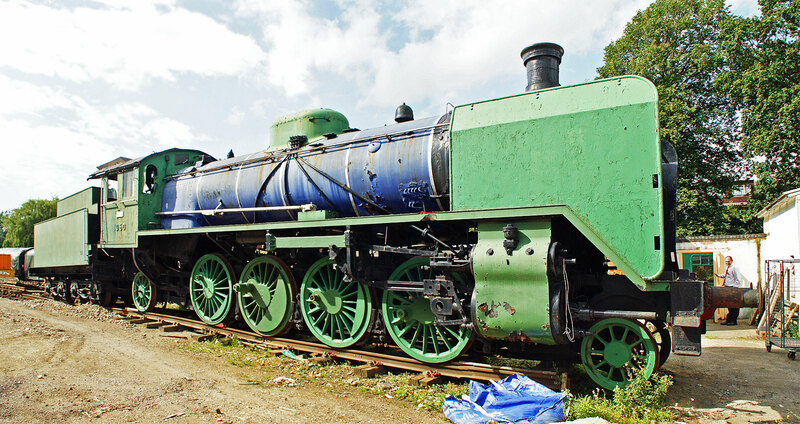 There were four unrestored broad gauge Finnish steam locos on the railway at that time, most of which have since been sold and moved. 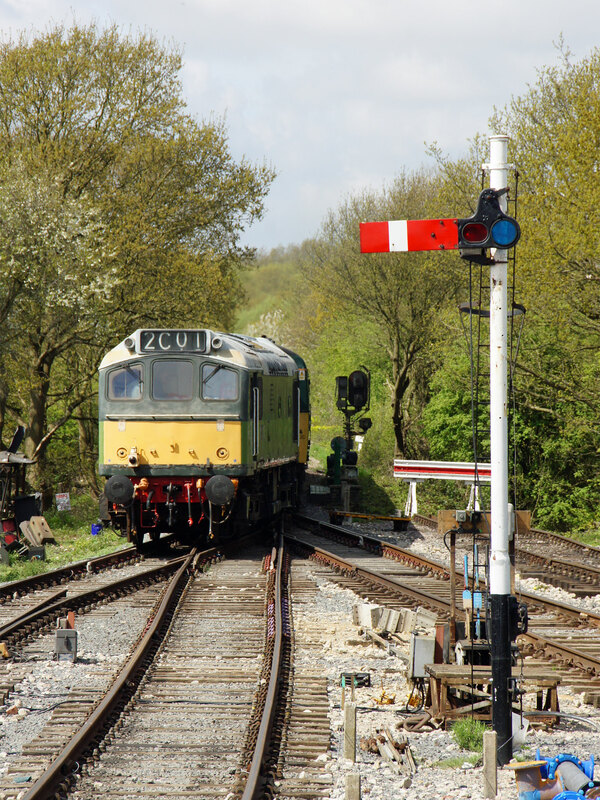 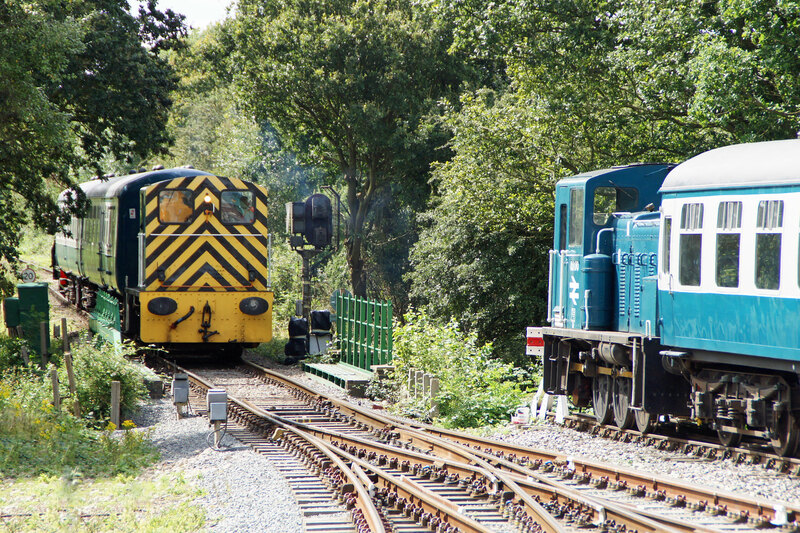 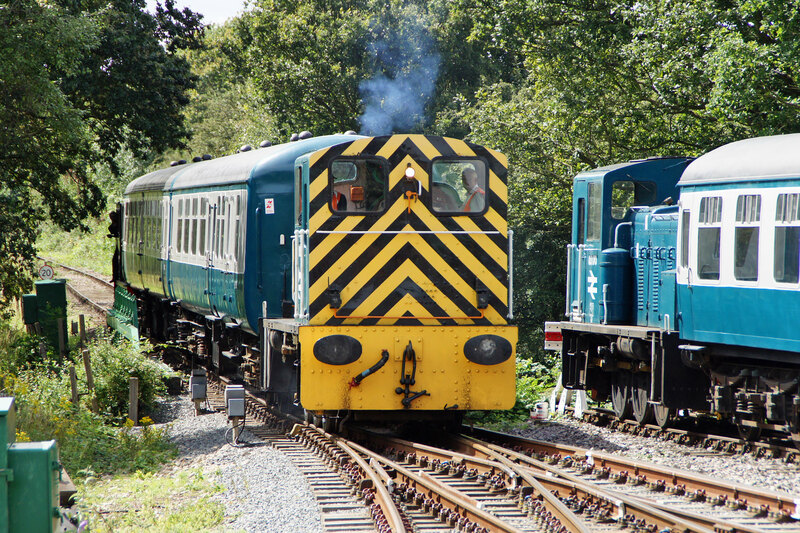 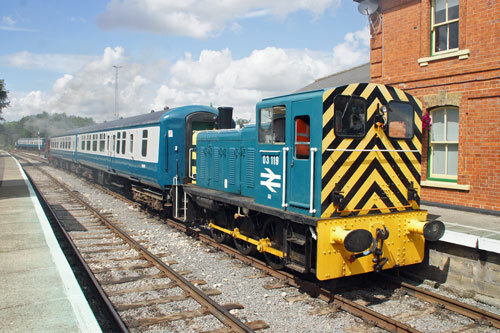 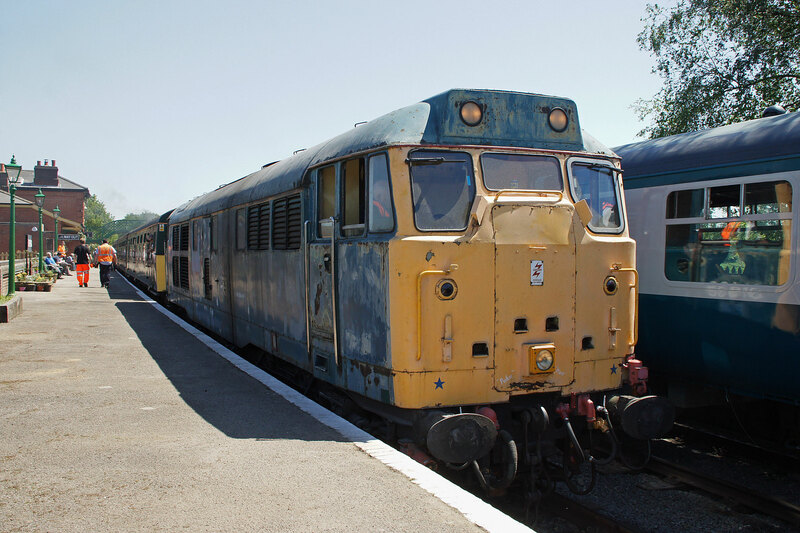 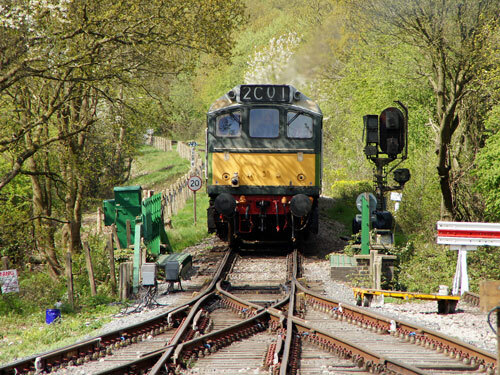 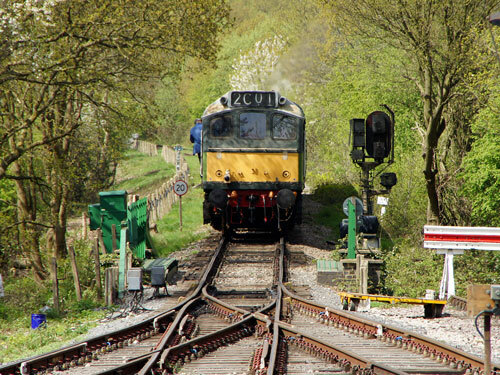 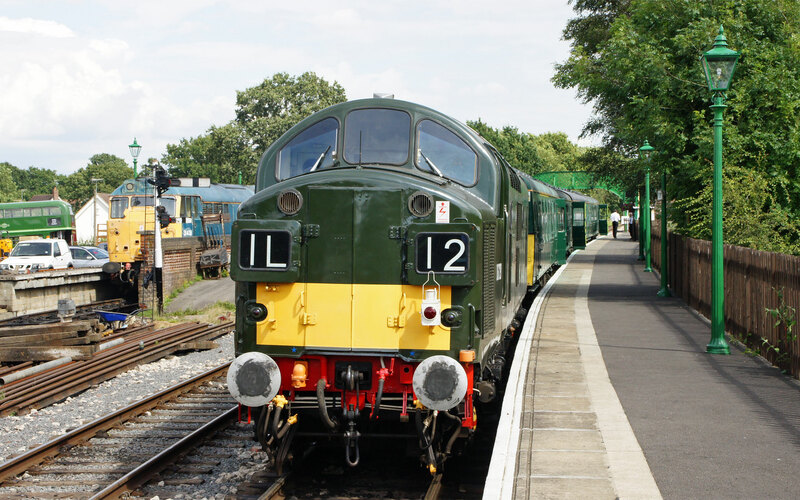 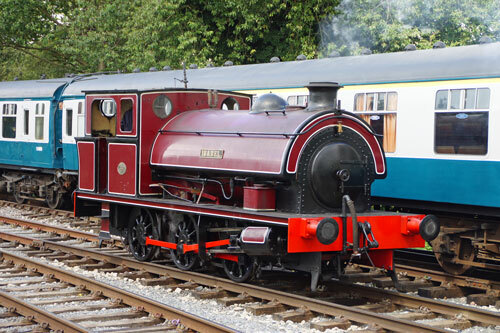 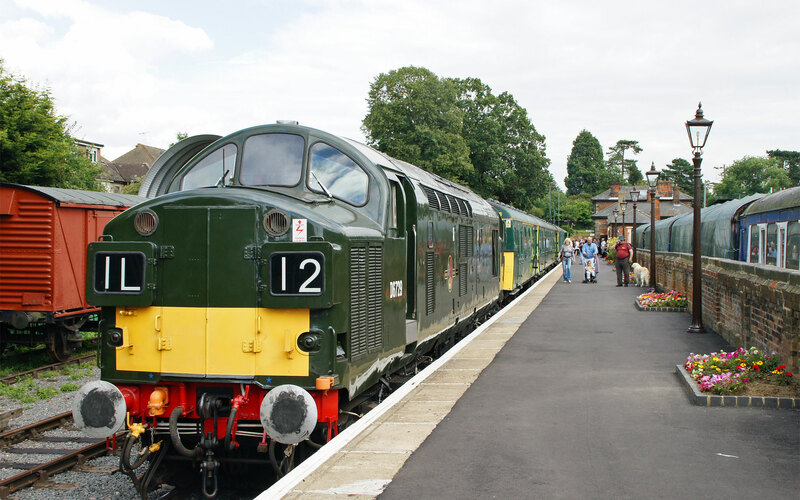 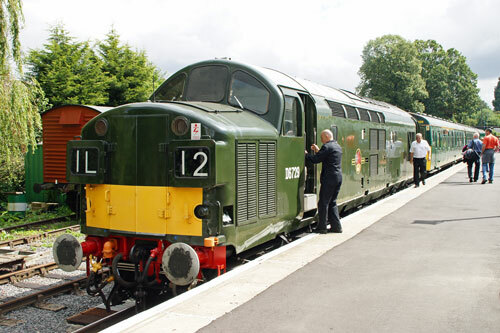 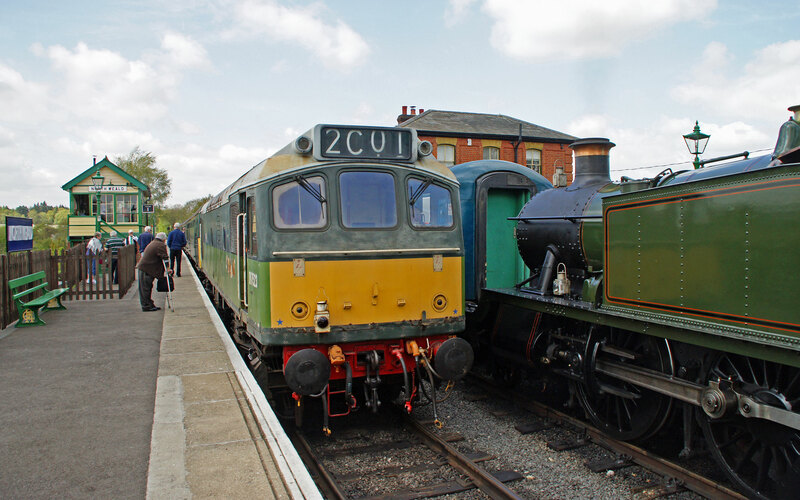 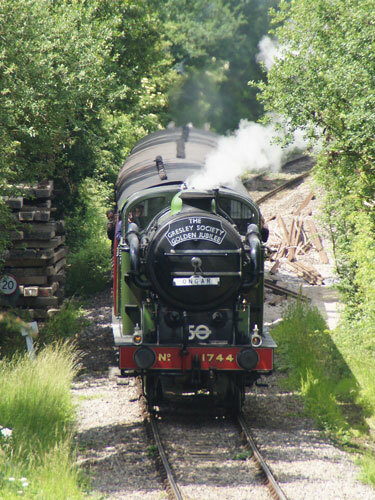 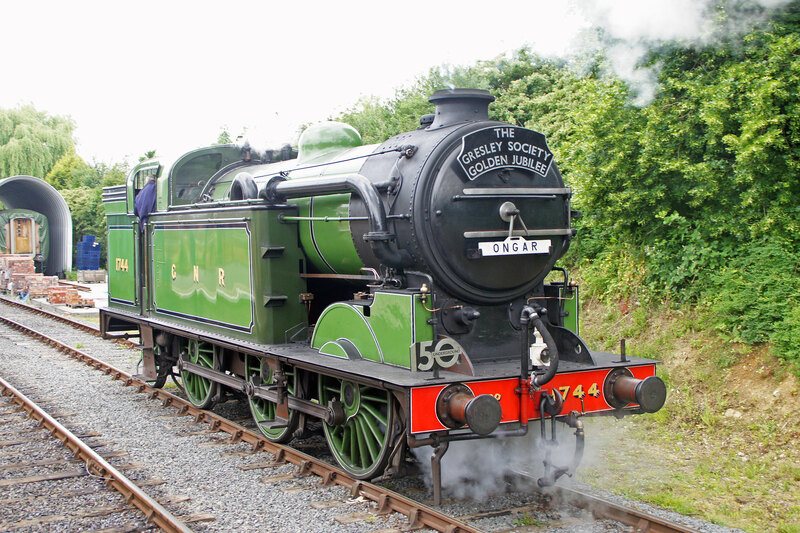 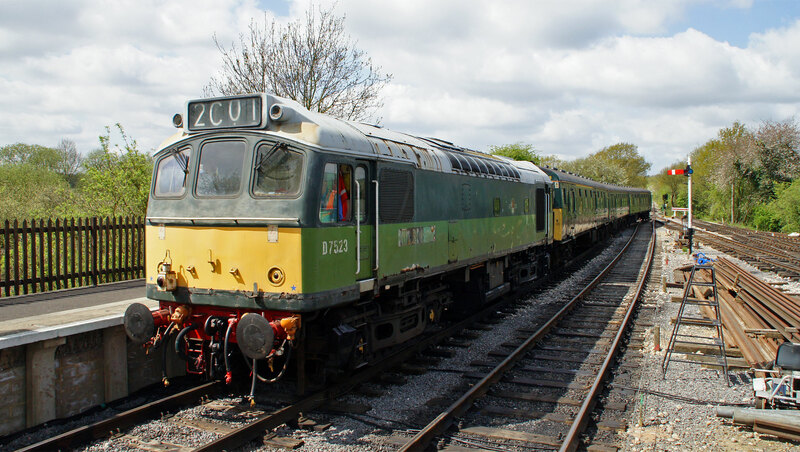 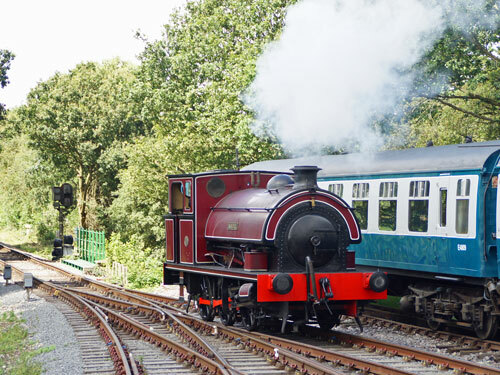 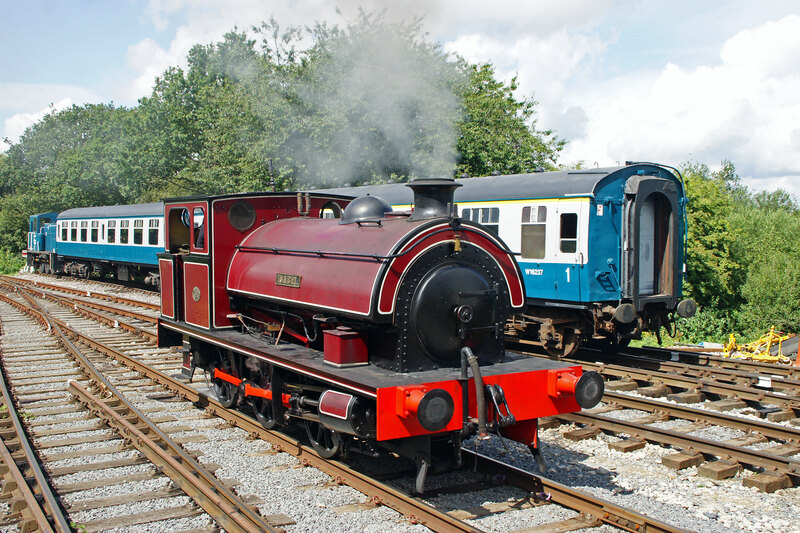 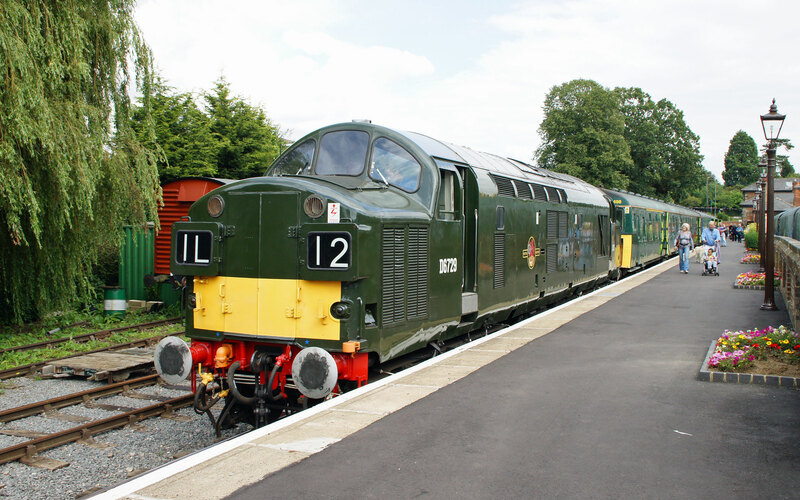 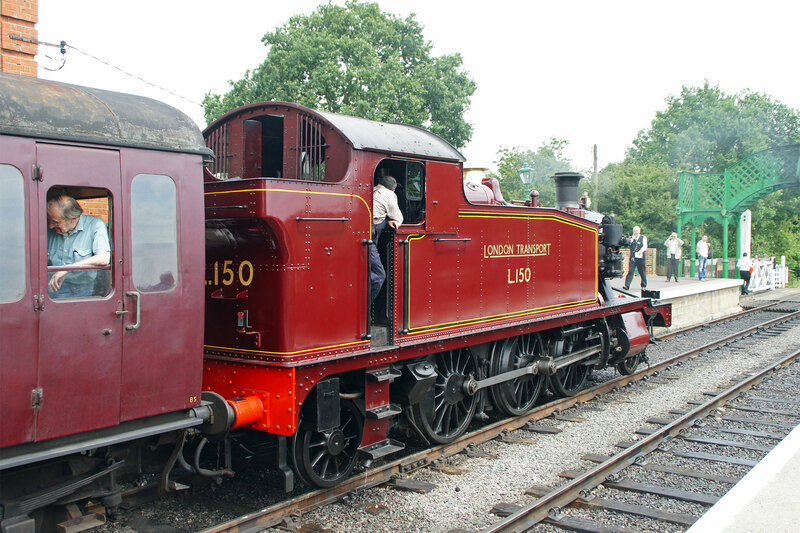 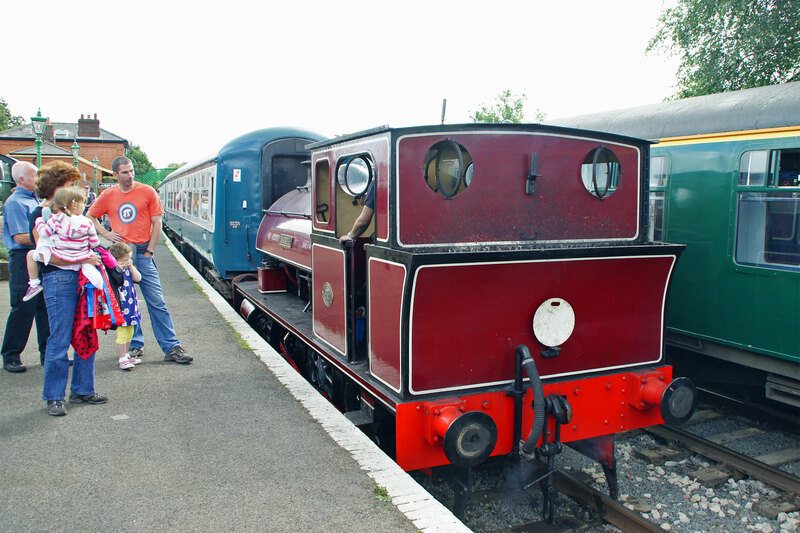 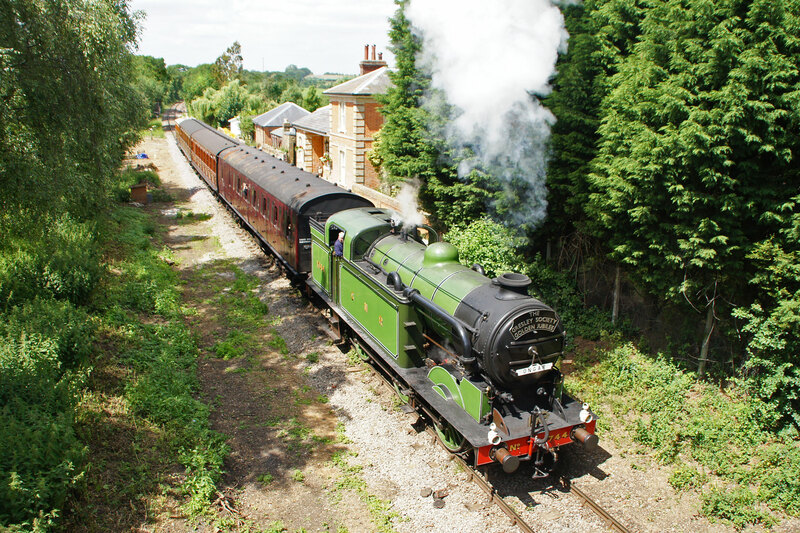 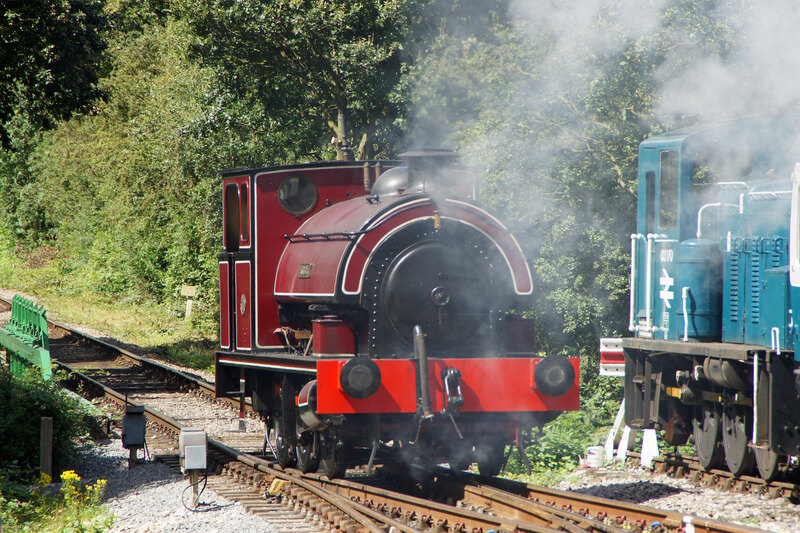 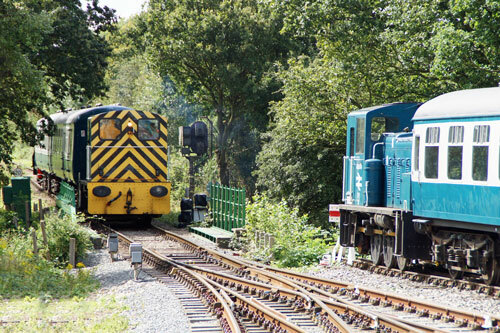 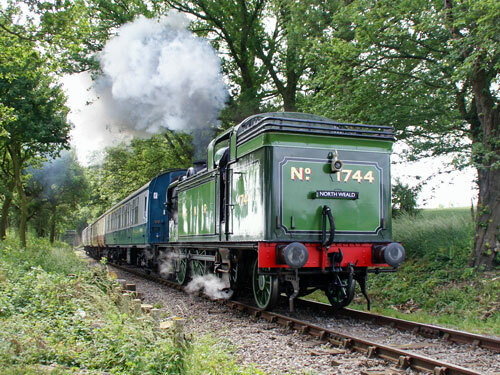 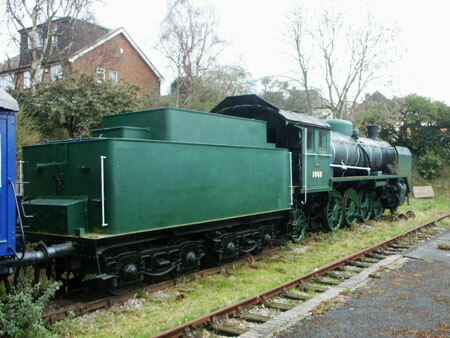 There is an appeal fund to buy this loco and move it to the Mizens Railway near Woking. 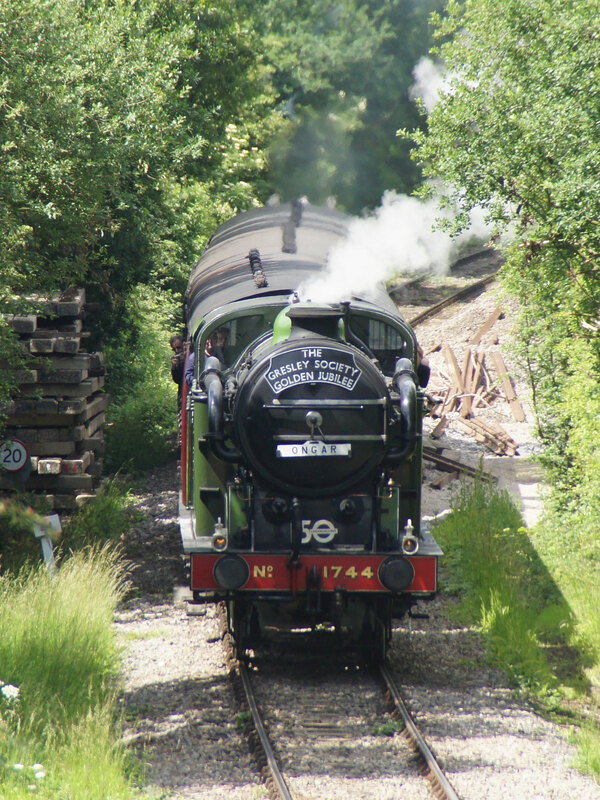 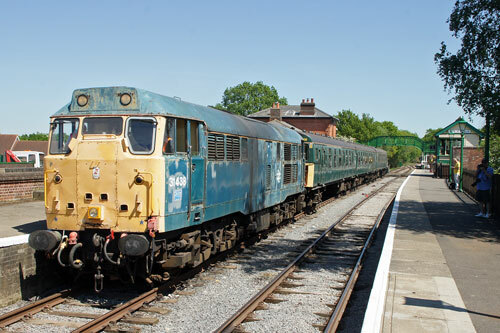 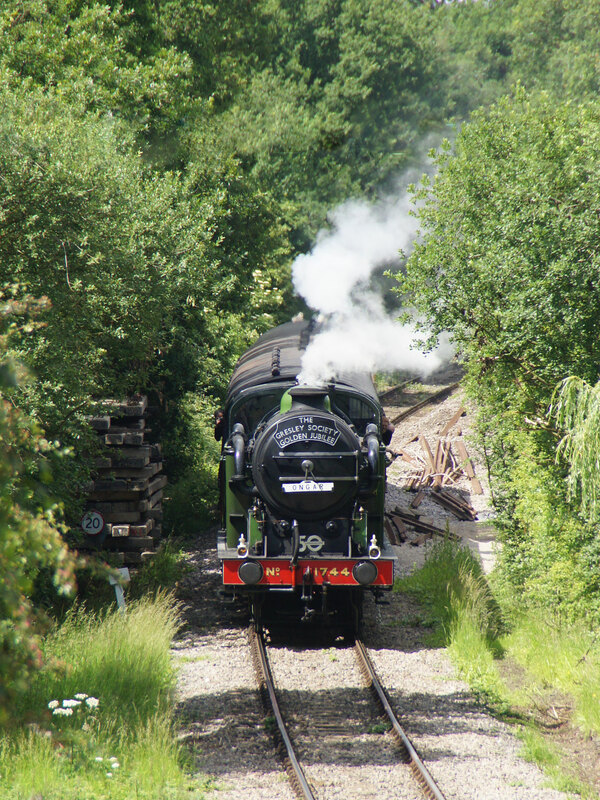 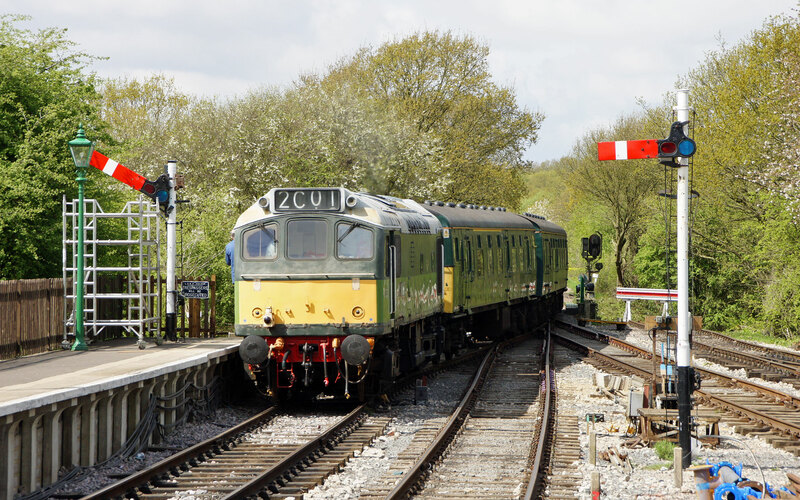 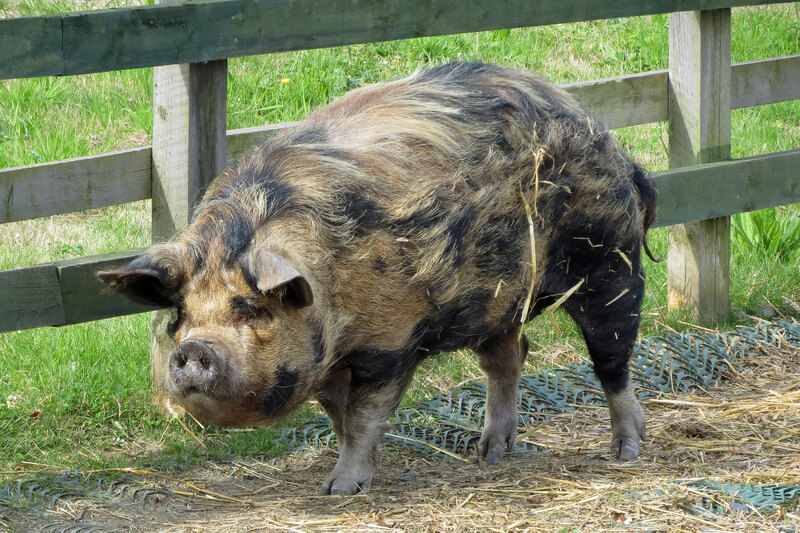 It was still at Ongar in May 2013. 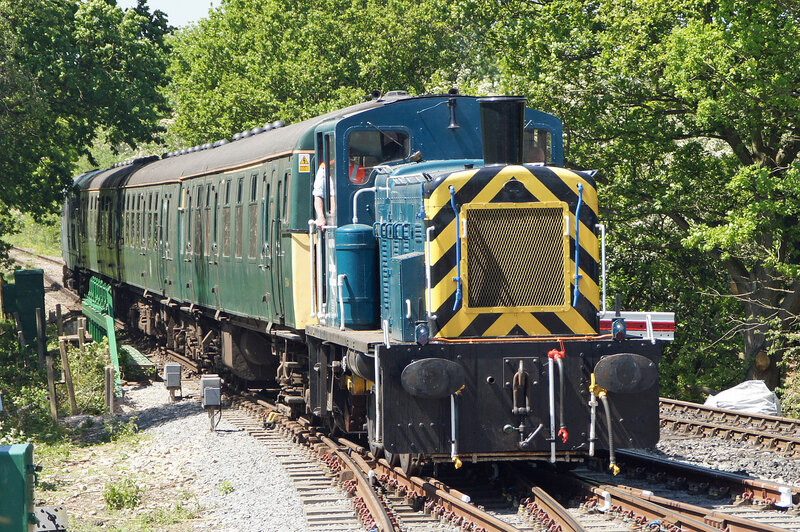 This loco was still on the railway in May 2013. 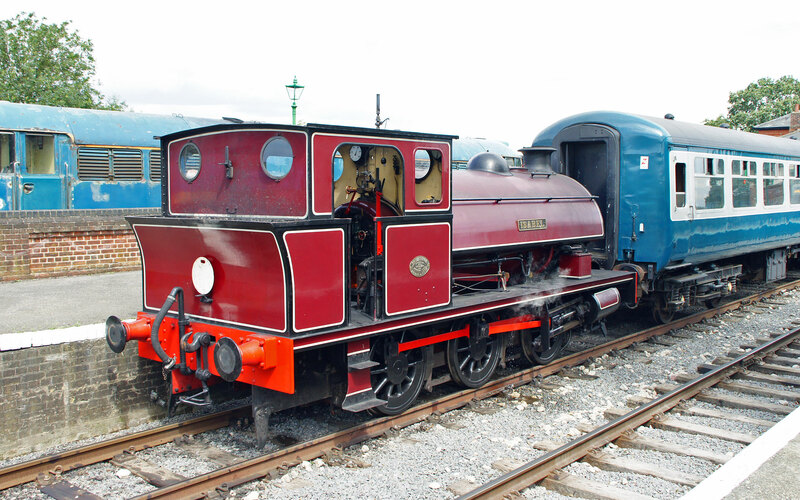 Vr1 class light goods locomotive (originally K5 class), 2-8-0 wheel arrangement. 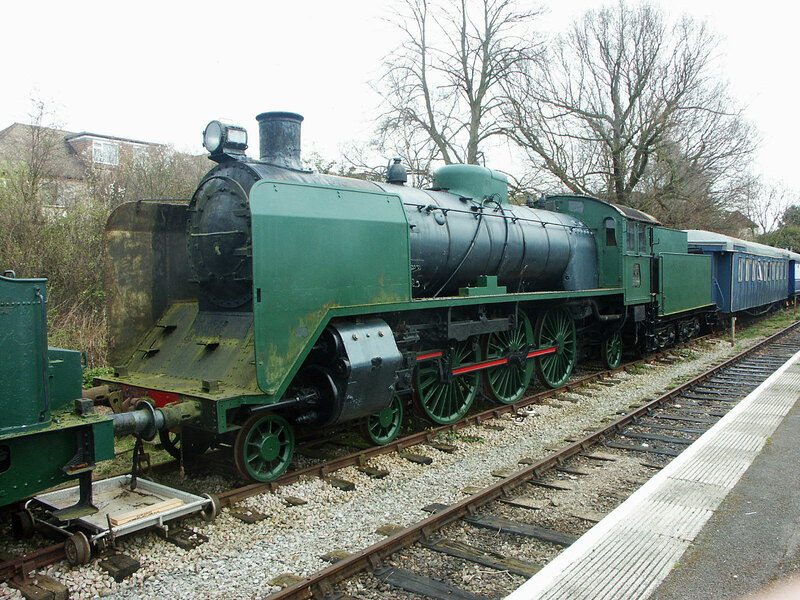 The Vr1 was the most numerous locomotive class in Finland, with 161 units produced, first 100 between the years 1927 and 1935 (by Lokomo and Tampella). This loco is no longer on the railway. 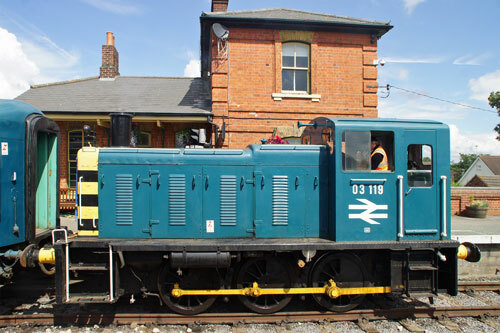 This is a Tk3-class (originally L1-class, the classification system was overhauled in 1942) heavy shunter. 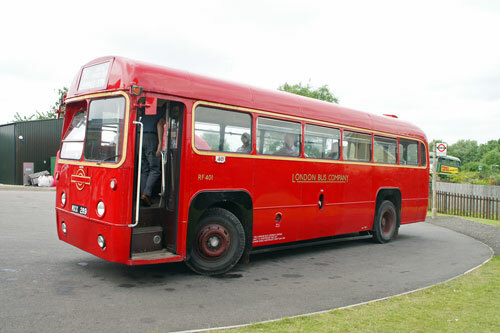 The class was nicknamed "kana" (hen), top speed 25 km/h. 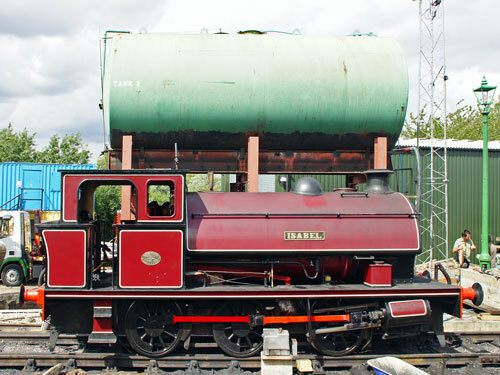 A total of 43 units were built between 1913 and 1927 by Tampella and Hanomag. This locomotive dates from 1925 and was built by Tampella. 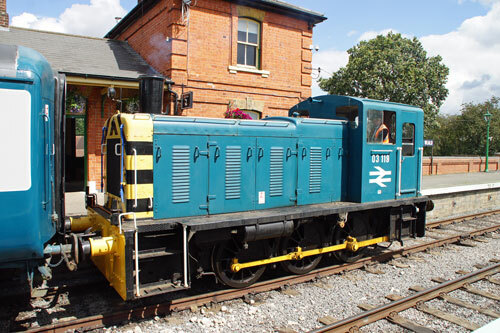 A total of 17 Tk3's survive according to Wikipedia. 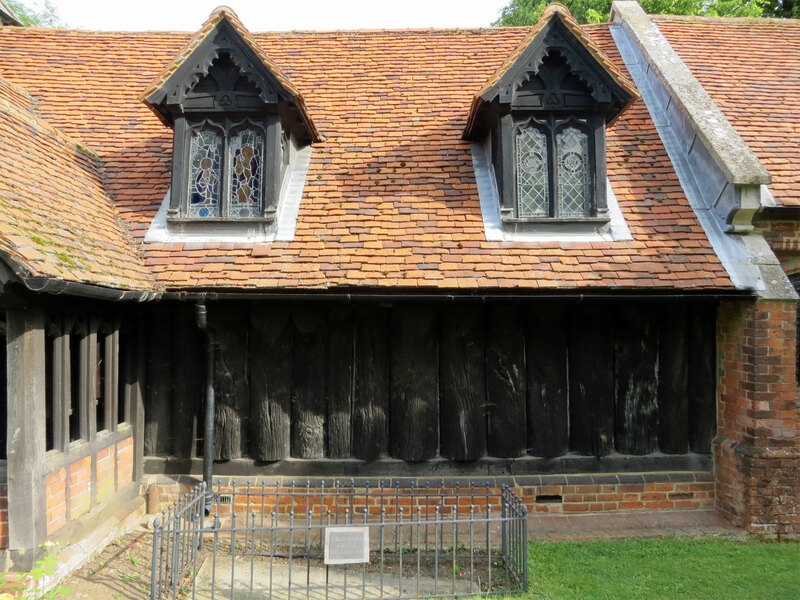 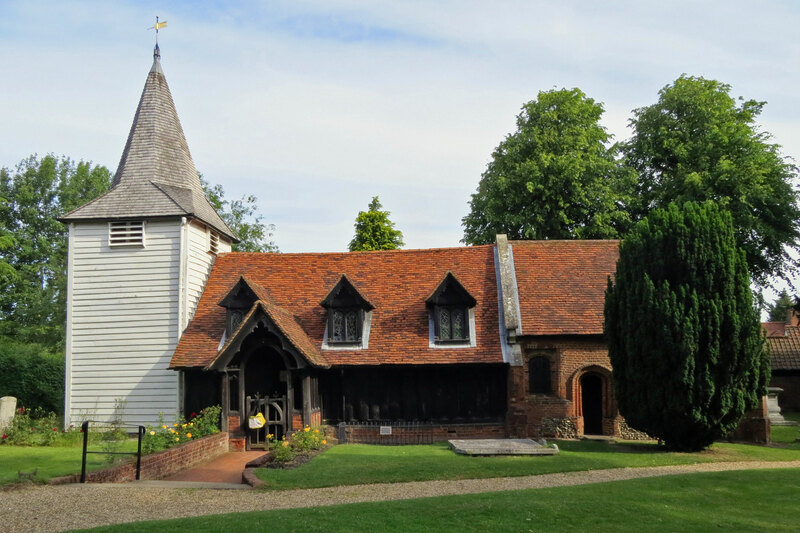 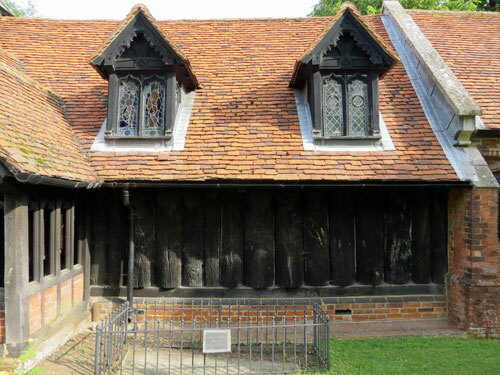 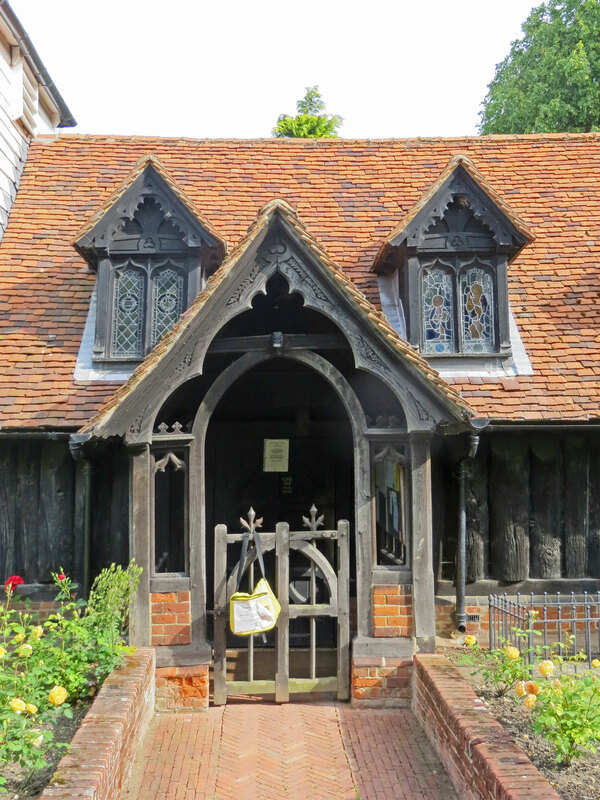 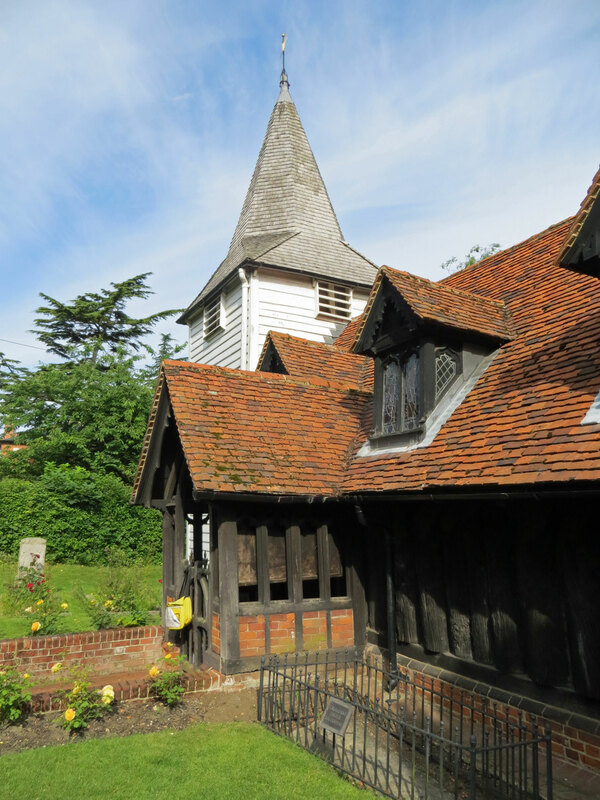 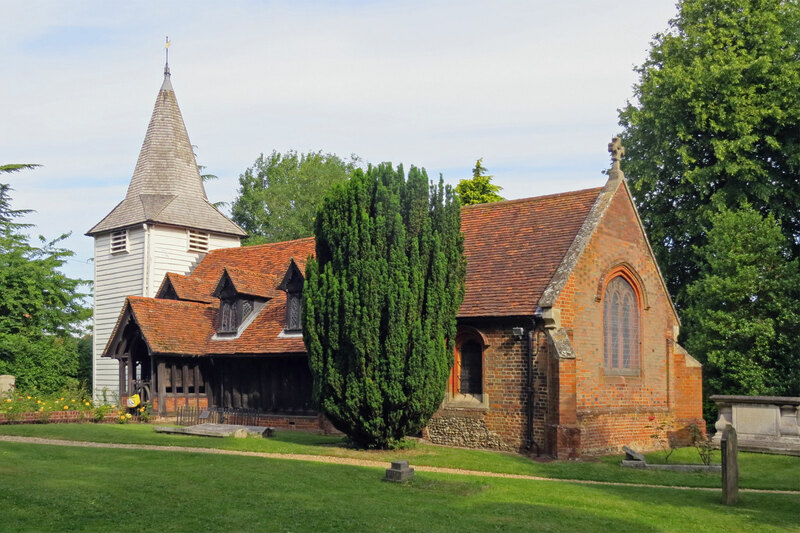 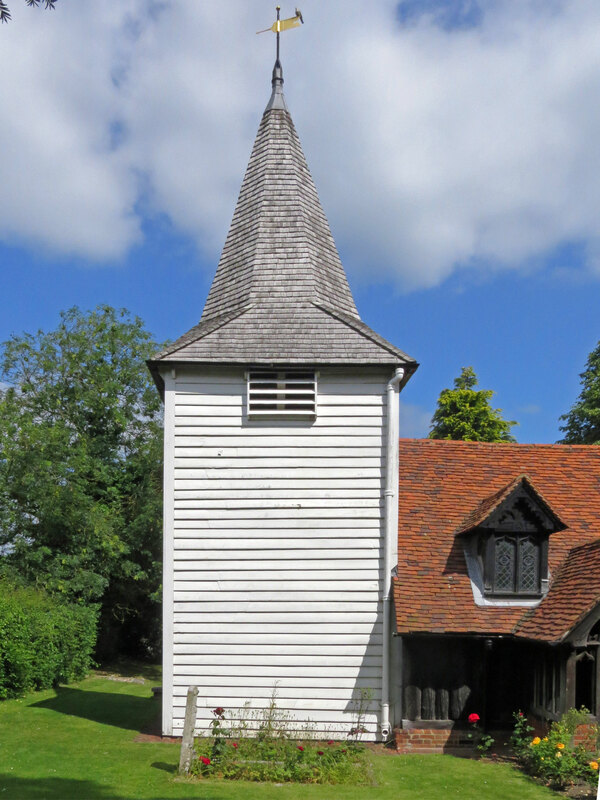 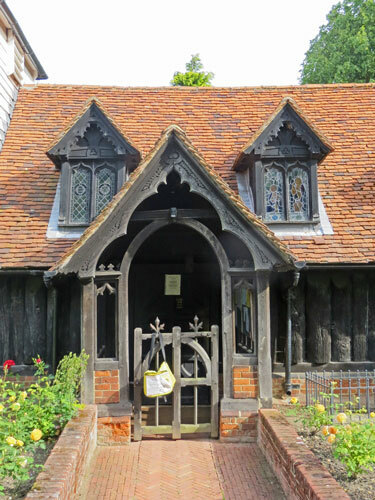 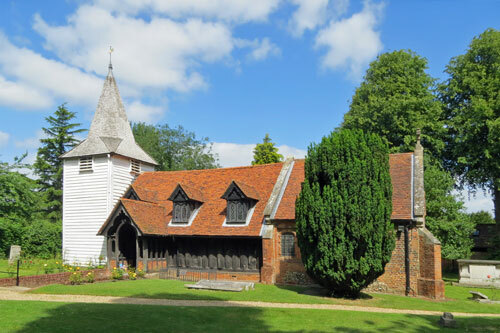 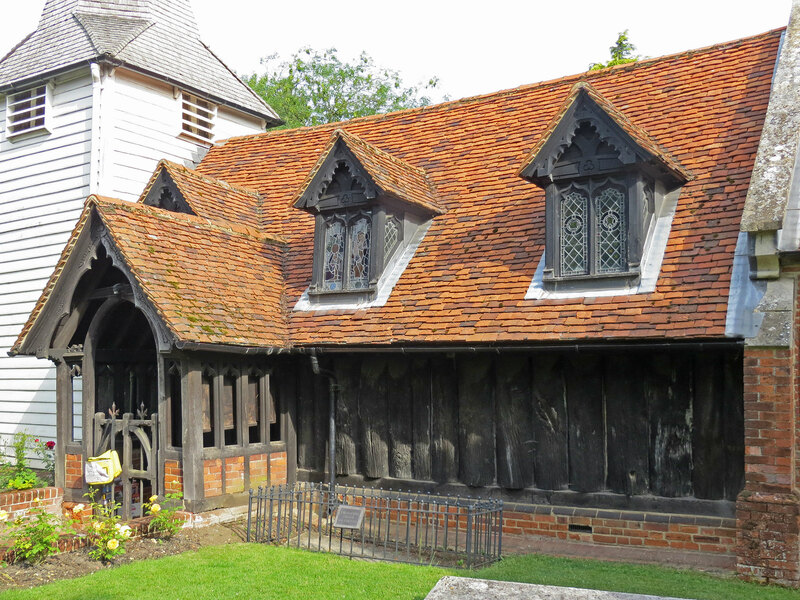 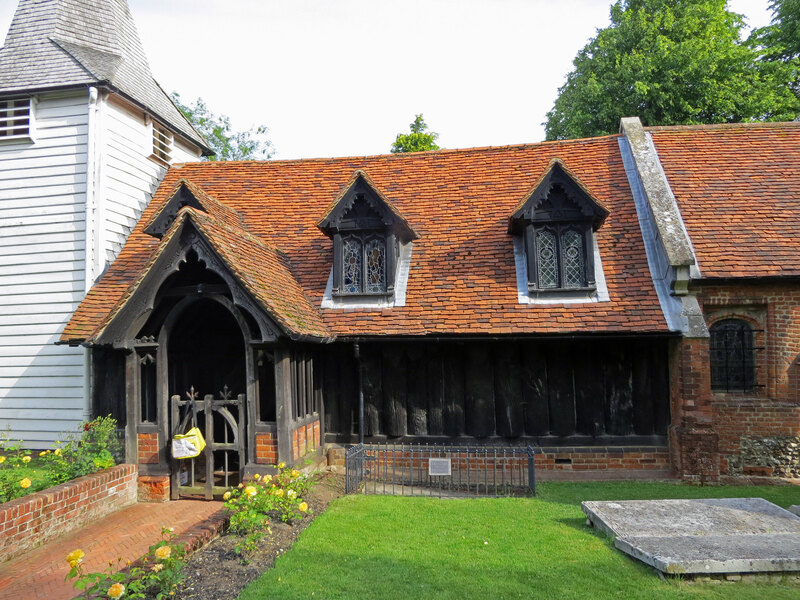 Greensted Church, in the small village of Greensted-juxta-Ongar, near Chipping Ongar in Essex, England, is the oldest wooden church in the world, and probably the oldest wooden building in Europe still standing, albeit only in part, since few sections of its original wooden structure remain. 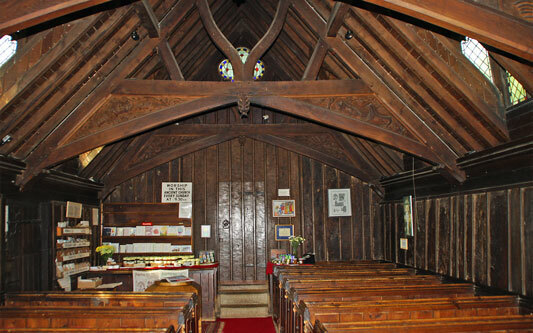 The oak walls are often classified as remnants of a palisade church or a kind of early stave church, dated either to the mid-9th or mid-11th century. 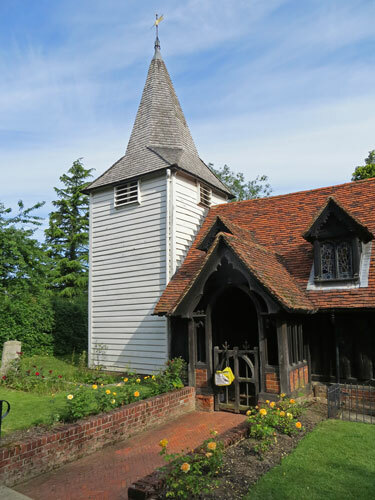 The church is close to the Epping Ongar Railway on the road between Ongar and Blake Hall station. 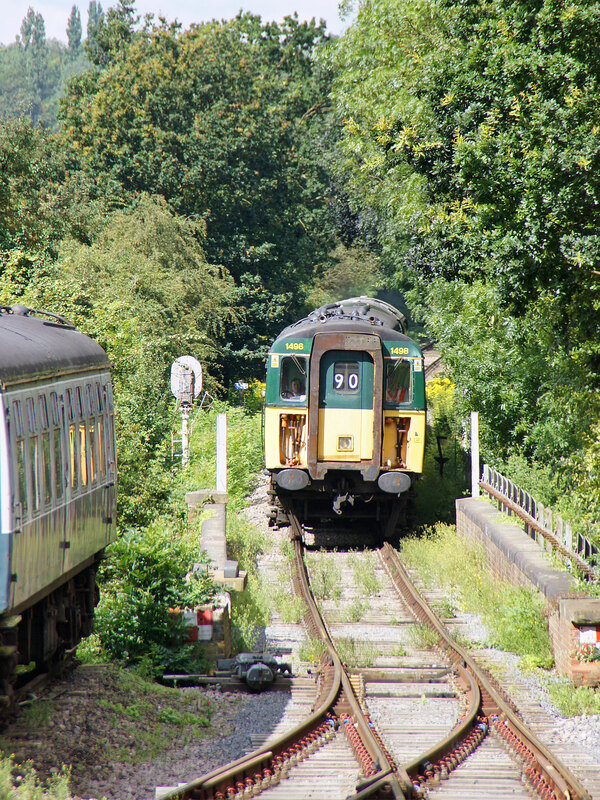 A public footpath leads from the church to a public crossing across the railway. The church lies about a mile west of Chipping Ongar town centre. 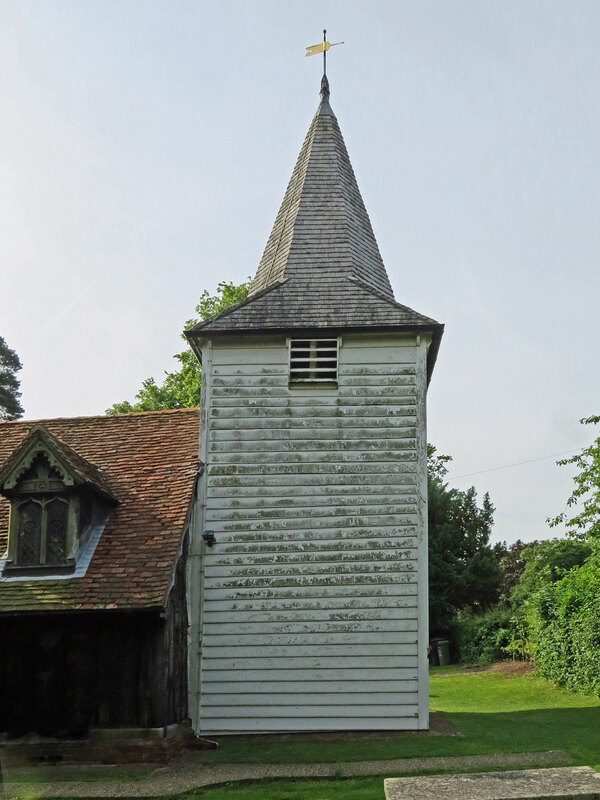 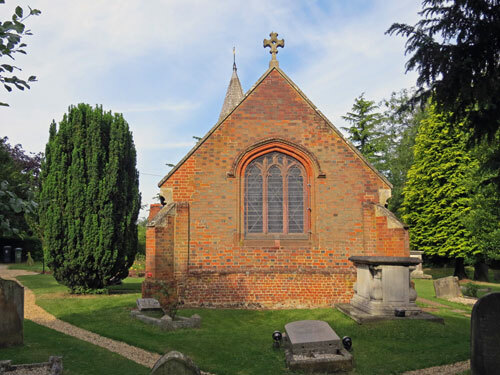 Its full title is The Church of St Andrew, Greensted-juxta-Ongar, renerally known just as Greensted Church. 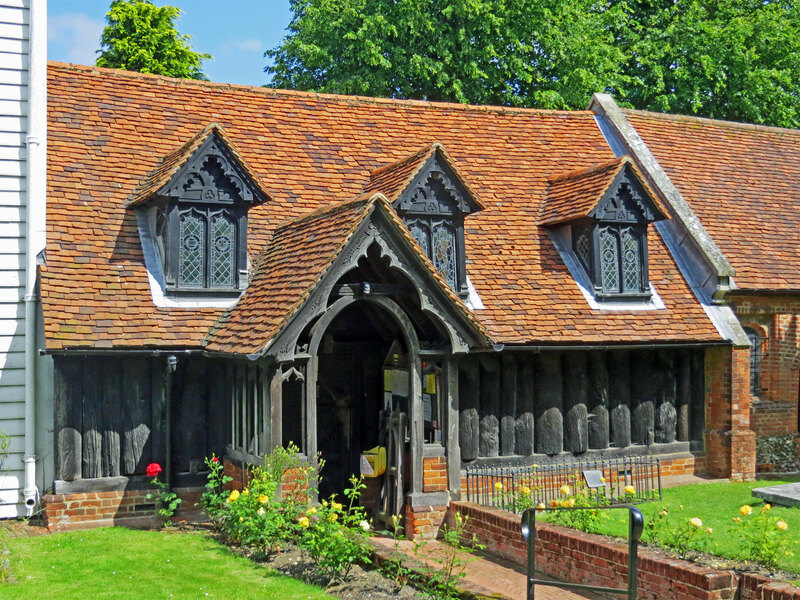 Greensted is still a functioning church and holds services every week. 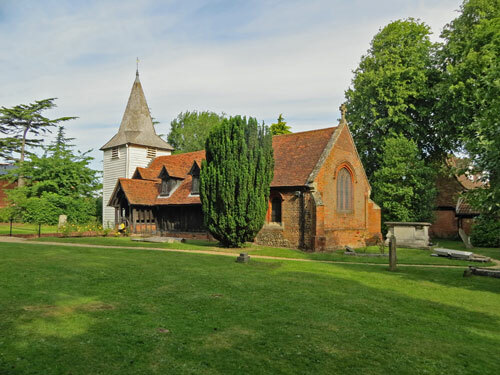 The church was featured on a British postage stamp issued in 1972. 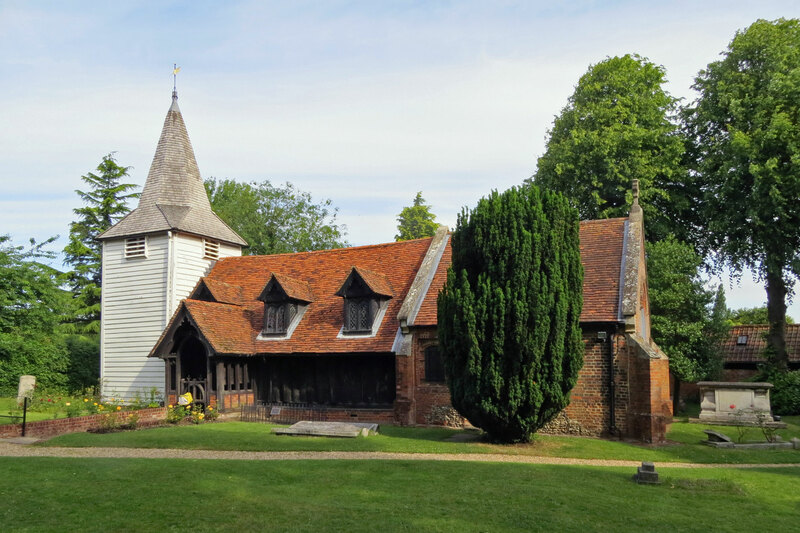 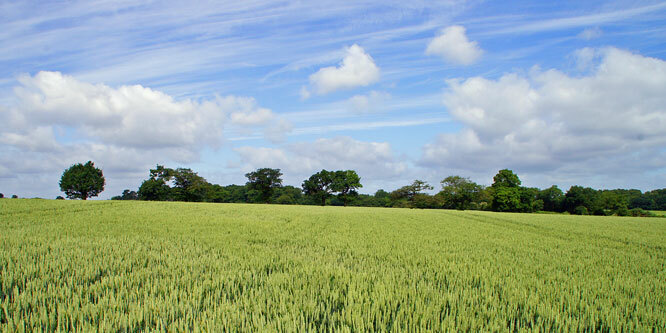 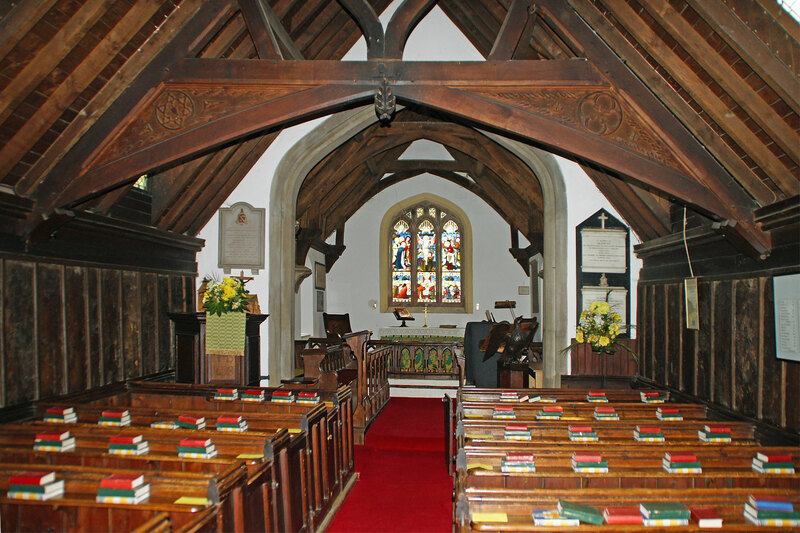 Greensted Church has stood in its idyllic setting for nearly 1200 years. Archaeological evidence suggests that, before there was a permanent structure, there may well have been another church, or a holy place, on the site for much longer, possibly dating back to around the 4th century. 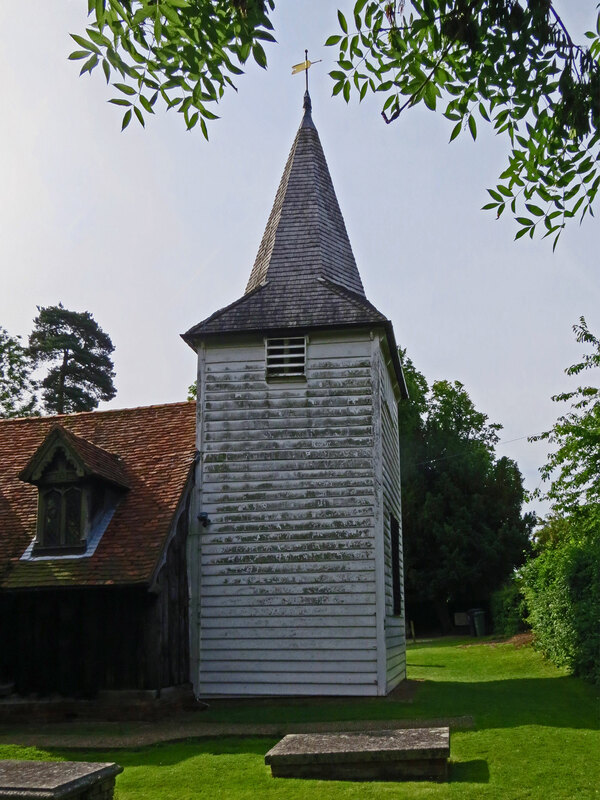 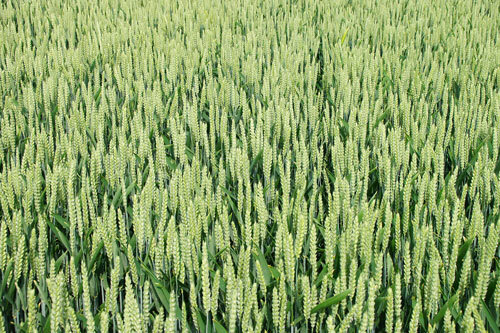 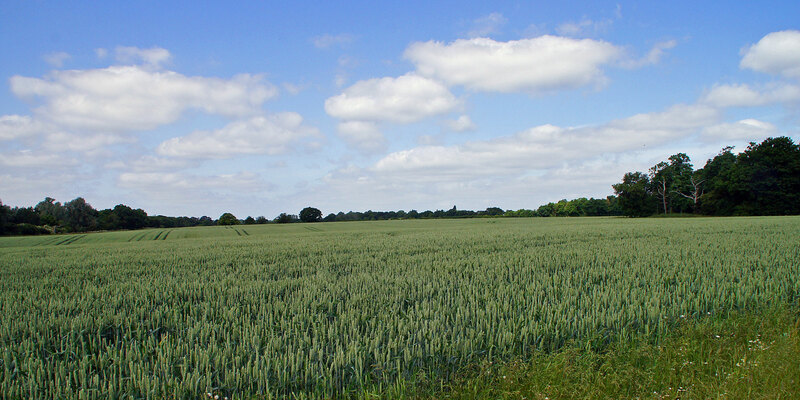 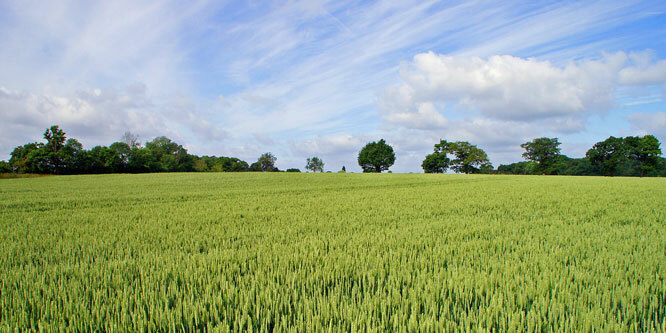 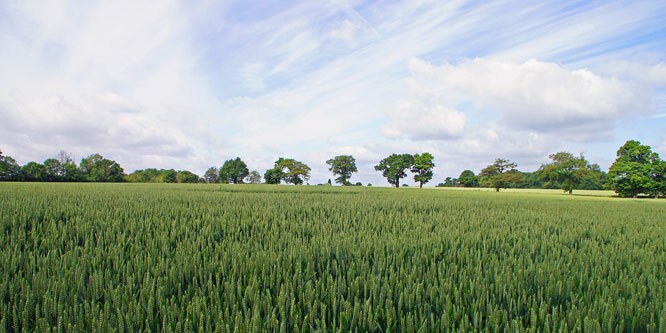 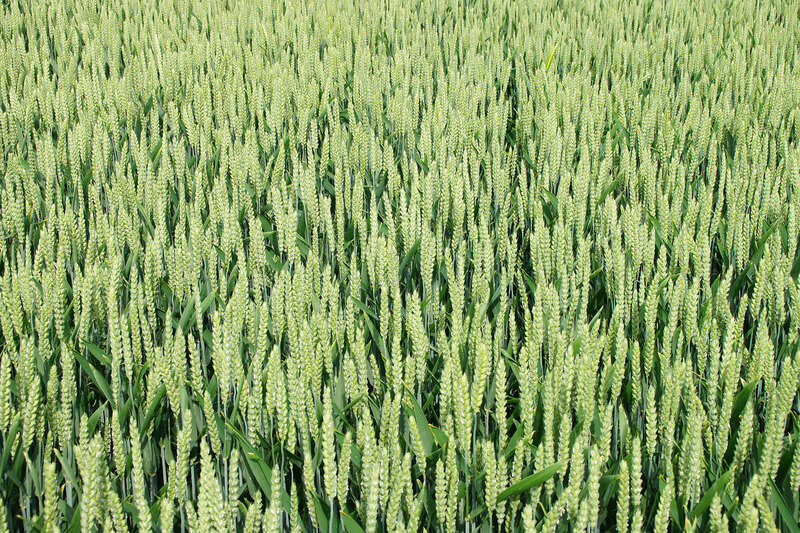 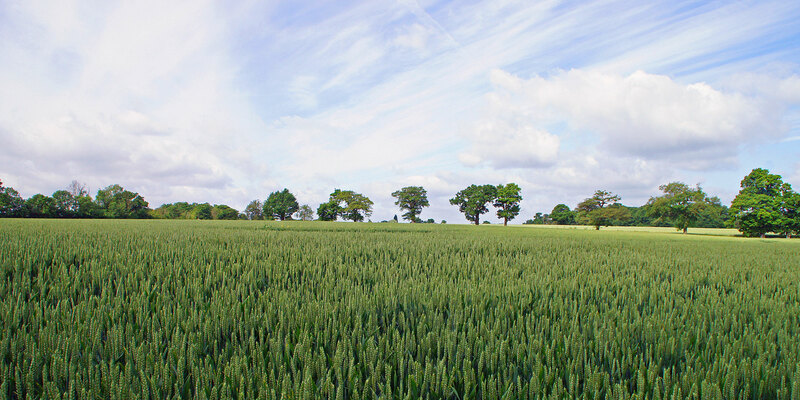 Construction of the first permanent church on this site is thought to have begun shortly after St Cedd began his conversion of the East Saxon people around 654. 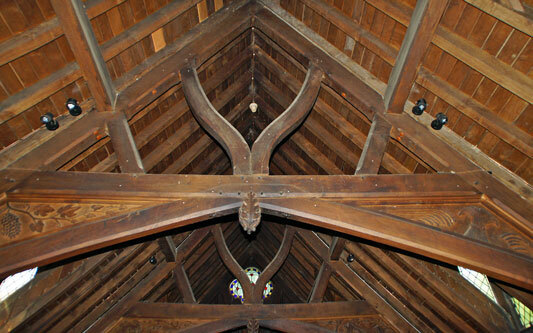 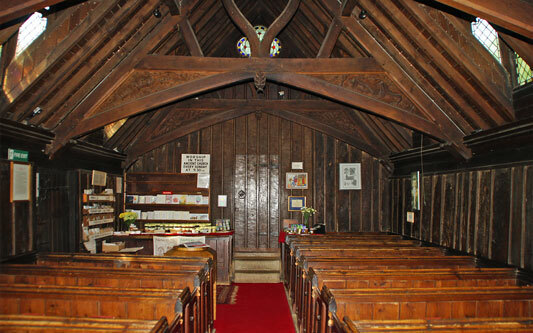 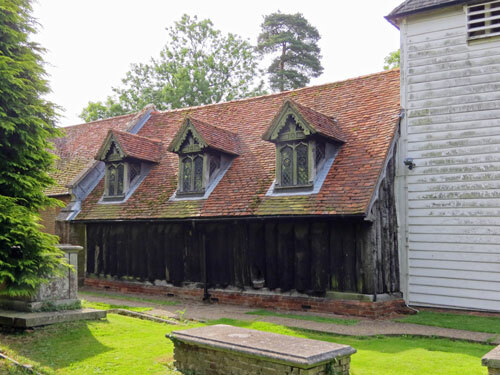 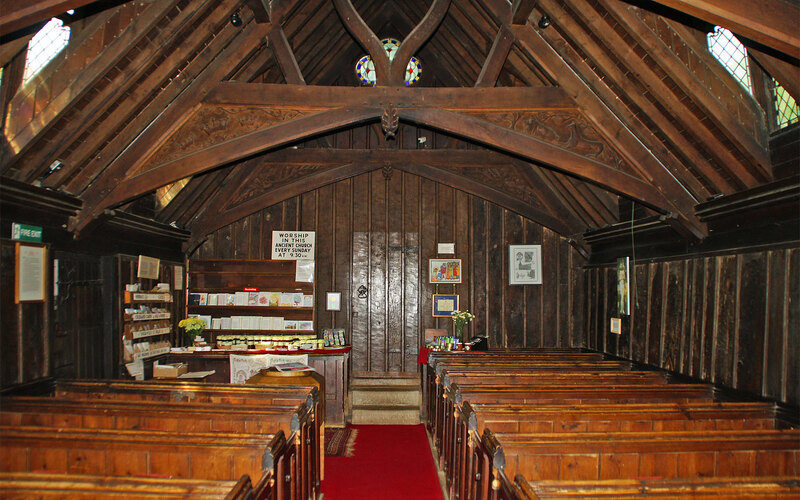 The archaeological remnants of two simple wooden buildings were discovered under the present chancel floor, and these are thought to have been built in the late sixth or early 7th century. The church's dedication to St Andrew suggests a Celtic foundation for the original sanctuary. 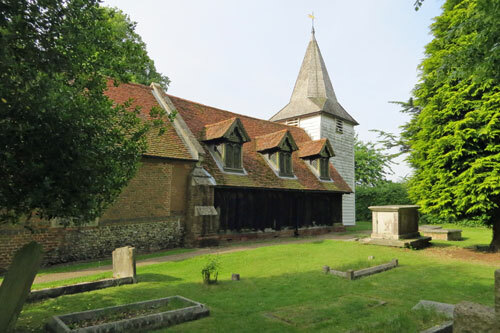 The body of King Edmund the Martyr of East Anglia (who was killed in 870, possibly at Hoxne) is said to have rested there in 1013, on its way to reburial at Bury St Edmunds. There are many tributes to St Edmund in the church itself. 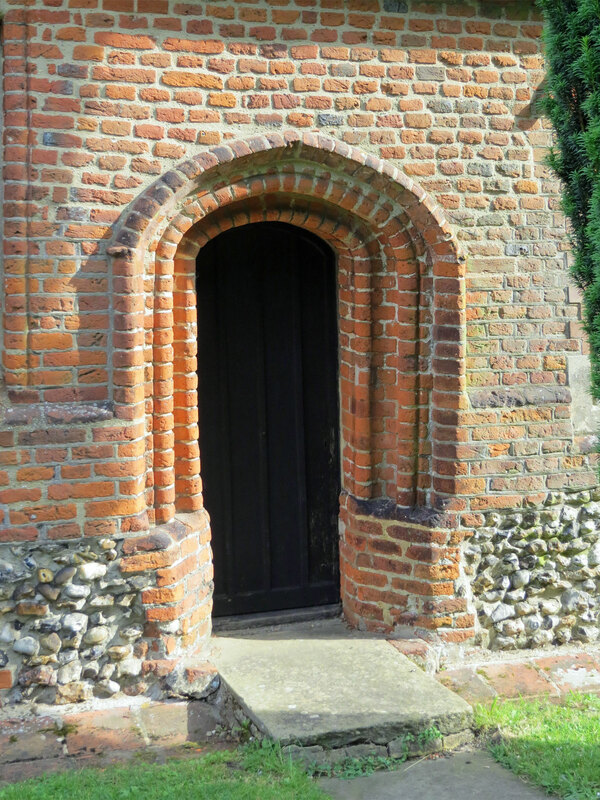 Near the porch, a large, flat, coped stone marks the resting place of an unknown early crusader who is said to have arrived, badly wounded, at the church and died there. The fact that it was made of stone, not a local material, and was placed against the south wall, suggests he was considered as a hero.